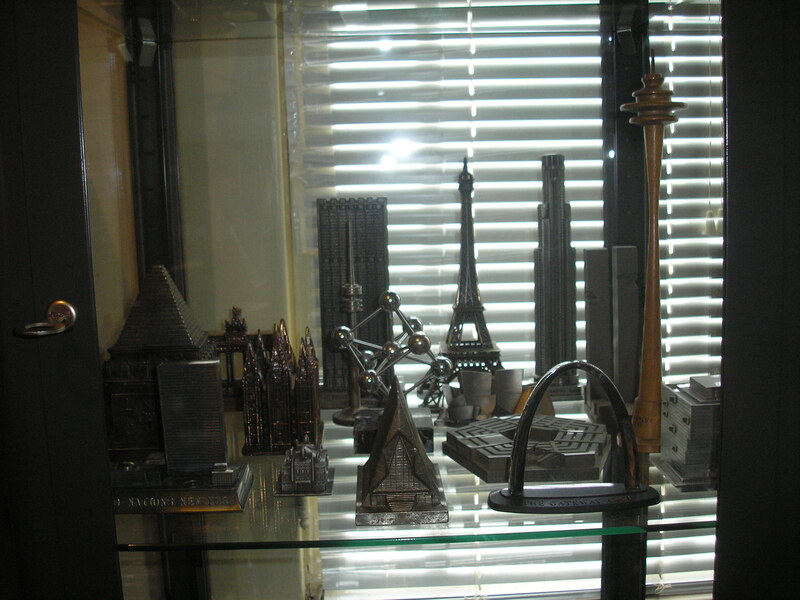 Since I’m interested in architecture — I collect souvenir buildings. 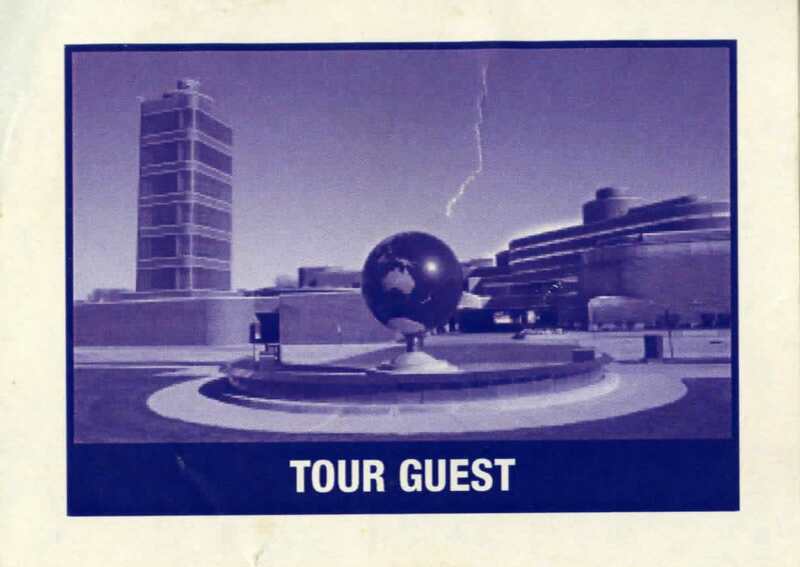 This is a souvenir building of the Johnson Wax Research Tower. My understanding is that these were given to selected guests at the ceremony commemorating the building’s opening. It’s a cigarette lighter too. 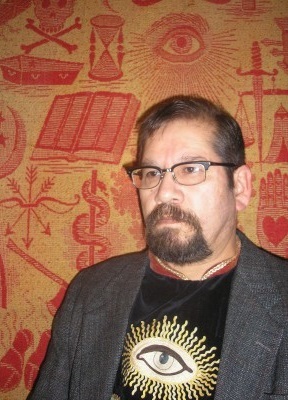 Here I am at the Unitarian Meeting House in Madison, Wisconsin. 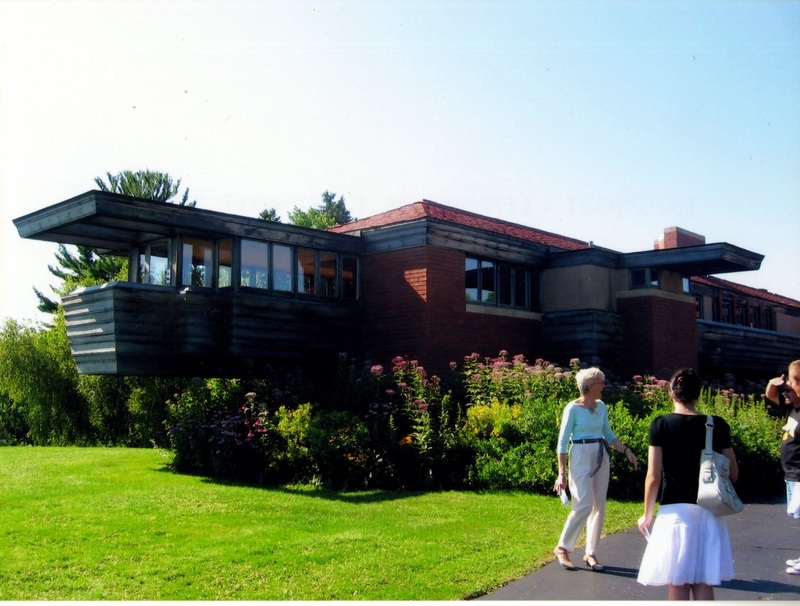 This is a church designed by Frank Lloyd Wright. Waterfall at Taliesin. 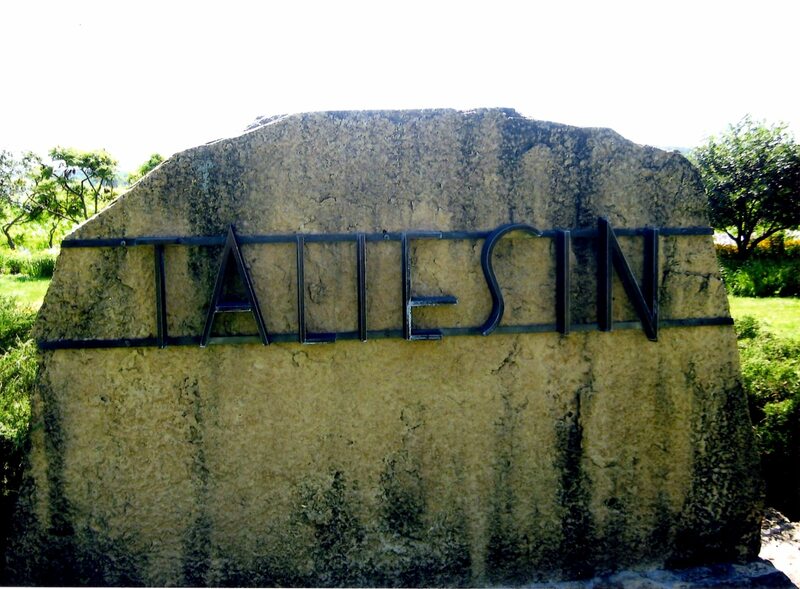 When you go to Taliesin you park at the visitor center and then take a small shuttle bus to Taliesin. The shuttle bus travels by the waterfall. 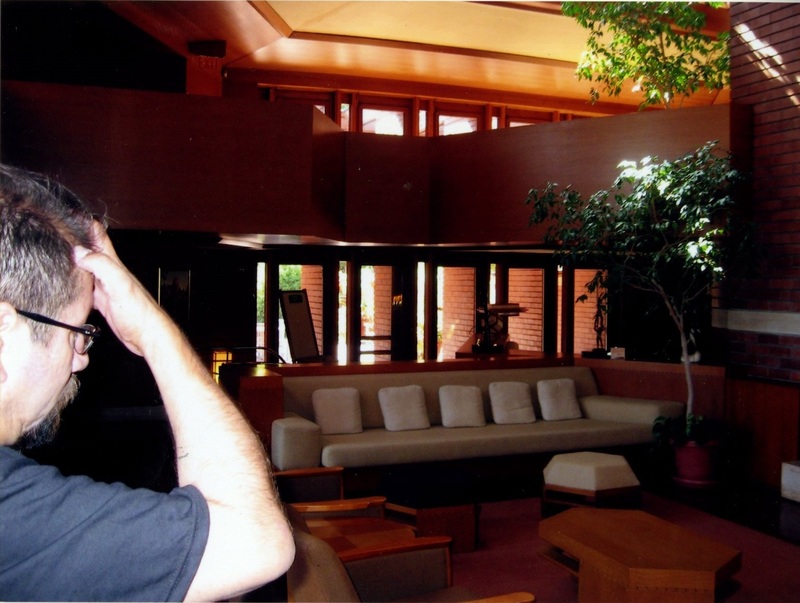 I’m at Taliesin, Frank Lloyd Wright’s home in Spring Green, Wisconsin. 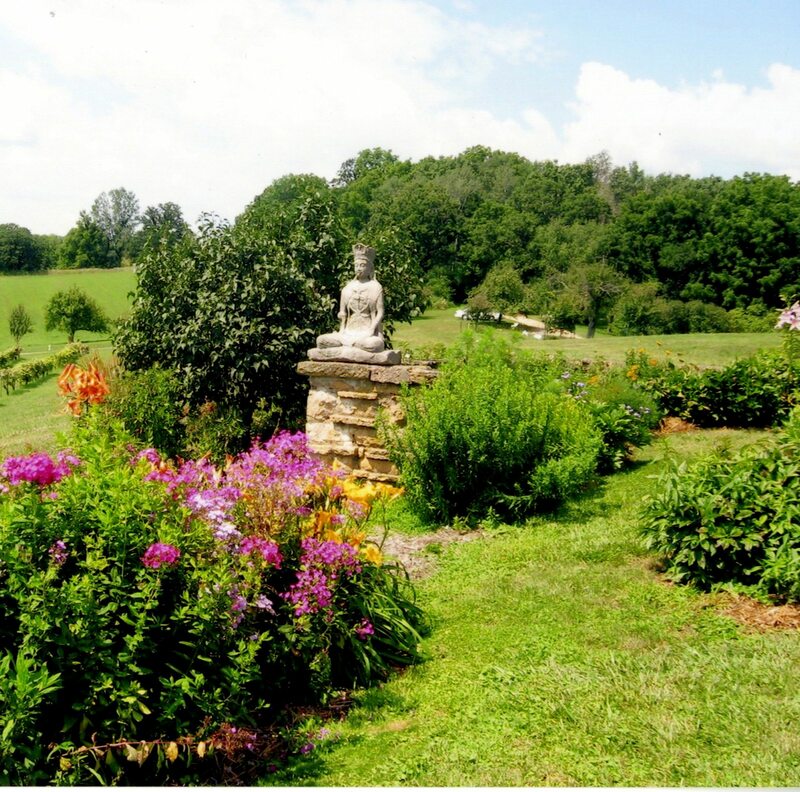 This is one of the views — looking out from the house — to the surrounding landscape. It’s very pretty. Here’s a picture I took of Taliesin. 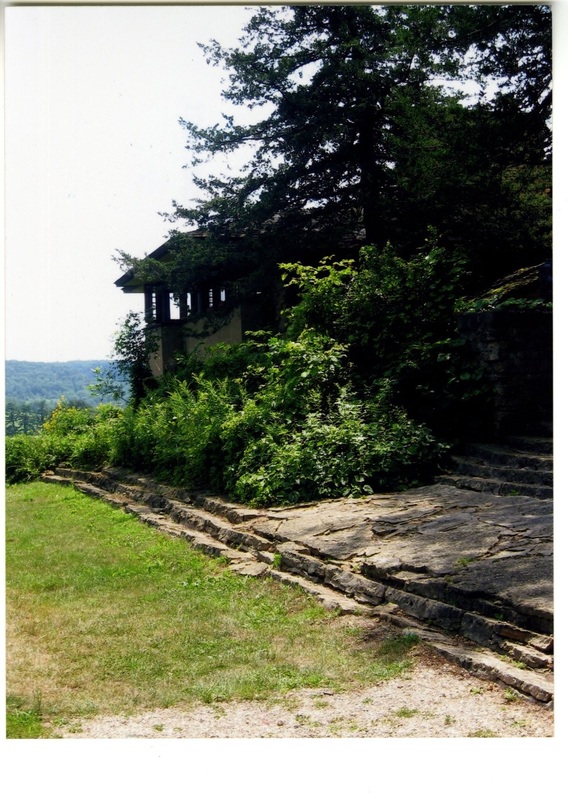 While at Taliesin I thought it had an overgrown look. I’m not sure it’s deliberate. It’s a postcard. 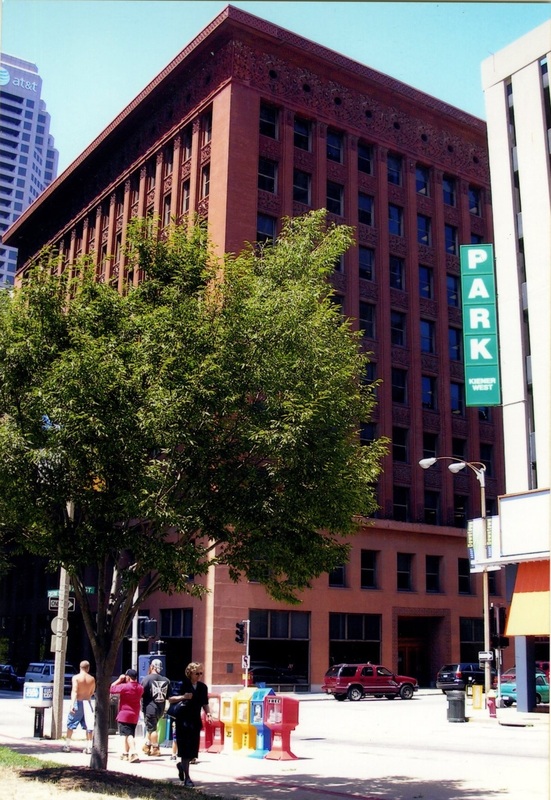 Frank Lloyd Wright’s Larkin Building is the structure on the far right — in front of the factory. 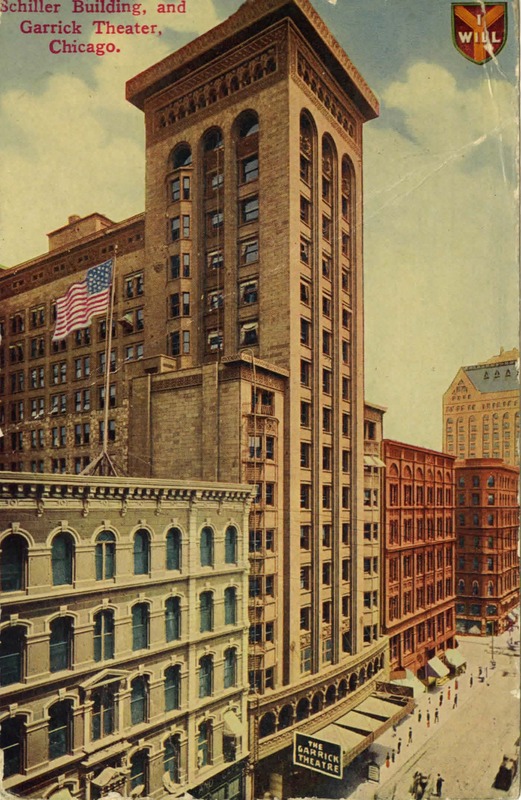 The Larkin Building was demolished around 1950. 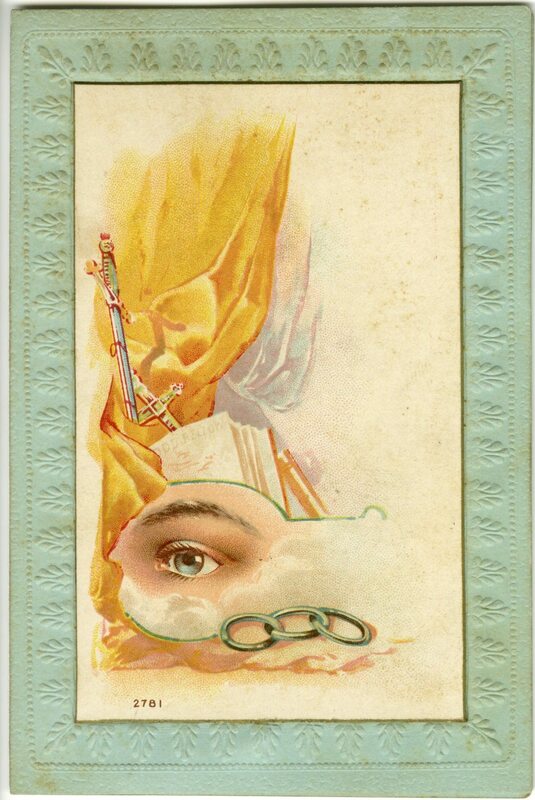 I bought this oversize postcard at a “paper and postcard” show in Pasadena, CA. 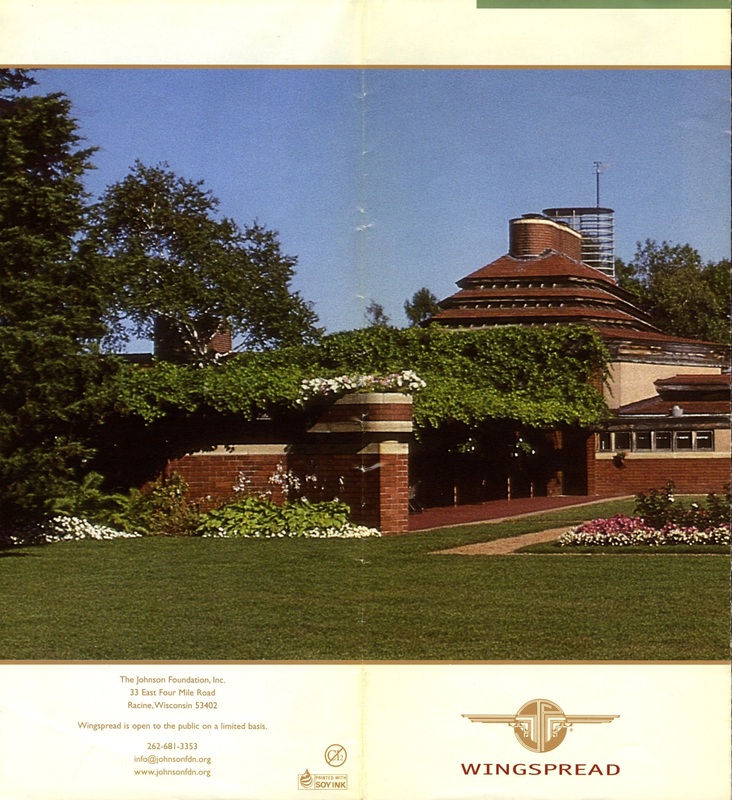 I don’t have any photos from Wingspread but I do have this brochure. Two things I remember about Wingspread. 1) I went with a friend and we arrived about 10 minutes before the place opened. 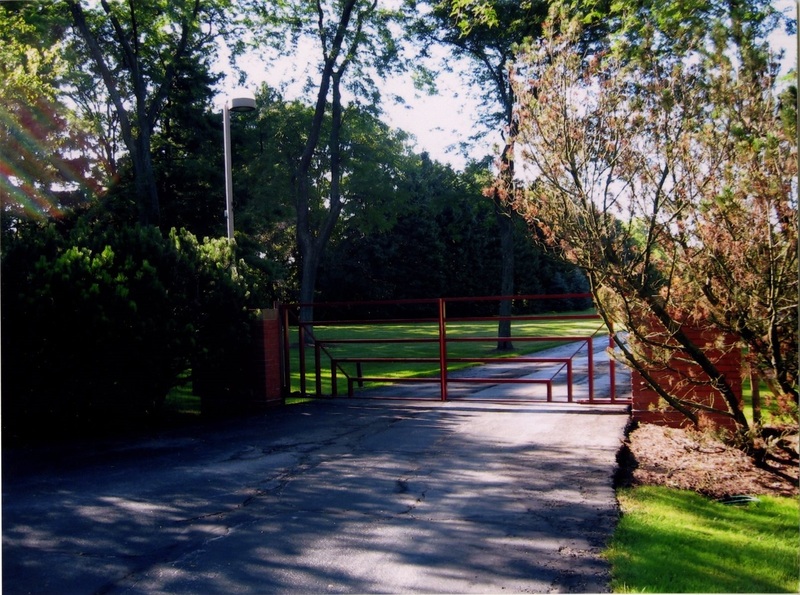 There was a large gate across the driveway which prevented us from driving in so we decided to wait in front of the gate but then a voice came over a speaker and told us we could not wait there and would have to come back when the venue opened. We found that weird. 2) I had an arguement with the person I went with so during the tour we didn’t speak to each and tried to avoid each other. Sometimes, traveling with other people is difficult. Wingspread was built for Herbert F. Johnson of Johnson & Johnson back in 1937. 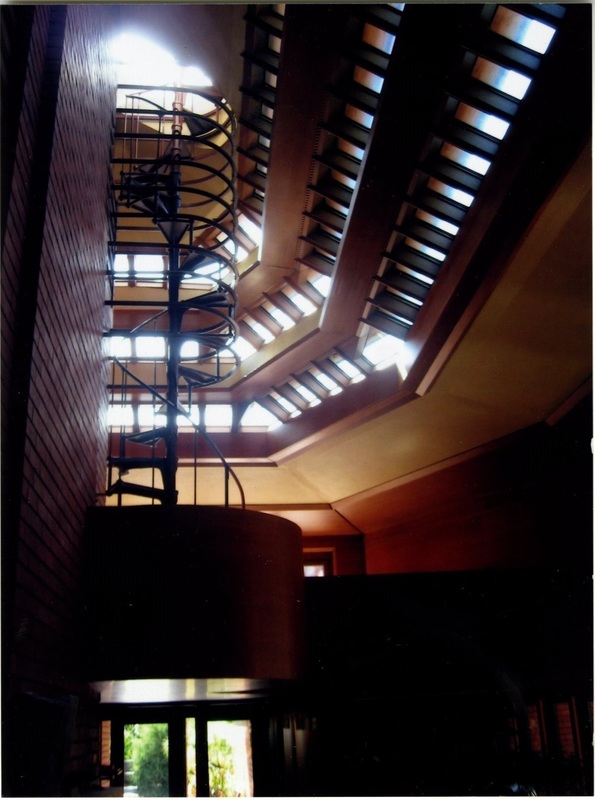 The architect for Wingspread was Frank Lloyd Wright. I found my pictures from that day! This is the gate we couldn’t park in front of. It’s not like there was a huge line. We were the only ones there. Uh, next time cut us some slack Wingspread. Going to Wingspread was an afterthought. It wasn’t a place I had ever planned on going to. Here’s a shot from the lawn with our tour guide giving her spiel. This is the main room at Wingspread. The room is very vertical and it has a compact fireplace considering the size of the room. This staircase is behind the fireplace. Climbing up and looking around the room was fun. I’m still not quite sure why this lookout is located in the living room though. As this point, I was pretty much done with the tour. 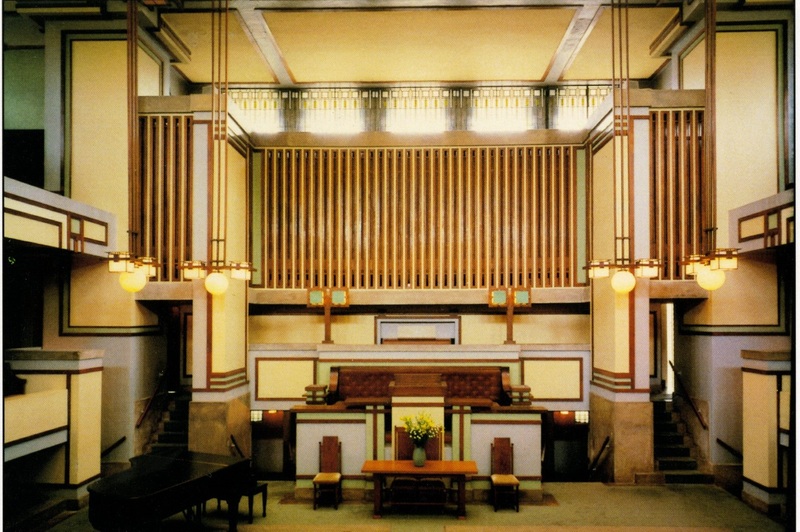 Unity Temple. 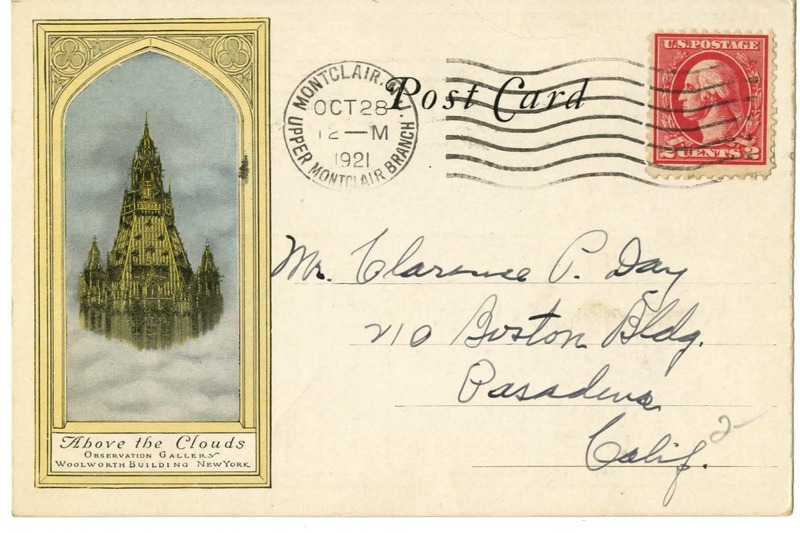 I was in Oak Park at the post office sending post cards and I asked the clerk where Unity Temple was. 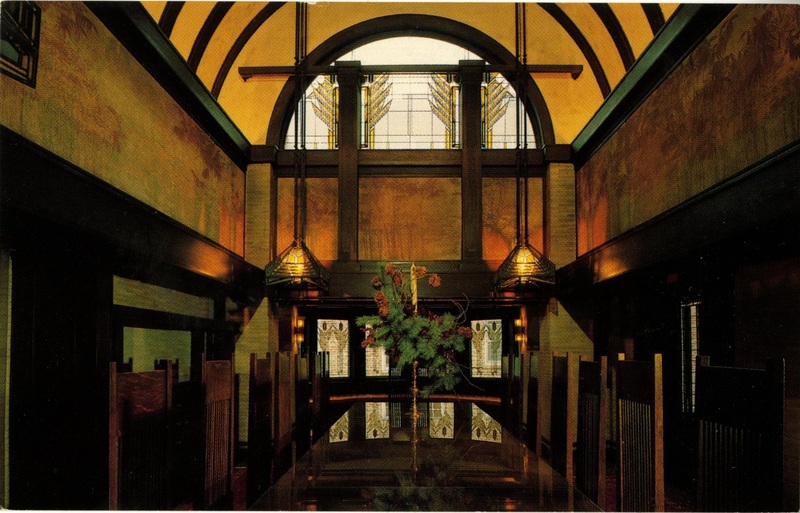 (Unity Temple was designed by Frank Lloyd Wright.) 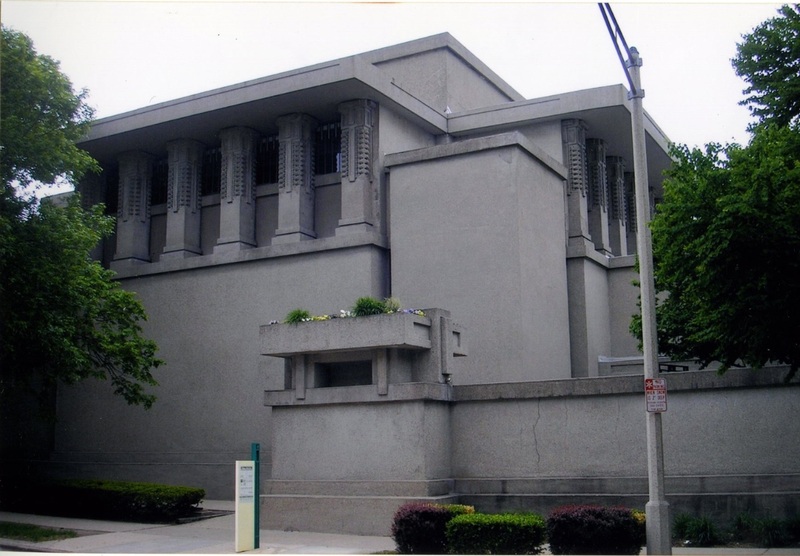 He looked at me and said, “It’s right across the street.” Unity Temple is in scale with the rest of the buildings on the street and doesn’t call attention to itself. It’s possible that I’m an idiot and not always aware of my surroundings too. 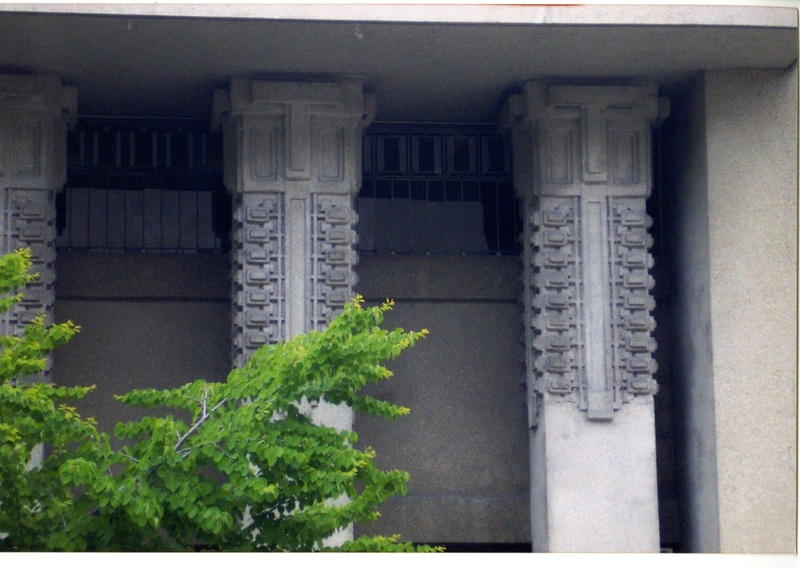 The columns remind me of the Hollyhock House. Dana-Thomas House. 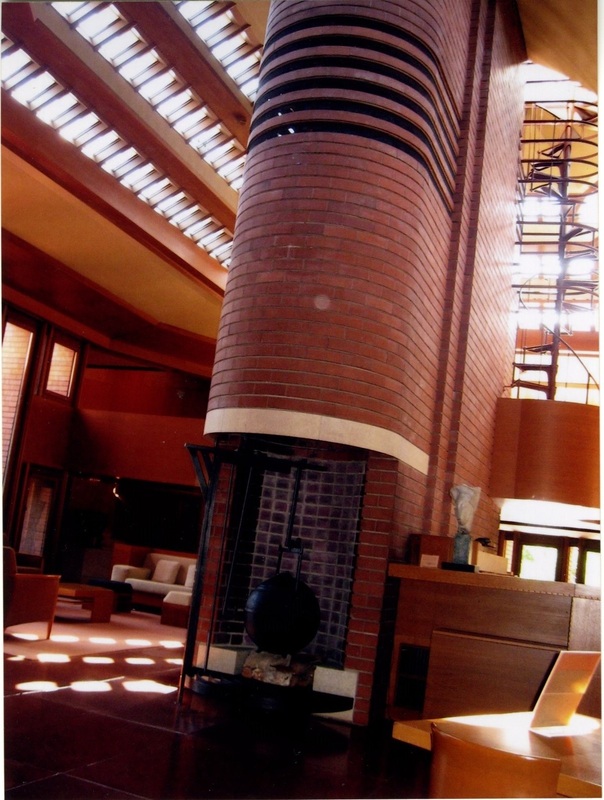 Architect: Frank Lloyd Wright. I went to this house so long ago (20 years?) that I’m amazed I still have these two postcards from my visit. (See the other one below.) The photographer of this postcard is Dave Beatty. 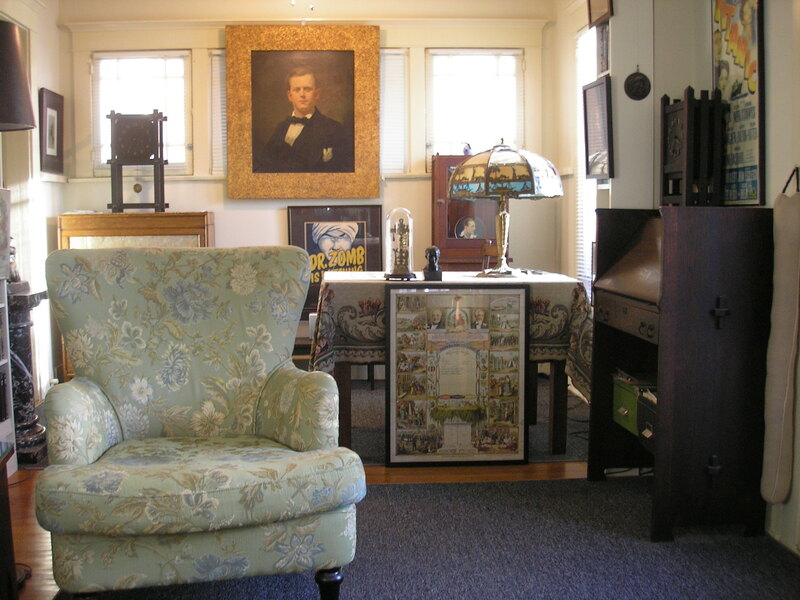 This is an interior photo of the Dana-Thomas House. The house was erected in 1904 and it is located in Springfield, Illinois. 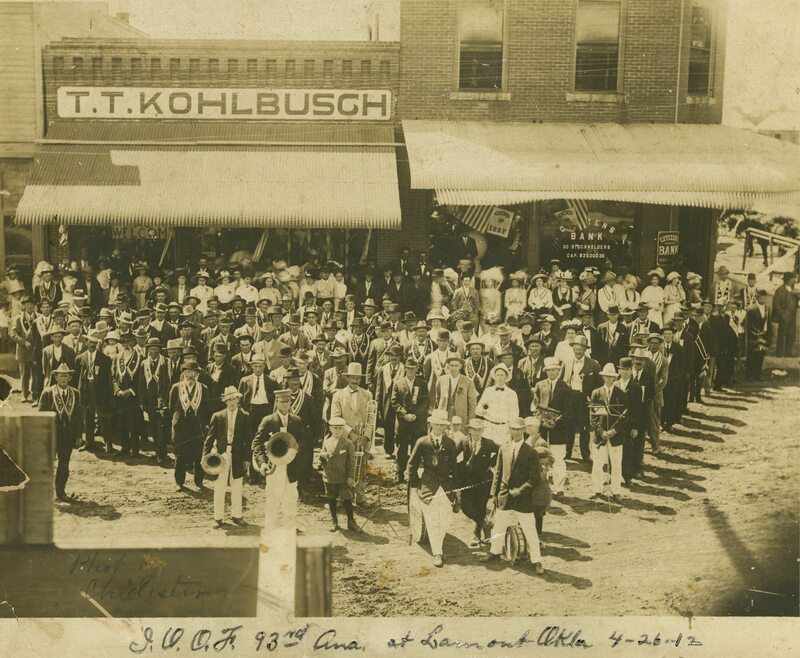 The photographer of this postcard is Mick Cochran. 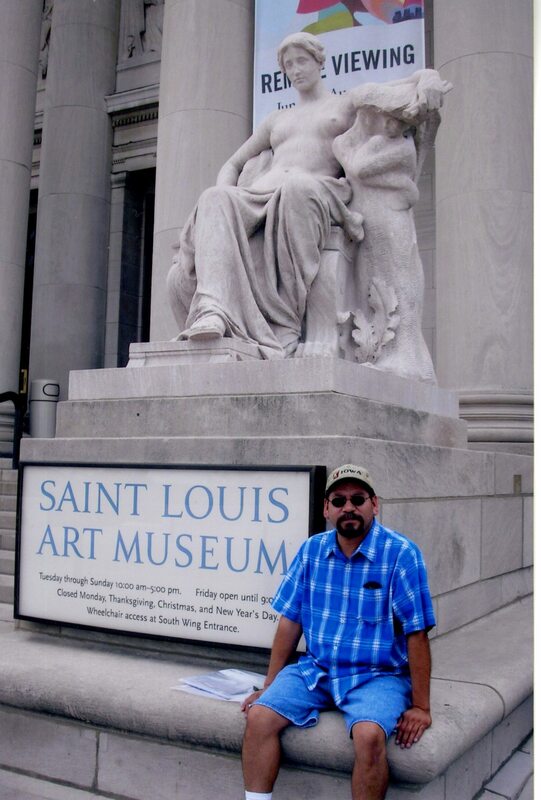 I’m in front of the St. Louis Art Museum. I traveled there because not only was the building designed by Cass Gilbert but it was used for exhibits at the 1904 World’s Fair. 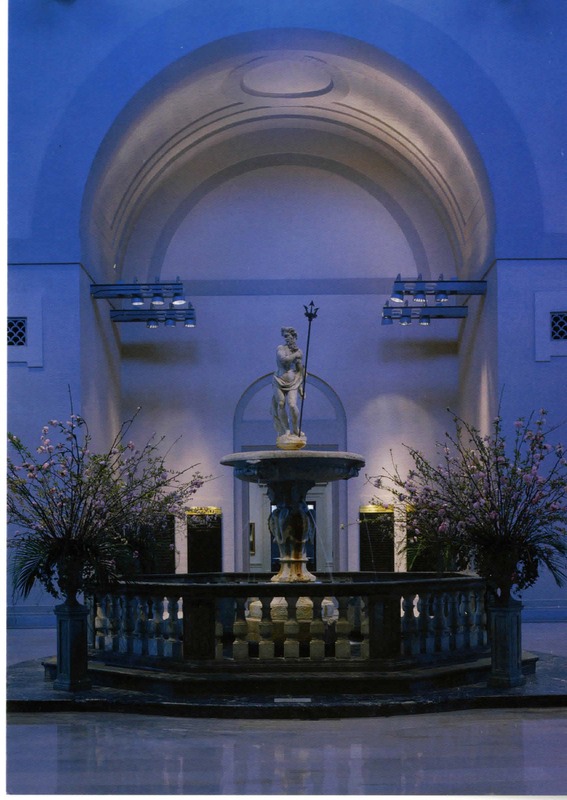 This is a postcard I bought at the St.Louis Art Museum regarding their sculpture hall. I like sculpture and I like Neptune so I bought the card. 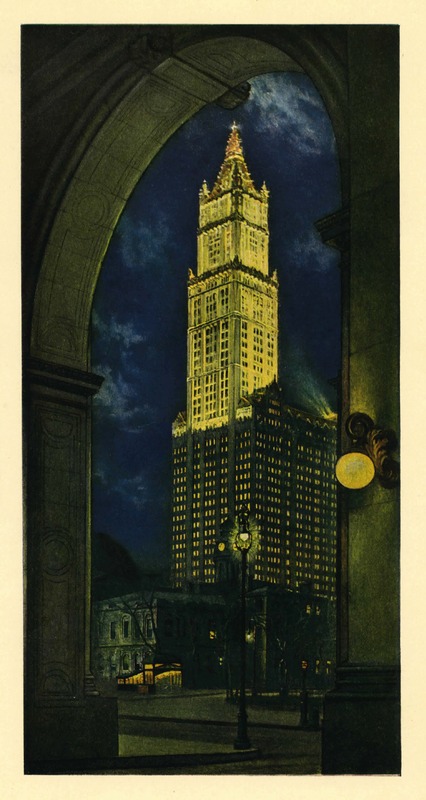 The Woolworth Building. It’s an amazing structure constructed between 1910-1913. I found that beautiful graphic in this publication. 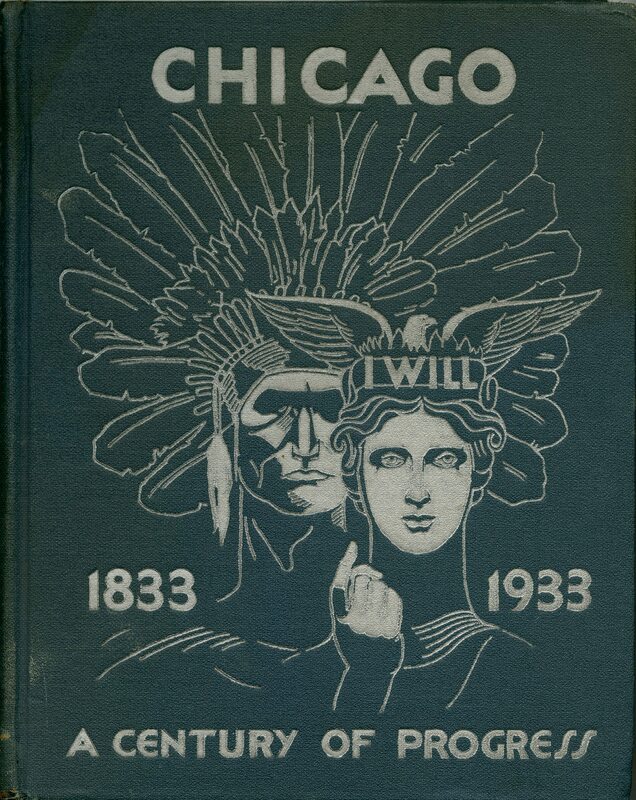 It appears to be something tourists could buy and was published in 1916. This is a postcard I found (bought). They’re selling the observation gallery as being “above the clouds.” How totally cool. This is the reverse side of the card. 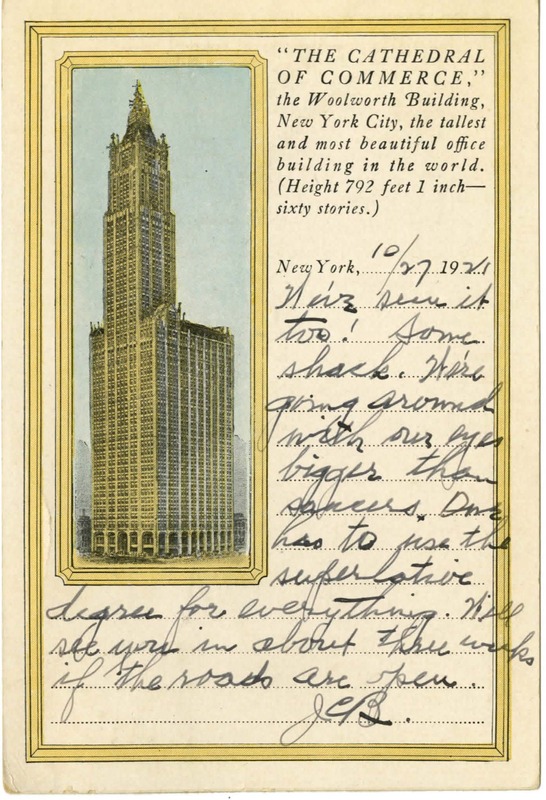 I enjoy reading what others have to say on old postcards. It’s like having a “party line” into the past. 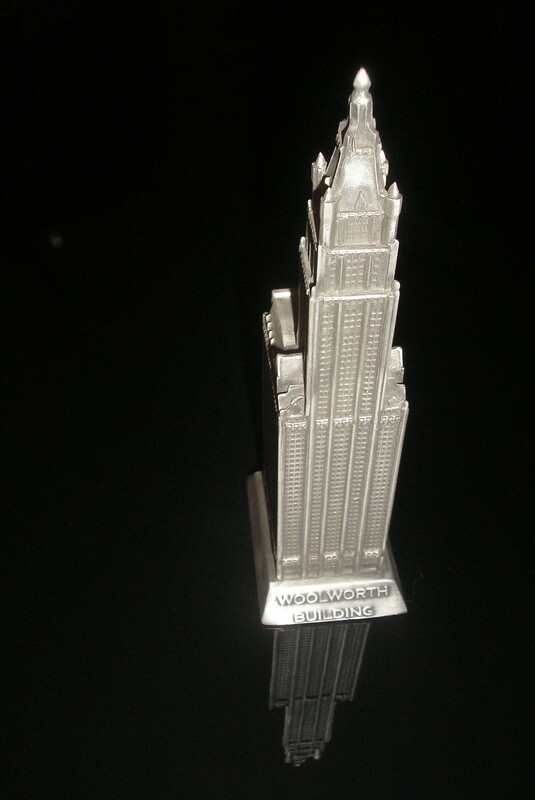 The Woolworth Building is part of my slightly geeky collection. This version of the building was made by Microcosms. 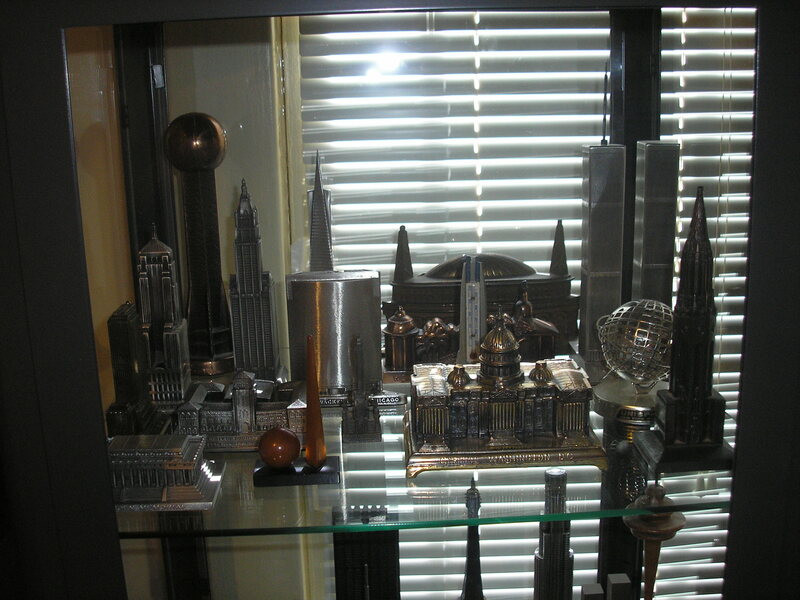 The guy who ran that company made some terrific souvenir buildings. 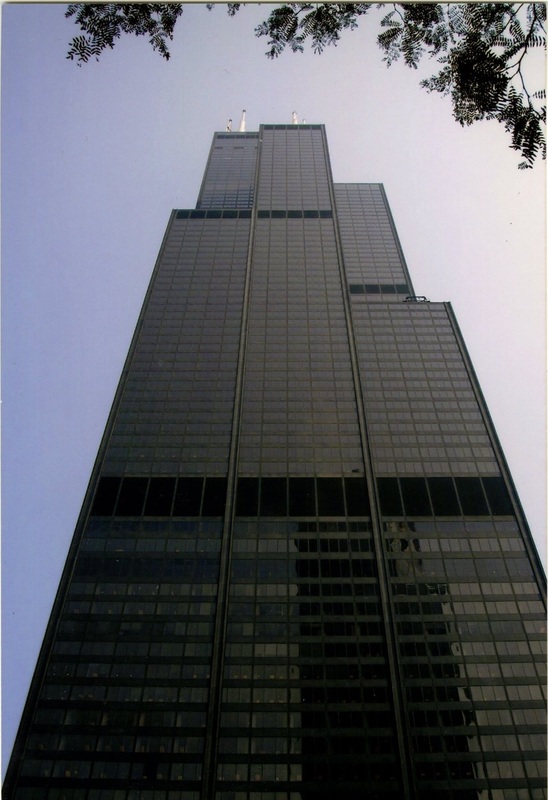 I went to the Sears Tower Skydeck but I can only find two photos from the visit and one is of an exhibit they had concerning Chicago architecture. I’ve never been a big fan of the International Style but I find the Sears Tower pretty amazing. This is the other photo I found. It’s really hard getting a good picture of the Sears Tower from the street but this is a good shot. 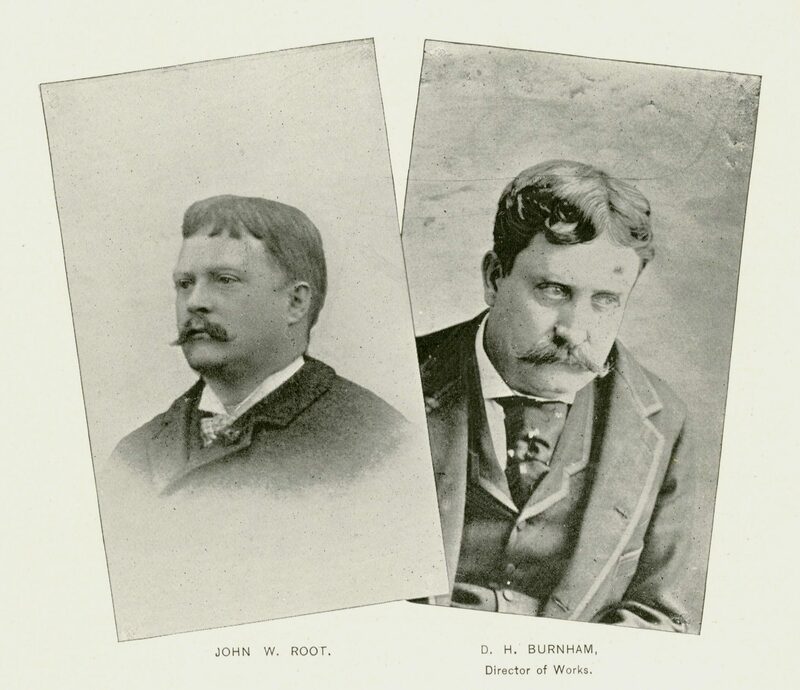 The Skydeck exhibit had a section on Burnham and Root. 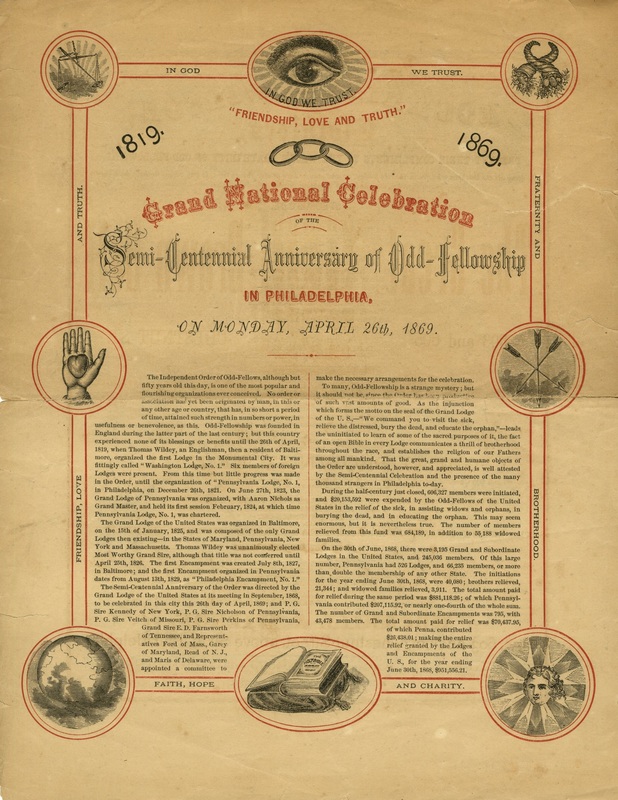 This image is from Memorial of the World’s Columbian Exposition by the Joint Committee on Ceremonies. It was published in 1893. Burnham and Root’s two most famous buildings in Chicago are probably The Rookery Building (1885-88) above and The Monadnock Block (1889-92). I’ve been to both of them. This is a well composed photograph of Burnham and Root. 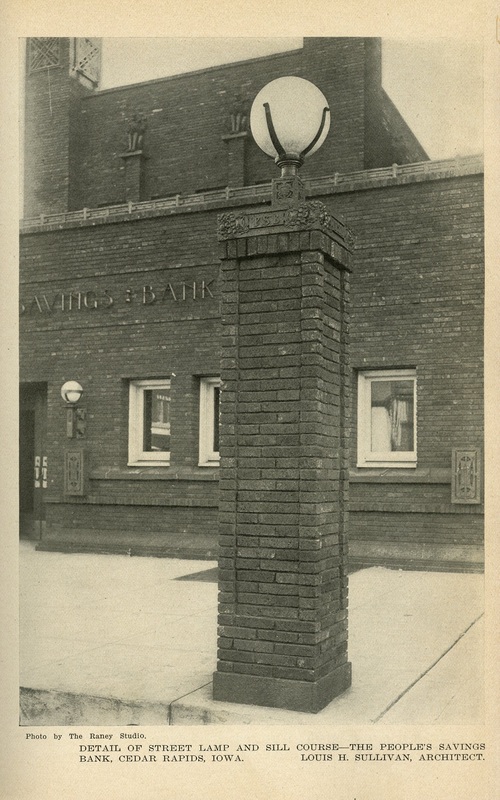 Both of these photos are from a book called The Meanings of Architecture: Buildings and Writings by John Wellborn Root. It was edited by Donald Hoffmann and published in 1967. 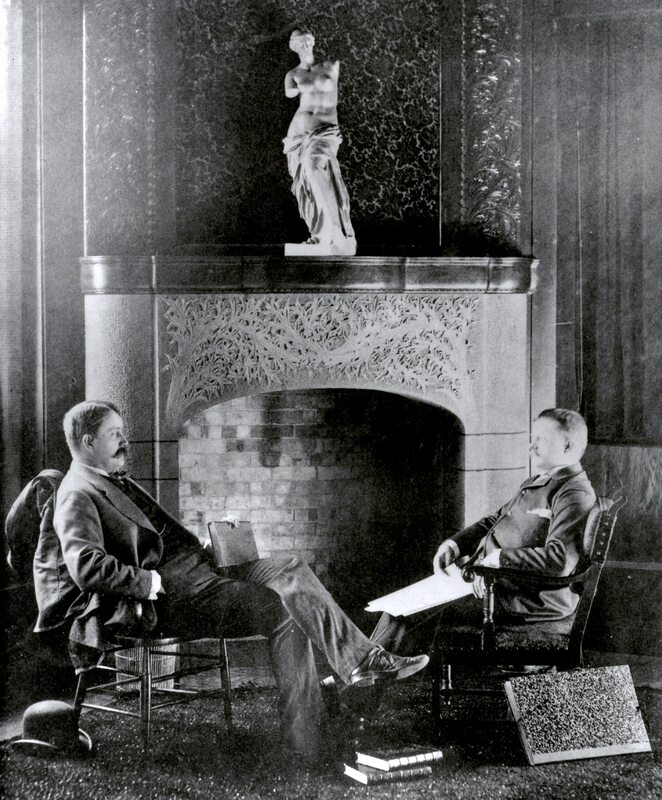 According to the book the portrait was originally published in Inland Architect. After Roots untimely death in 1891, Daniel Burnham went on to design one of New York City’s most famous Buildings: The Flatiron Building. 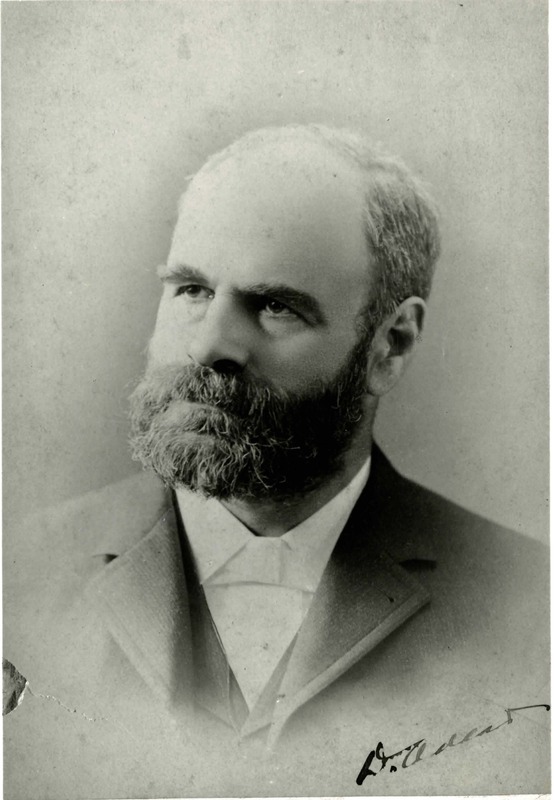 This image is circa 1902. When I visited the Flatiron Building I found that even though it’s a large building it didn’t seem overwhelming or oppressive. As a matter of fact, it seemed very light. Maybe, because of the shape and scale? This is from Architectural Record. It’s from January 1912. 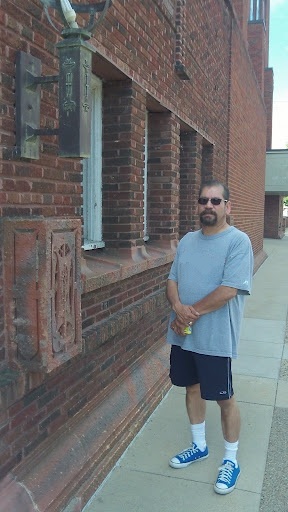 Me in front of the People’s Savings Bank in Cedar Rapids, IA. 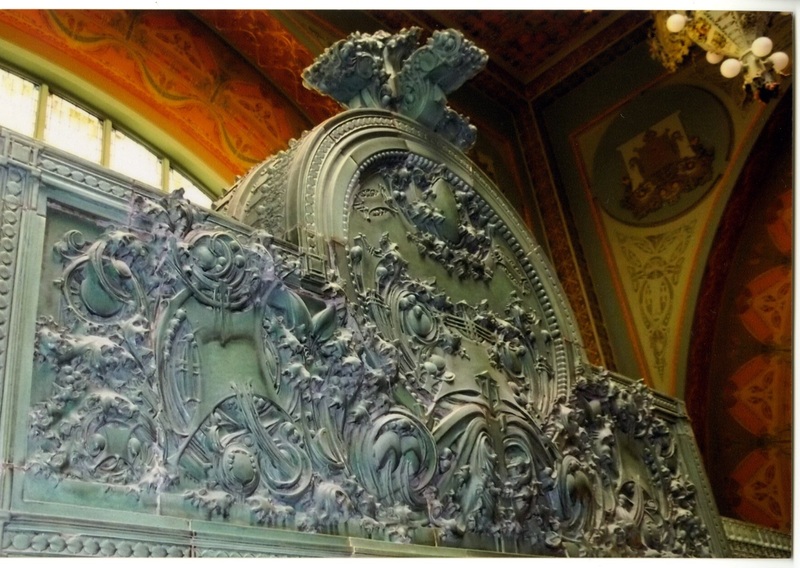 The bank was designed by the sensitive architect Louis Sullivan. 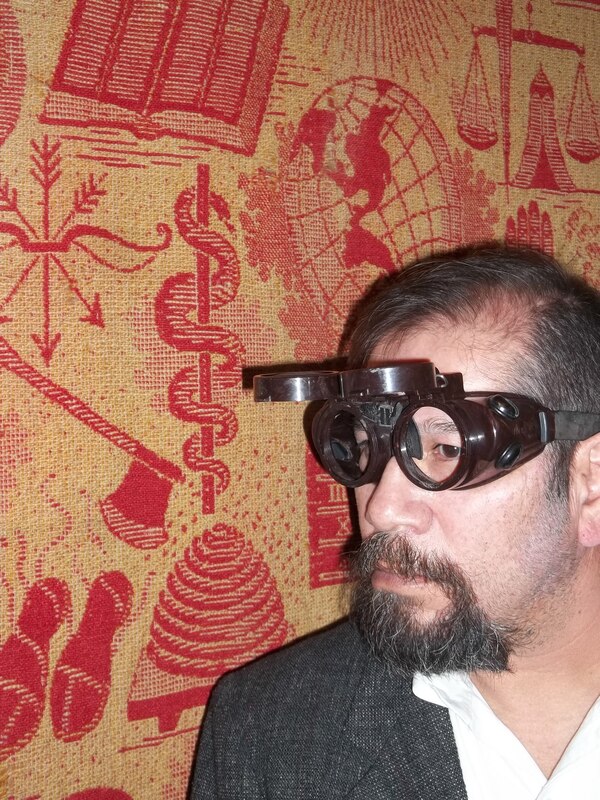 This picture of me is not so sensitive. I look like I’ve got a bad attitude and just got out of prison. Thankfully, my shoes make me look less menacing. 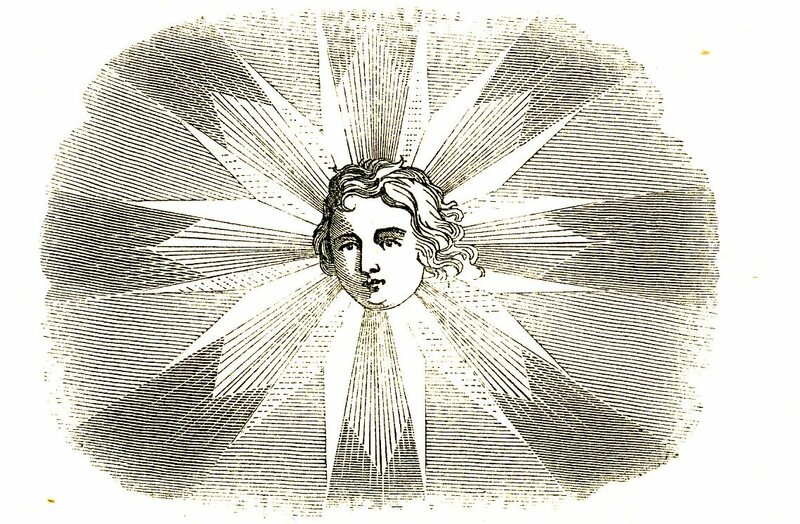 This image is from the same journal. These street lamps are no longer there. That’s a shame. 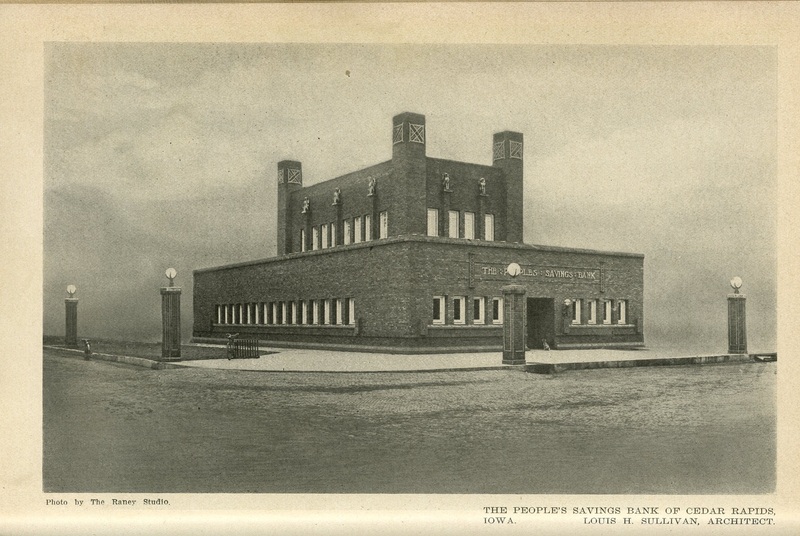 The name of the article is The People’s Savings Bank of Cedar Rapids, Iowa — Louis H. Sullivan: Architect by Montgomery Schuyler. 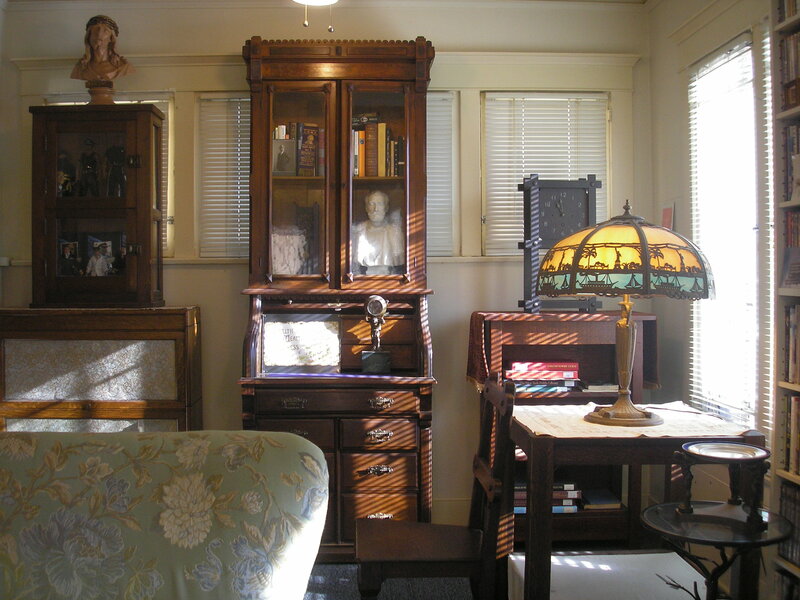 There are many interior photographs within the article. It’s a long article too: 12 pages from 44-56. 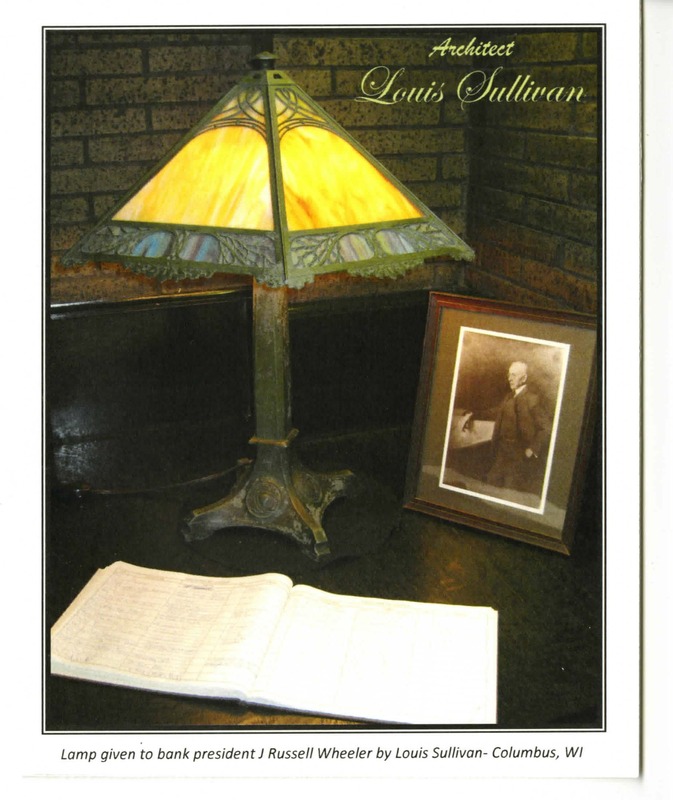 This is Louis Sullivan. I bought this photograph, years ago, from the Art Institute for $35. (I hung it above my desk so I could look at him every day.) 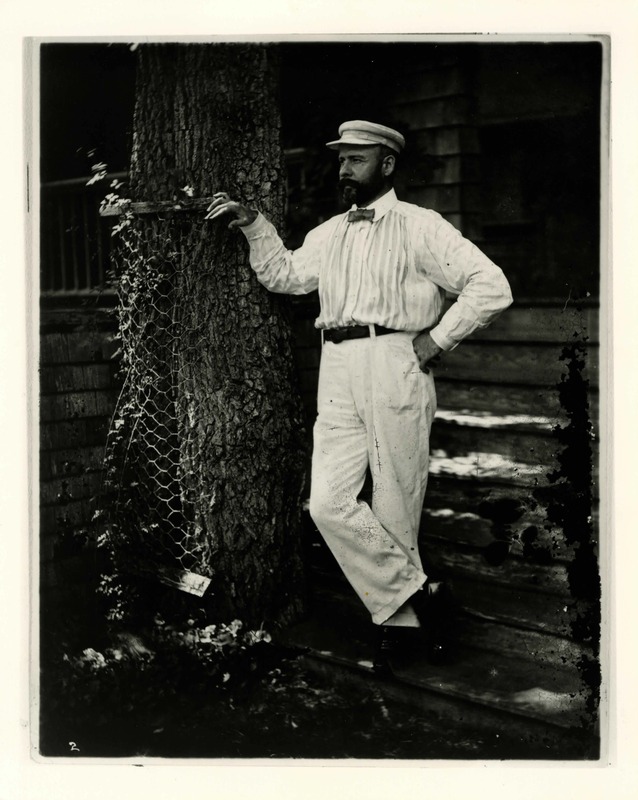 On the back of the photo it says that if the photo is published it must contain the following information: Louis H. Sullivan, Architect; full length portrait, leaning on tree. Photograph c 1995, The Art Institute of Chicago, All Rights Reserved. 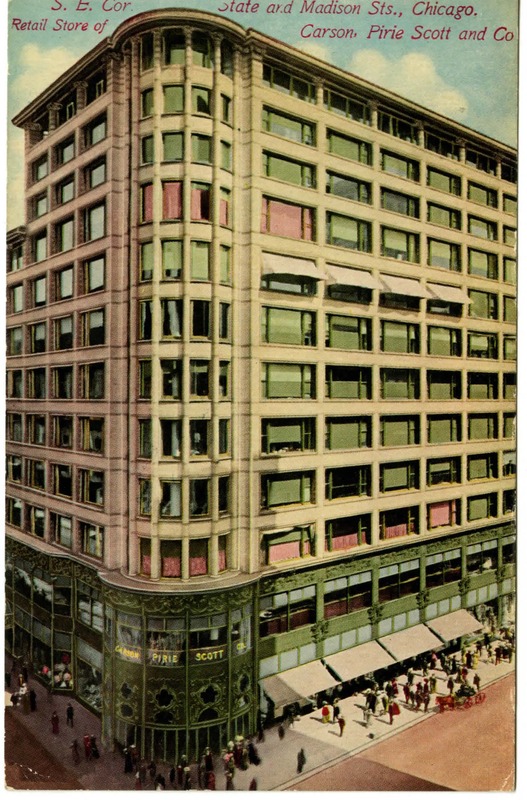 Sullivan designed the Carson Pirie Scott Building. It was erected in 1899. I have been there a number of times. The first time I went it was still being used as a department store. 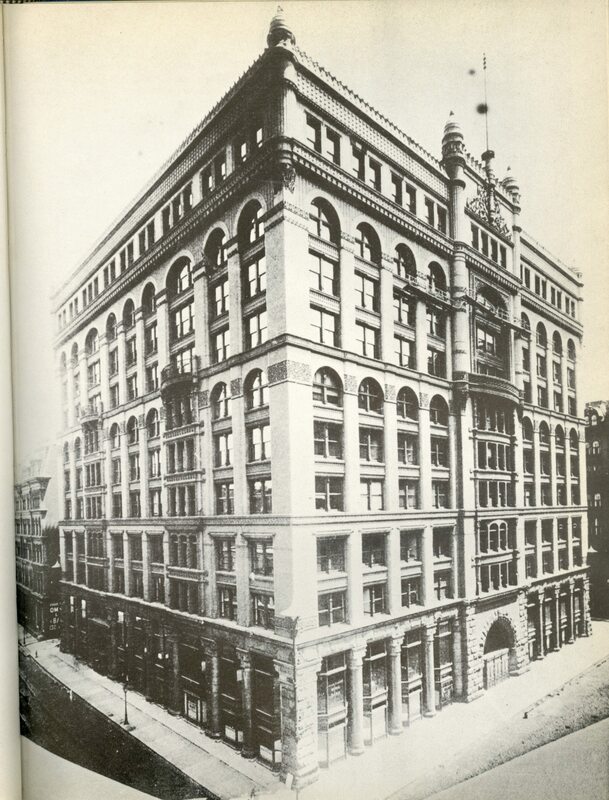 The Schiller Building was constructed between 1890-92. It was designed in collaboration with his partner Dankmar Adler. It was demolished in 1961. 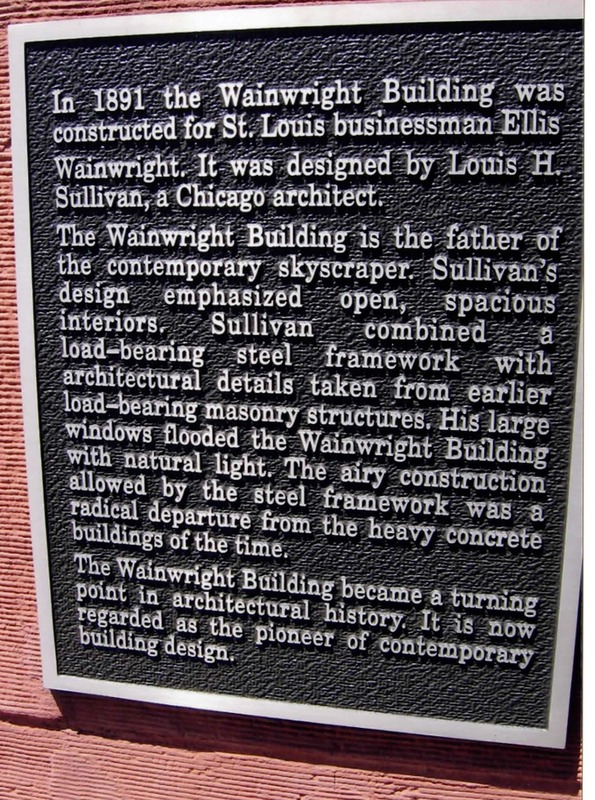 At Adler & Sullivan’s Wainwright Building in St. Louis, Mo. 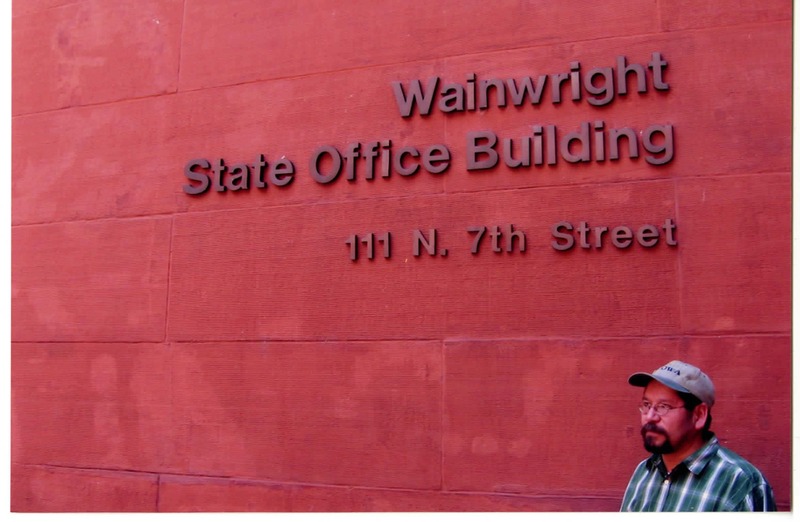 This is what the Wainwright looks like from the sidewalk. Some “top of the building” detail. This is stone detail from the entrance. I don’t like this picture of me because I look fat but I like the stone detail. The tablet says it better than I could. 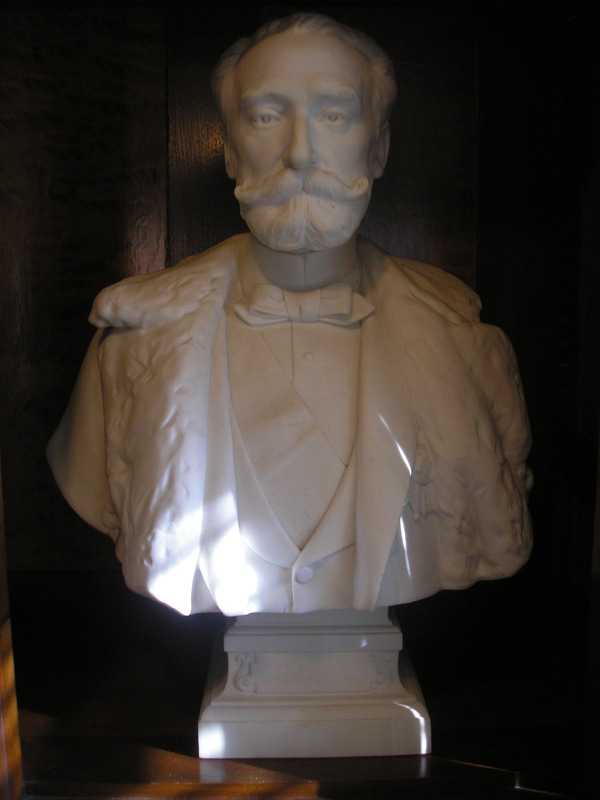 Dankmar Adler. The other part of the architectural firm Adler & Sullivan. photograph c 1995, The Art Institute of Chicago, All Rights Reserved. 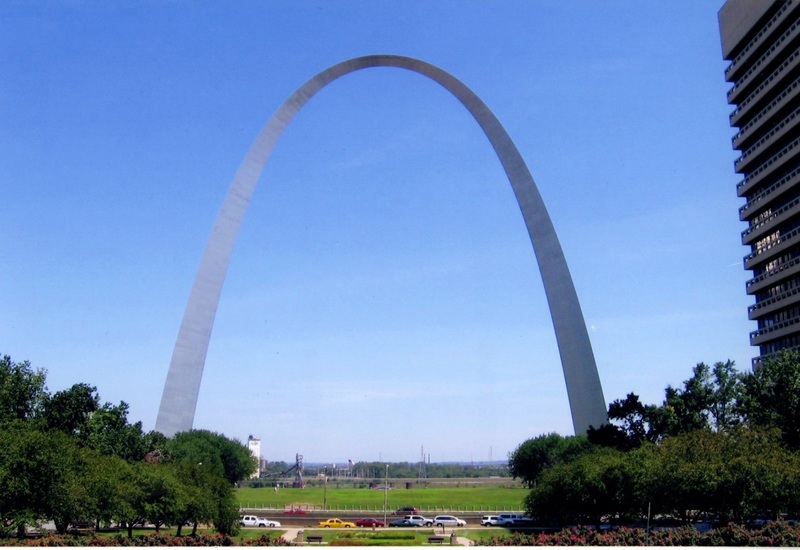 While in St. Louis I also went to the St. Louis Arch. 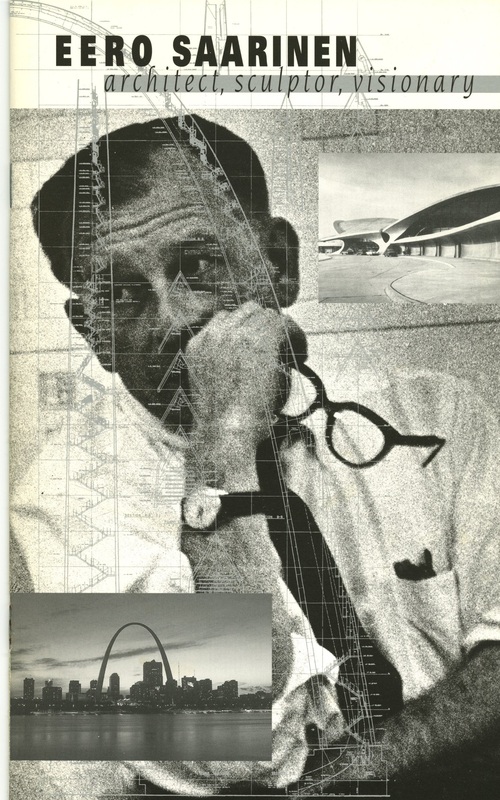 Architect: Eero Saarinen. It’s a great structure. You can go to the top of the Arch in egg shaped cars that seat five. 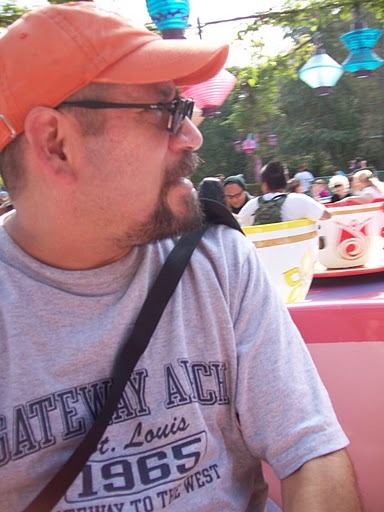 The picture I use on my Bold Strokes Books author page was taken while I waited in line to board one of those egg shaped cars. I took this picture at the base looking up. At the very top is a series of windows where tourists can view the surrounding St. Louis area. 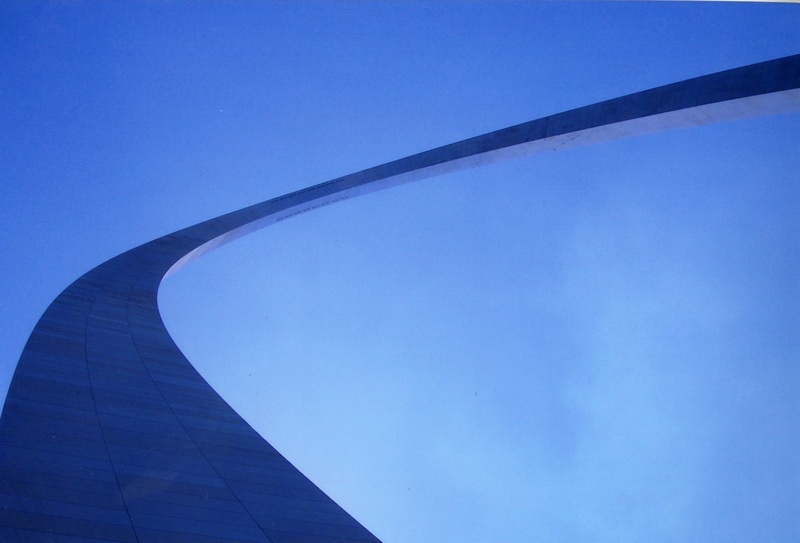 This is the cover of a brochure I bought while at the Arch. It was a deal for 50 cents! 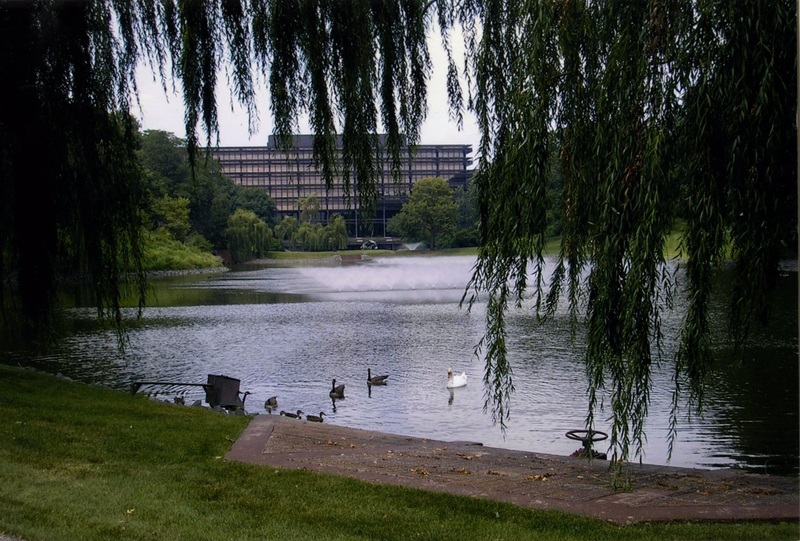 Eero also designed The John Deere Building. 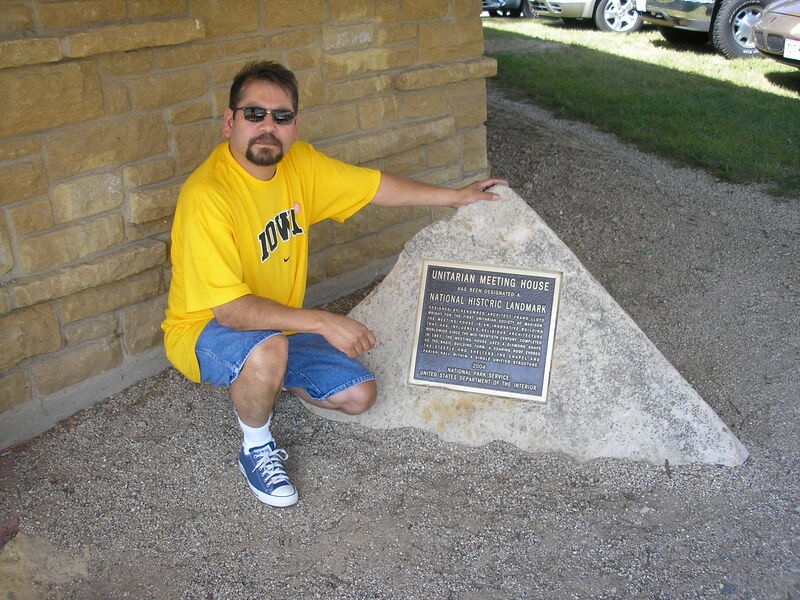 This is in Moline, Illinois which is right across the river (Mississippi) from where I grew up in Davenport, Iowa. 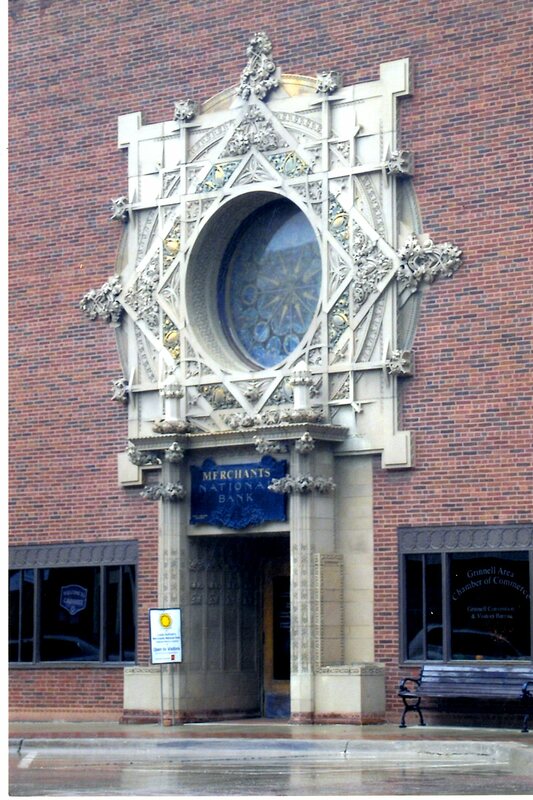 Back to Louis Sullivan—————–After Adler retired in 1895 their partnership ended, and in the early years of the 20th century, Sullivan designed a series of banks in small towns throughout the Midwest. 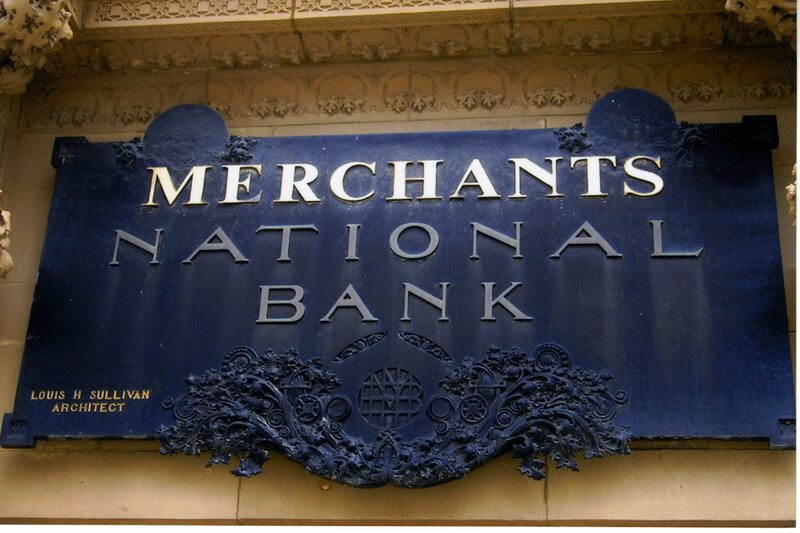 This bank, The Merchants National Bank, is in Grinnell, Iowa. I stopped by Grinnell during the summer a couple of years ago. The street was deserted. The bank had an elderly man as a docent. Since I was the only one there he gave me a leisurely private tour. The sign above the entrance. This is the brochure the bank gives out. 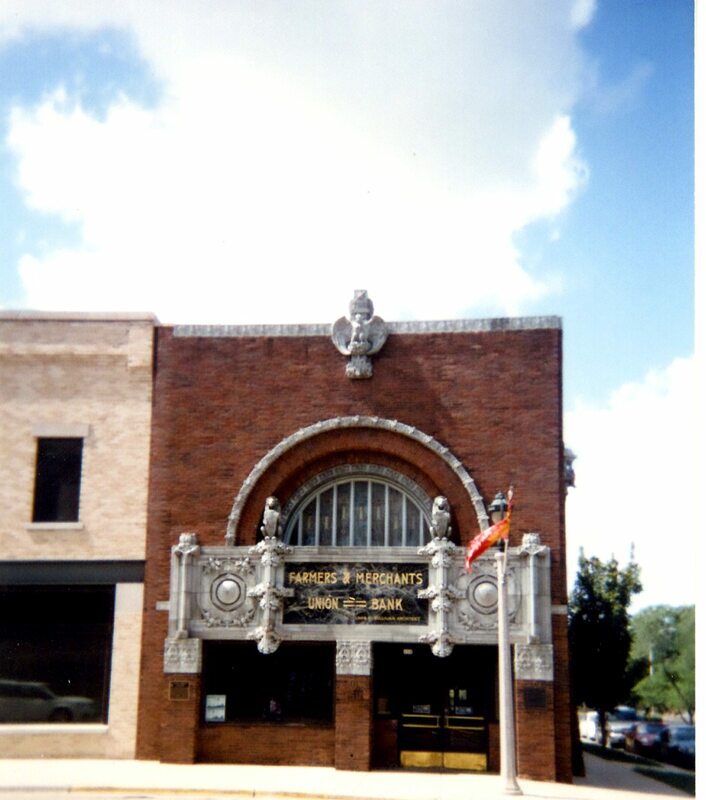 This is the National Farmers’ Bank in Owatonna, Minnesota. 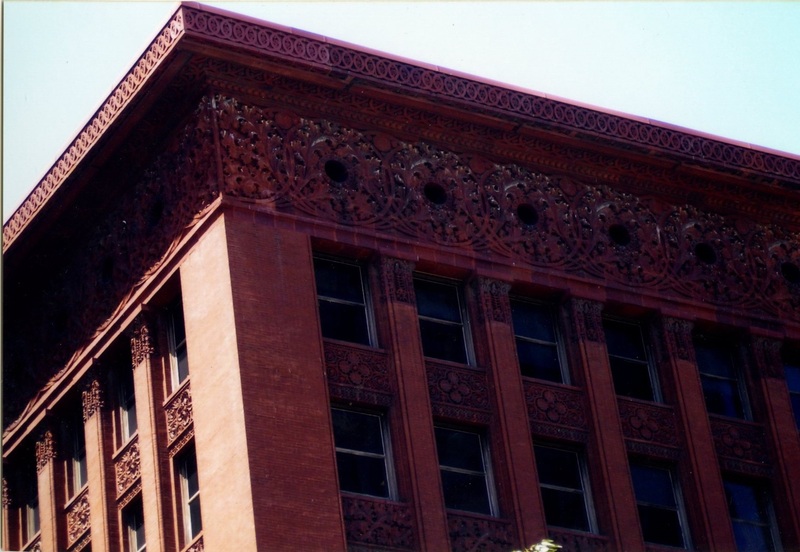 Architect: Louis Sullivan. 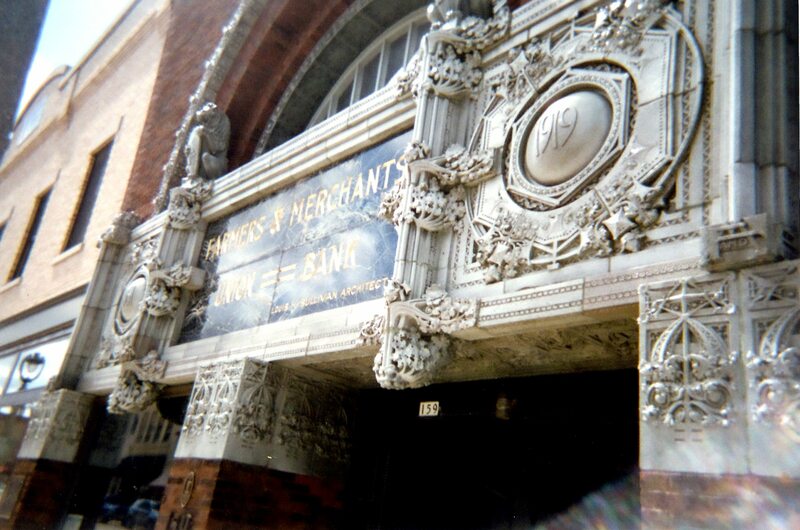 The outside isn’t as spectacular as some of the other banks but the inside made me gasp. All this terra cotta is above the inside front door. It’s pretty impressive. 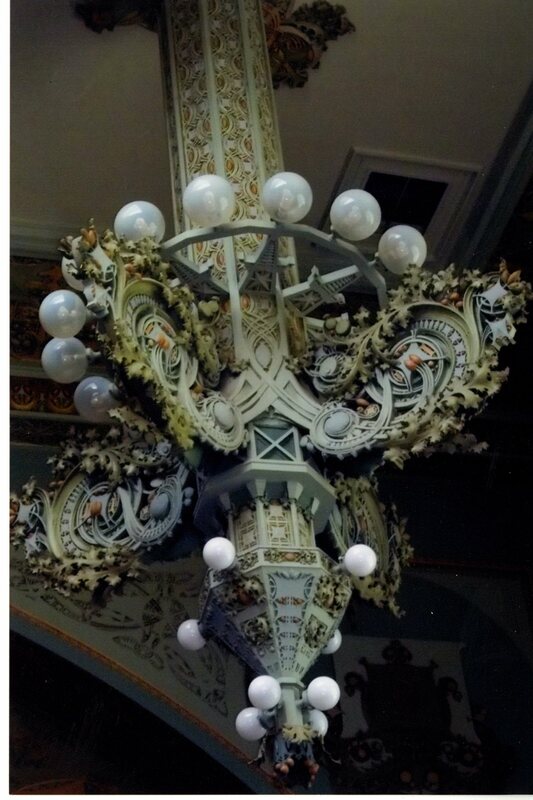 This is one of the light fixtures hanging from the ceiling in the Owatonna bank. They’re huge! Okay, here’s a better angle. I forgot to bring my camera for this trip. When I saw the bank I knew I had to have pictures so I went to a local convenience store/gas station. They had “throwaway” instant cameras but they weren’t Kodak they were an off brand. If I remember correctly it was, like, Phil’s Instant Camera. On top of that, the camera had passed its “best if used by” date so I’m really amazed these pictures even came out. When I walked inside it was a quiet little bank. I asked one of the tellers about the bank and the teller said, “See that woman over there in the green dress talking on the phone?” I nodded. The teller said, “When she gets off the phone she’ll show you around.” When she hung up, that woman in the green dress, was the kindest woman in all of Columbus, Wisconsin. (Population: 4,997.) She gave me a tour of the bank, she took me into the board room and up to the mezzanine where she showed me all these beautiful architectural drawings and artifacts. The people in the Midwest are the nicest people anywhere. They didn’t have any postcards of the bank for sale but they did have these note cards. 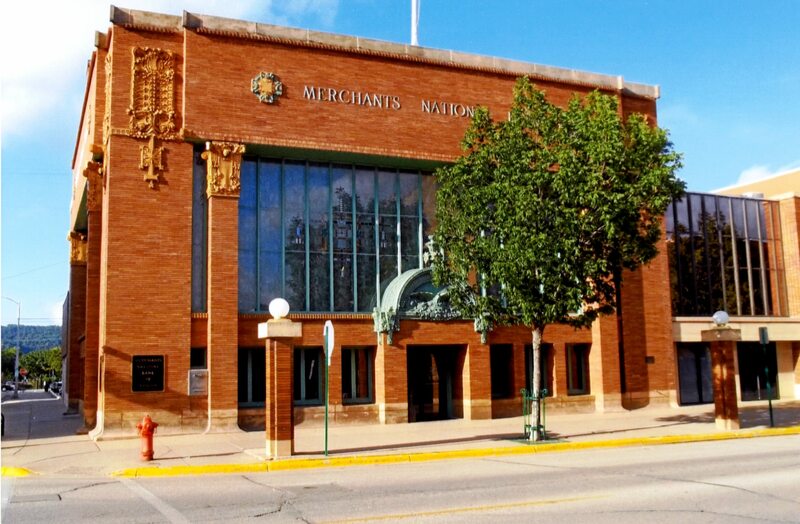 Merchants National Bank in Winona, Minnesota. The architects were Purcell & Elmslie. 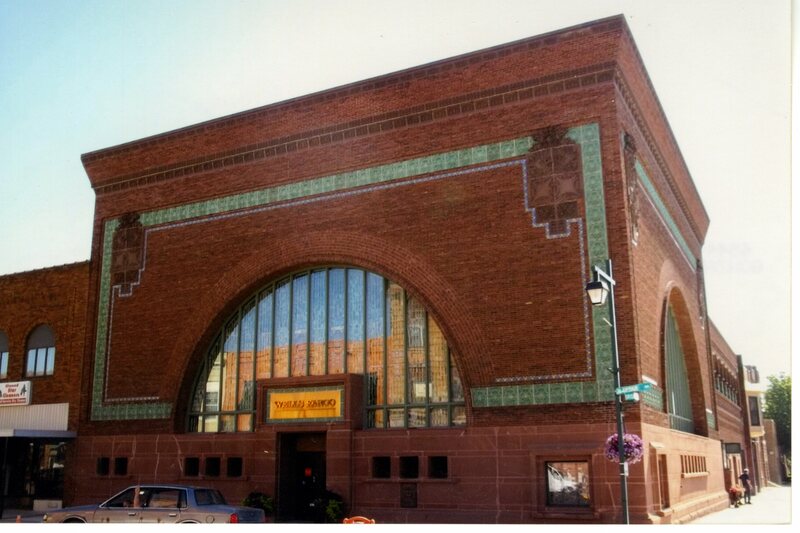 I drove up to Minnesota to see this bank. 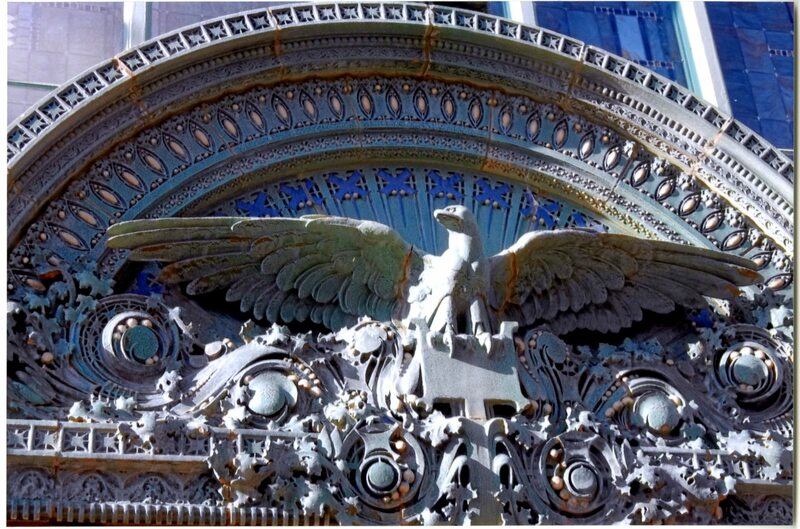 This is the terra cotta eagle above the main entrance. He’s pretty goofy looking which makes me just like him more. 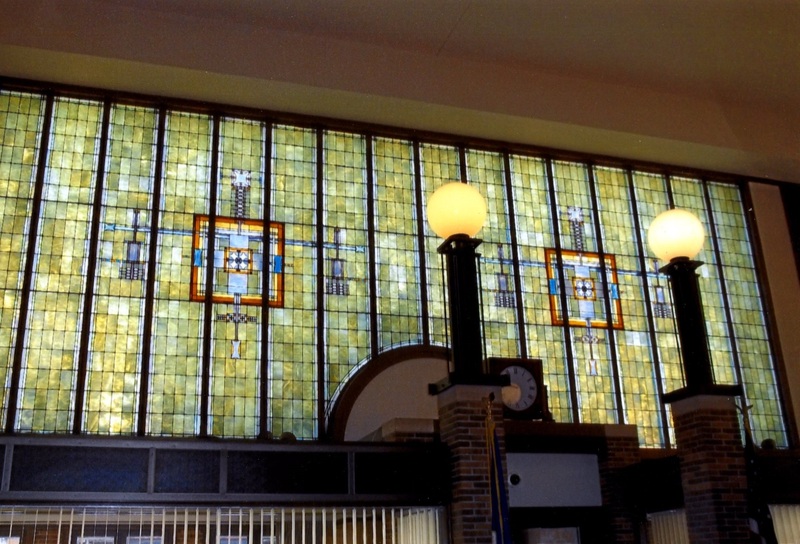 This large stained glass window is above the entrance to Winona’s Merchant’s bank. 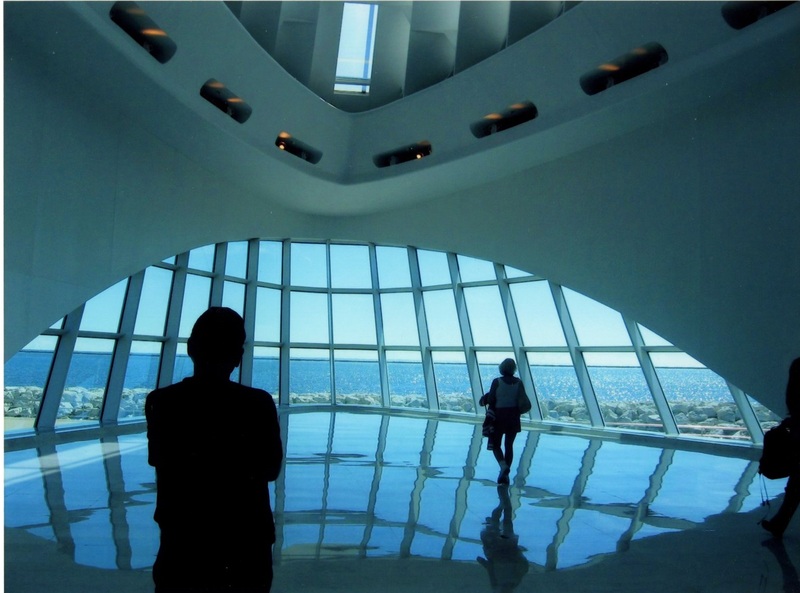 Milwaukee Art Museum. Quadracci Pavillion. 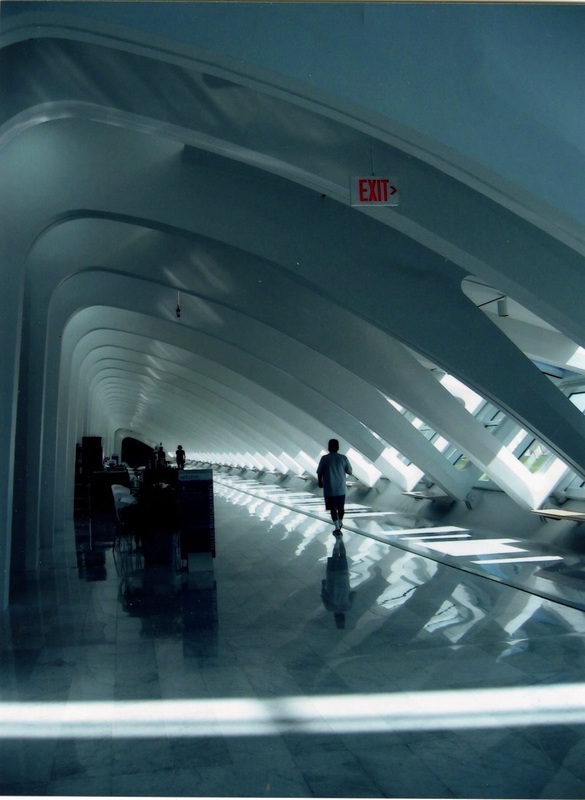 Architect: Santiago Calatrava. It looks like a boat to me. This looks like a mast. That’s me inside on the left. I felt as if I was in a spaceship. I like the inside A LOT! (That’s me walking down the hallway.) There was a Gilbert and George show running while we were there. I thought it was quaint that there was an advisory at the entrance to the exhibit that warned the exhibit might not be appropriate for all ages. 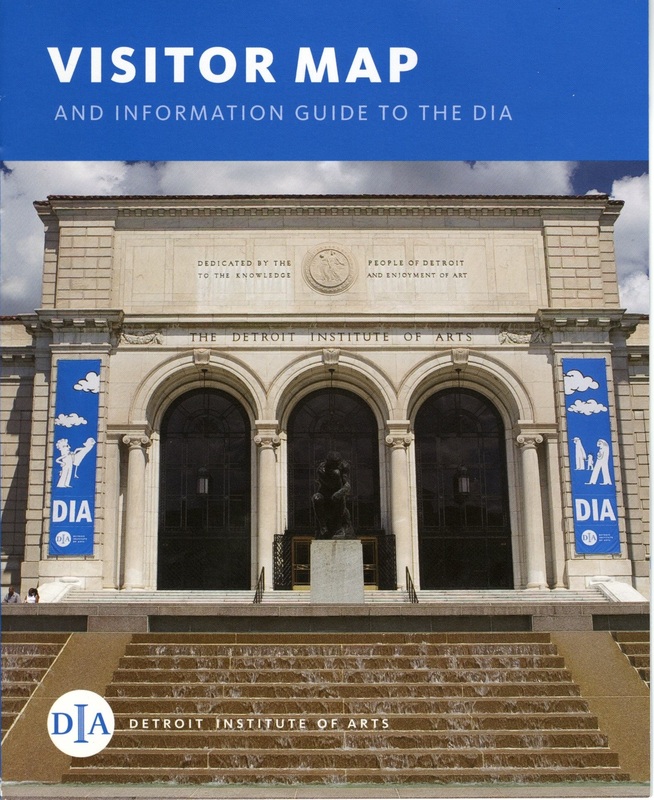 A couple of summers ago I drove from Chicago to Detroit to see the Diego Rivera murals at the Detroit Institute of Arts. 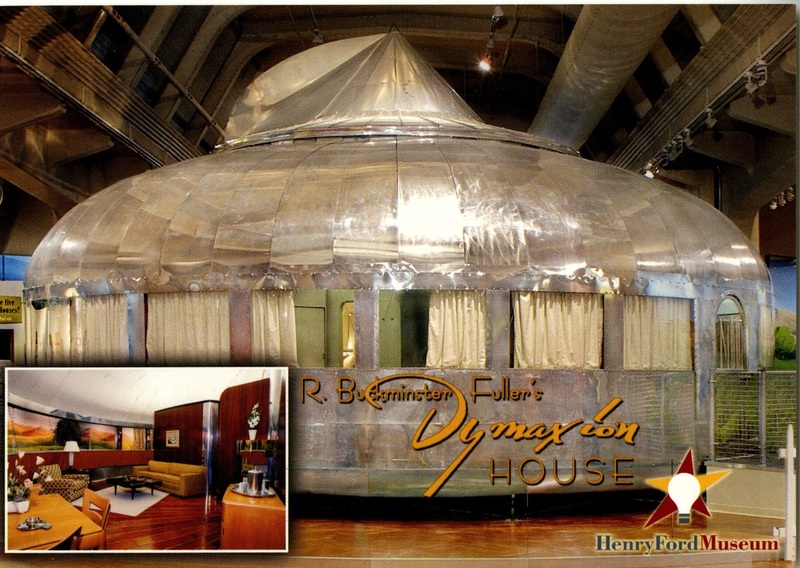 On my way there I stopped at the Henry Ford Museum to see the Dymaxion House. I’m glad I stopped because it’s super-dooper cool. I also sat in Rosa Park’s bus which may have been even cooler. The Henry Ford Museum is worth a visit if you’re in the area. They also have one of JFK’s limos. Yes, that one. 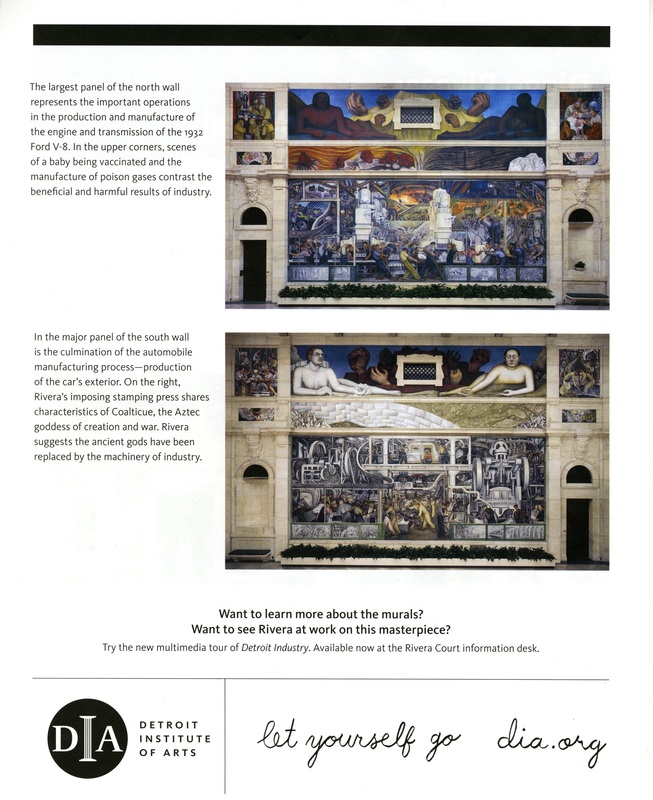 Two of the Diego Rivera murals are visible in this DIA hand out. 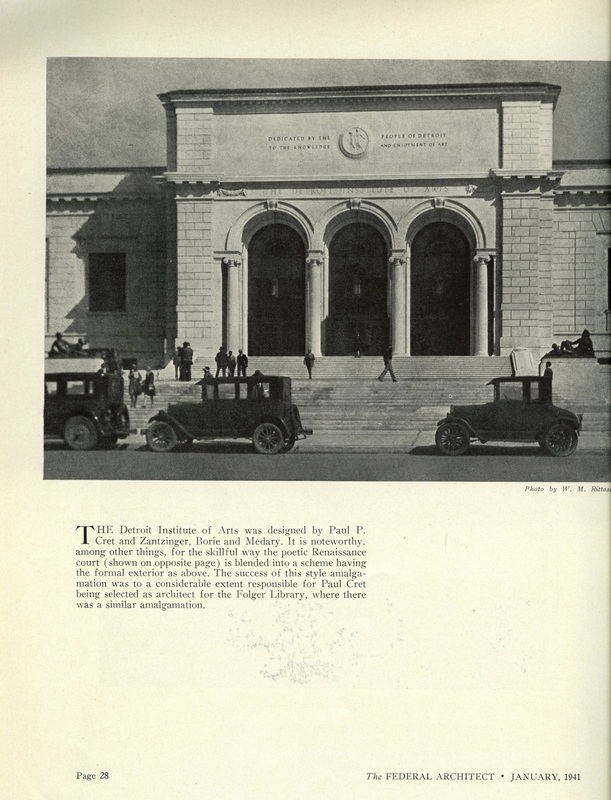 The architect for the DIA was Philadelphia architect Paul Philippe Crane. 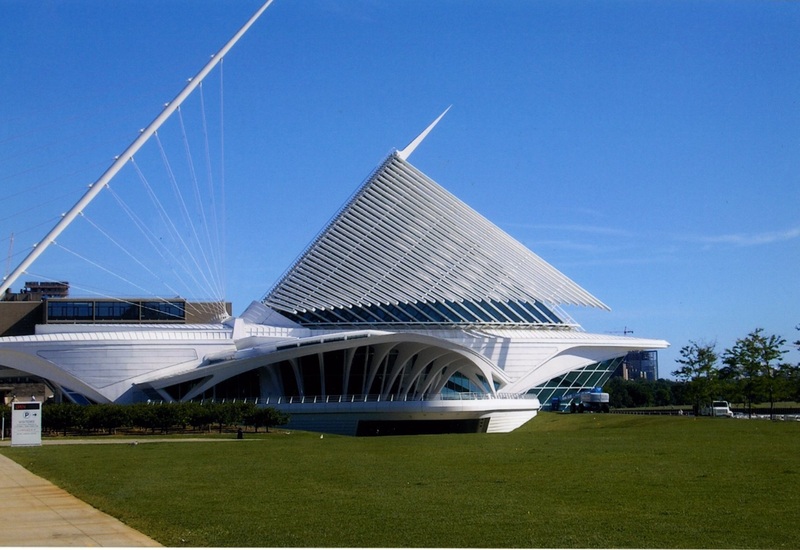 I like this image of the museum because of the cars. I want the tiny one on the right. 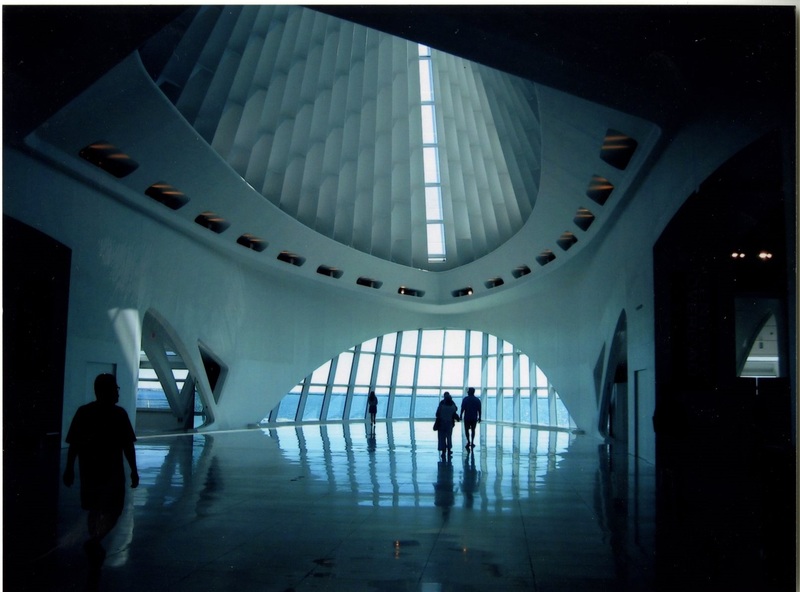 The image is from Federal Architect. My parents live in Iowa. 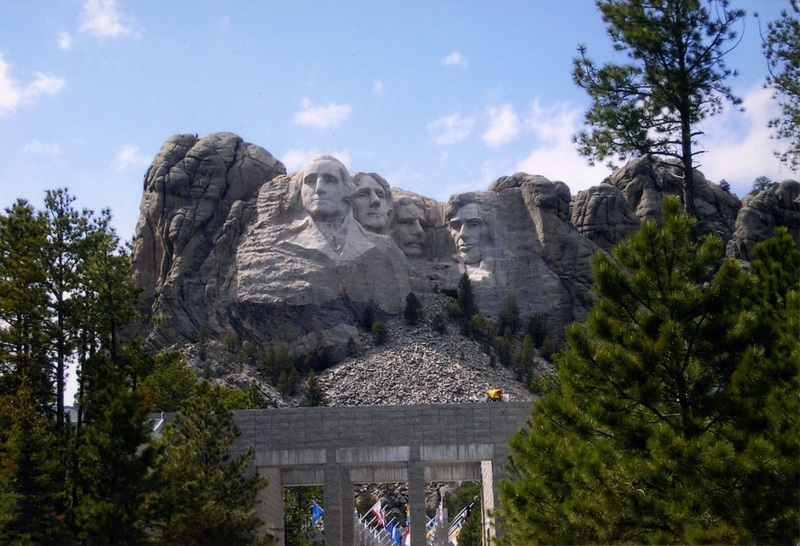 During one of my visits to see them I decided to drive to Mt Rushmore to add some excitement to my visit. According to AAA it’s a 12 hour drive. It took me two days to get there but I was in no hurry. This is the entrance. It was a cold, sunny day. They’re really big heads. I found them to be very cool. Note: The cafeteria looked very similar to the one in North by Northwest. 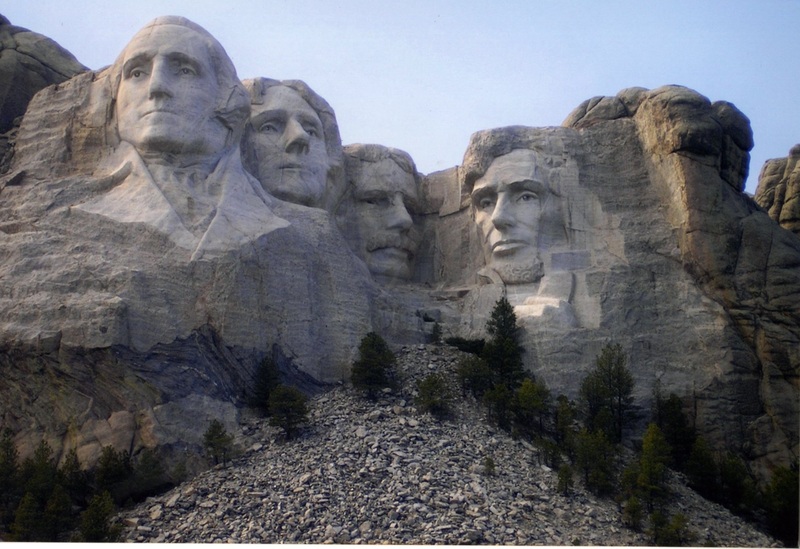 I know Mt Rushmore isn’t technically architecture but it seems like architecture to me. 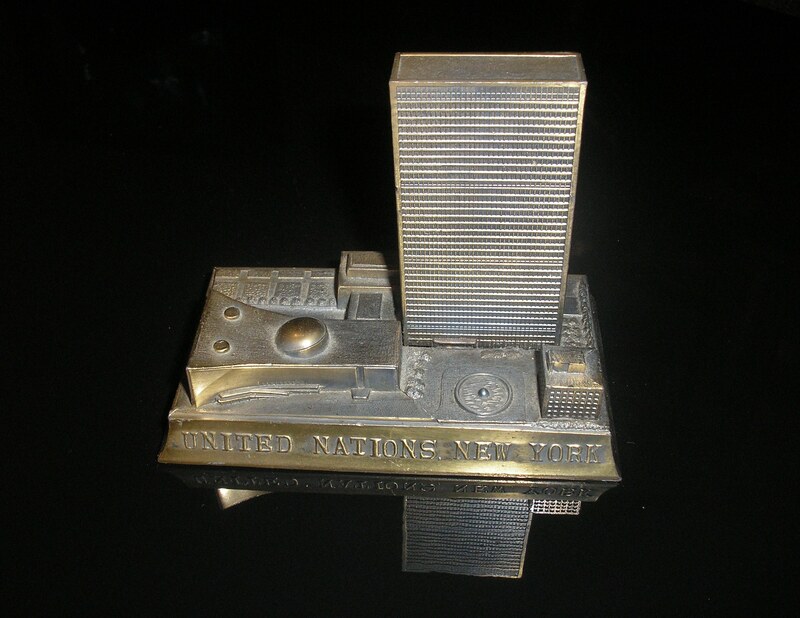 The United Nations Building. 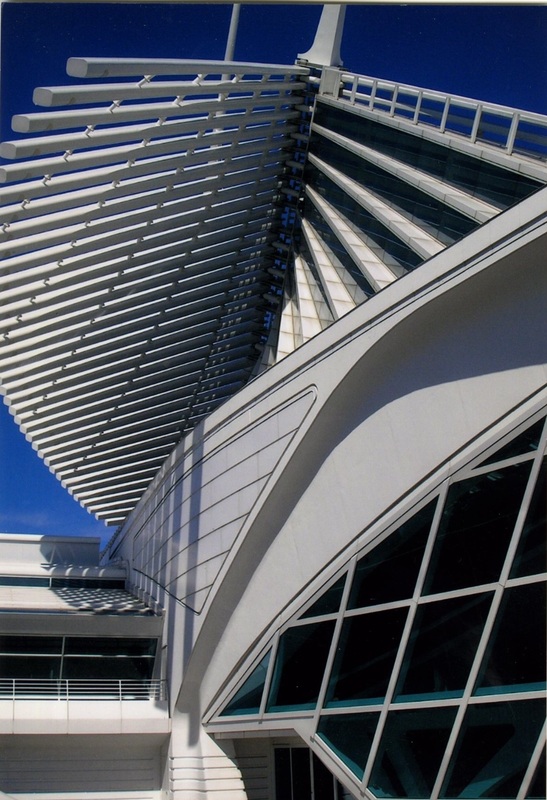 Archtect: Wallace K. Harrison. It’s something somebody would have bought in the 50s or 60s probably at the gift shop. 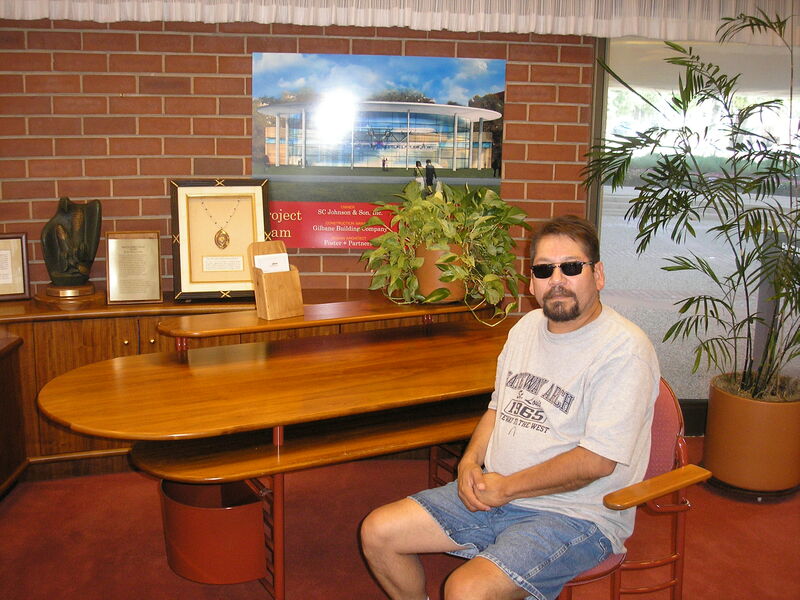 I went to the U.N. Building a long time ago and sought out the Cary Grant locations from North by Northwest. I asked a number of people where the locations were but nobody knew. Ugh. People need to watch more classic movies. The Guggenheim Museum. 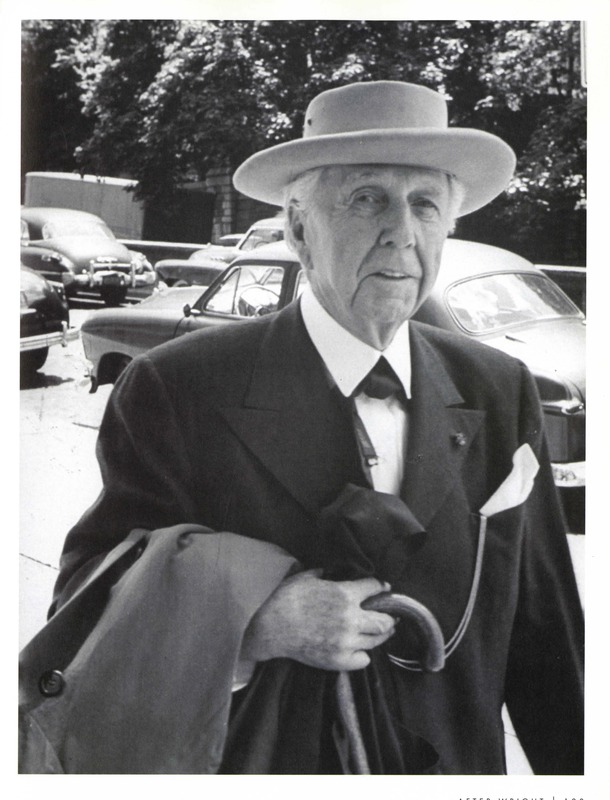 Architect: Frank Lloyd Wright. I bought it at the Guggenheim for WAY too much money but I had to have it. This is the Getty. 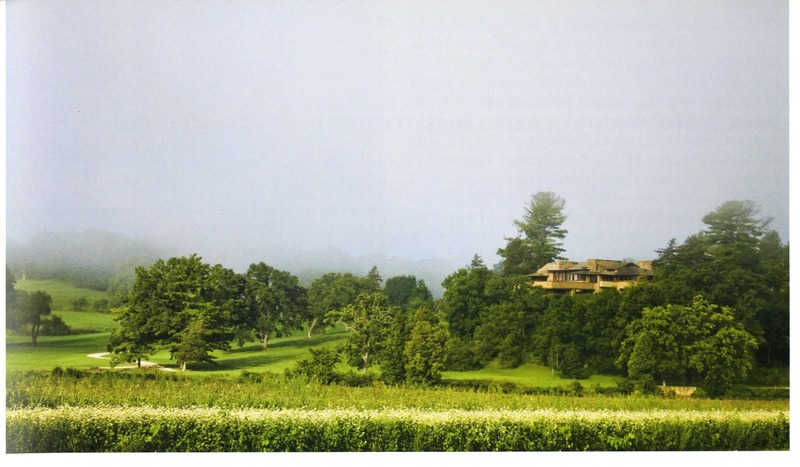 Architect: Richard Meir. I’m somewhat ambivalent about it. Once there I like how spacious it is and the types of materials used. The views looking out to the surrounding city are astounding. Yet, from far away it looks like a big, massive jumble. One of my co-workers says it looks like a bunch of hospitals thrown together. I went on Sunday, 2/10/2013 because I was taking a class about Italian Renaissance Art. I went there to see Saint Jerome in the Wilderness (circa 1470) by Ercole de’ Roberti. 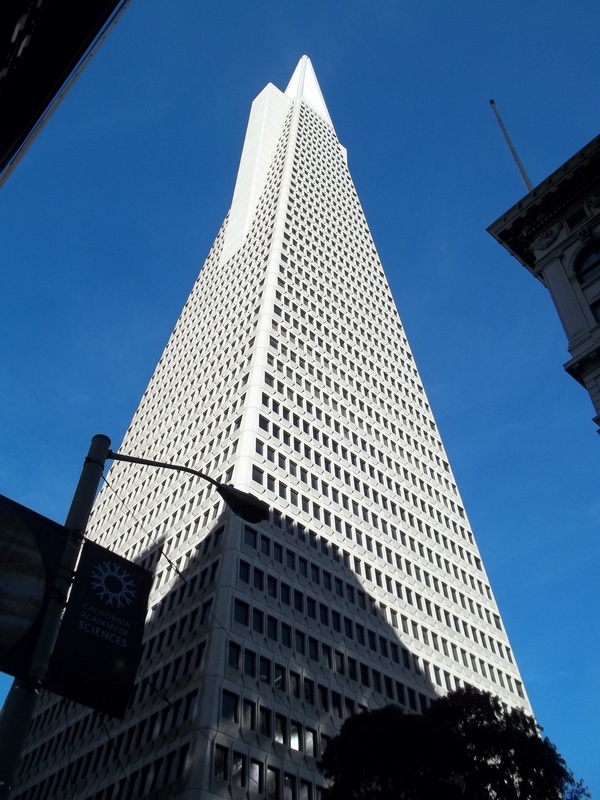 In February of 2015 I went up to San Francisco and stood across the street from the Trans America Pyramid. (Architect: William Pereira) It was very pyramid-y. The street guide I had said the building’s observation deck was closed after 9/11 which is a bummer. I wanted to go up. I’m in a teacup but I’m not a teabag or teabagger. 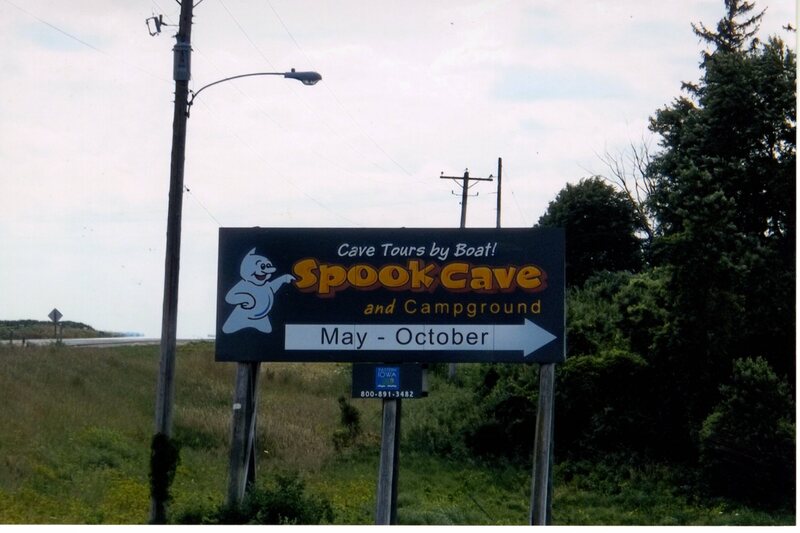 If I remember correctly I was driving on state highway 20 in Illinois and came upon this sign. I wanted to go but I was alone and it looks like it would have been more fun with a friend. This is a caricature of me drawn by Melissa Vetter. I’ve kept this fortune for years. It spoke to me. 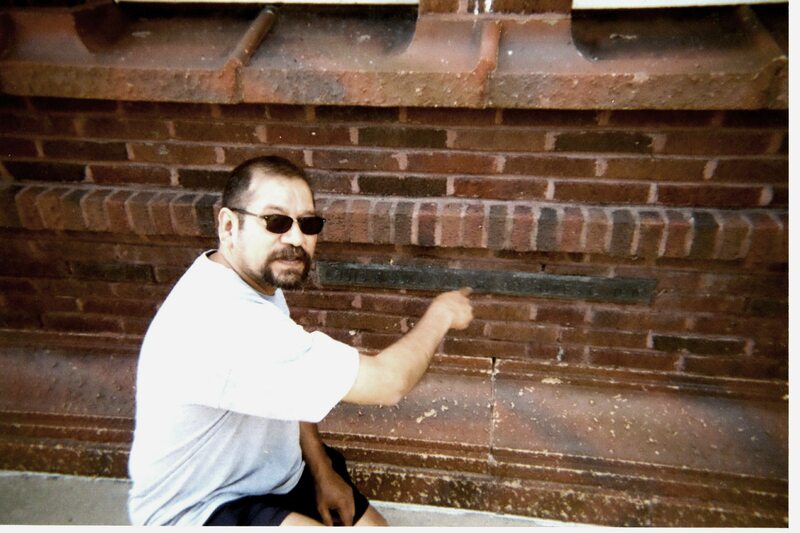 The photos of me at The Unitarian Meeting House, The Johnson Wax Building, Taliesin, The St. Louis Museum of Art, The People’s Savings Bank, The Wainwright Building, Wingspread, The Milwaukee Art Museum and Disneyland were all taken by my lifelong friend, Robert C. Graef. Thank God for him and his camera. I moved into my present apartment back in 2004. It’s a little bungalow (about 500 square feet). There are a number of these small bungalows on a double lot. All of them look the same on the exterior and they were built sometime in the 1920s. 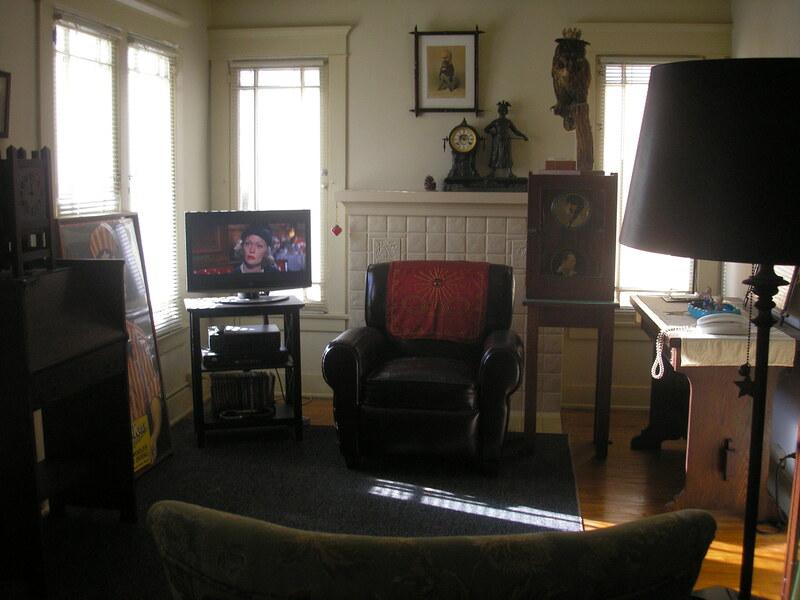 This is a photograph from 2004 when I had just moved in. This is looking away from the fireplace. The living room area is 23 feet by 9 feet. These are photographs circa 2008. This is toward the fireplace. The movie on the television is Death on the Nile. Another one looking toward the fireplace but from farther back. The Titanic poster is from the 1954 Clifton Webb/Barbara Stanwyck version. The back of these photos says 2010. 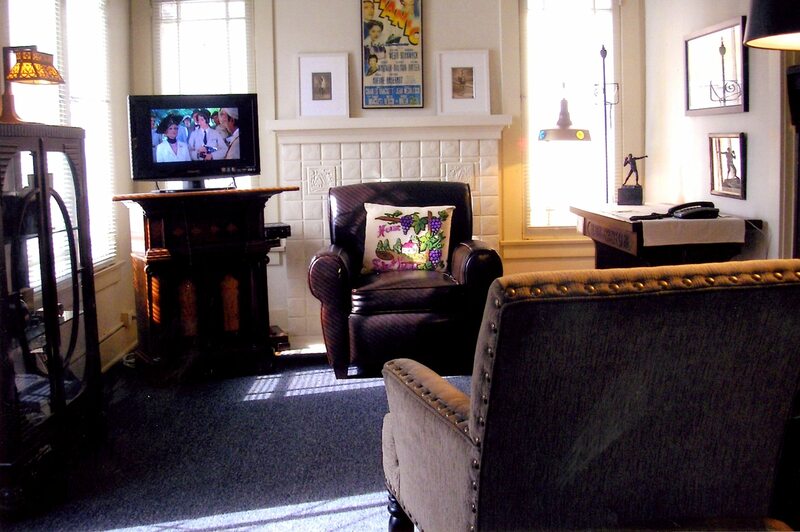 The image on the TV is from a Miss Marple episode. I forget which one but I think it’s Murder is Served. The image above the fireplace is The Light of the World. 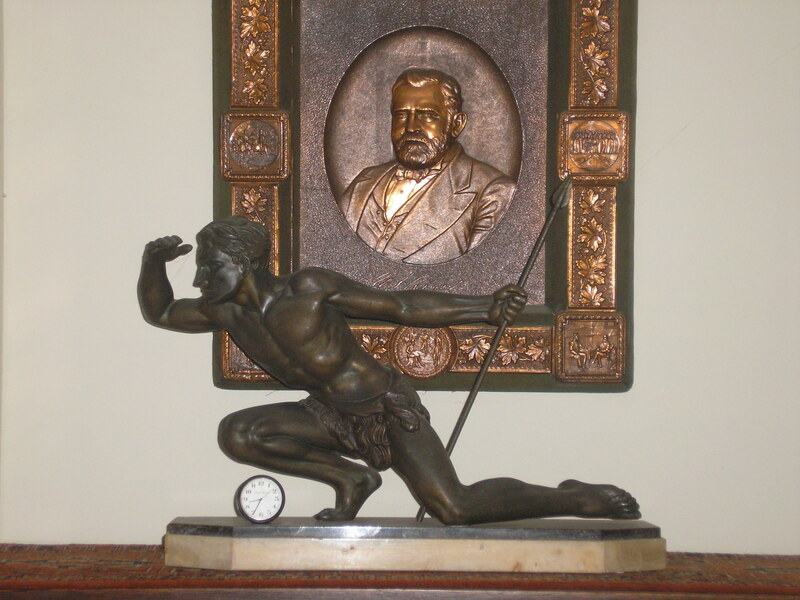 It’s an engraving based on Holman Hunt’s painting of the same name. Hunt was one of the Pre-Ralphaelites. 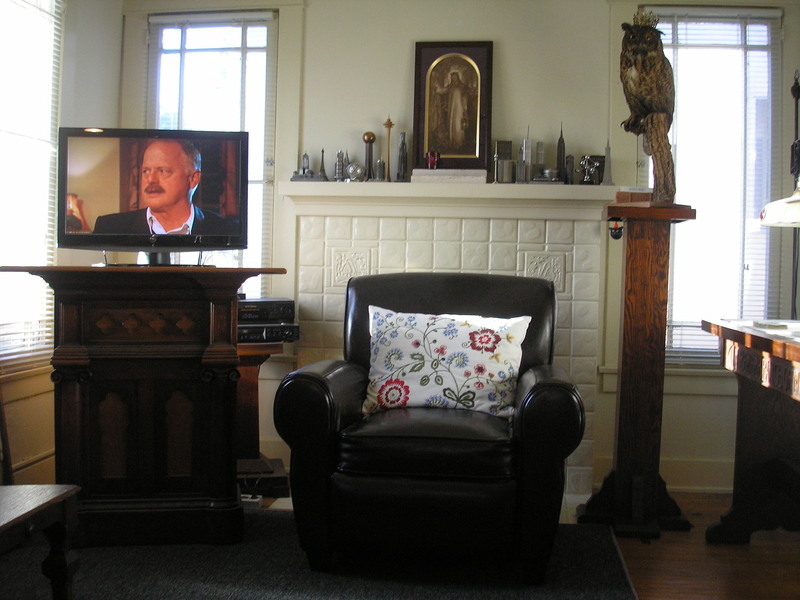 You can see a portion of my souvenir building collection on the mantel. This is looking in the other direction. The painting reminds me of someone who should be in an Edith Wharton novel. This section of the room looks a little cluttered. What was I thinking? I took them on the spur of the moment. I should have cleaned the glass on all the cabinets and dusted first but I didn’t. I took this photo in the morning with just the venetian blinds open. The image on the TV is Chinatown. A book I bought years ago had her image on the cover. 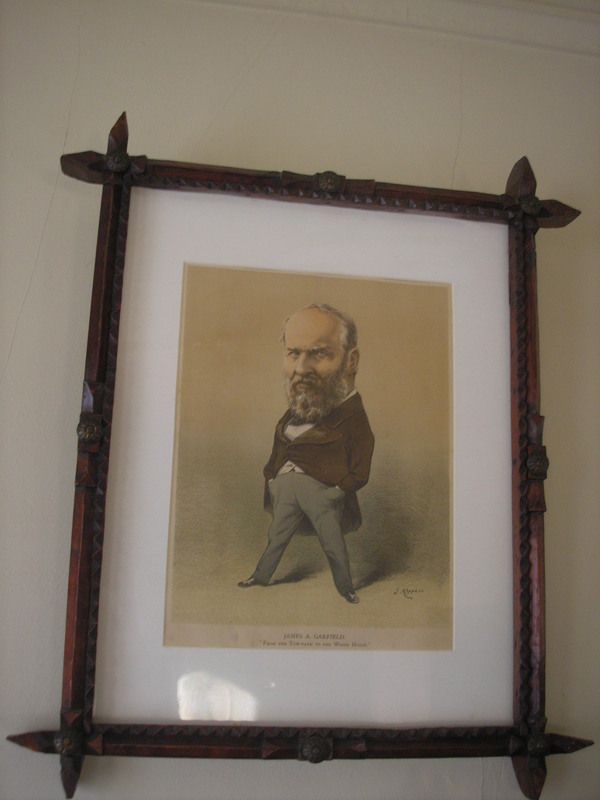 Hanging above her on the wall is our martyred president — James A. Garfield. 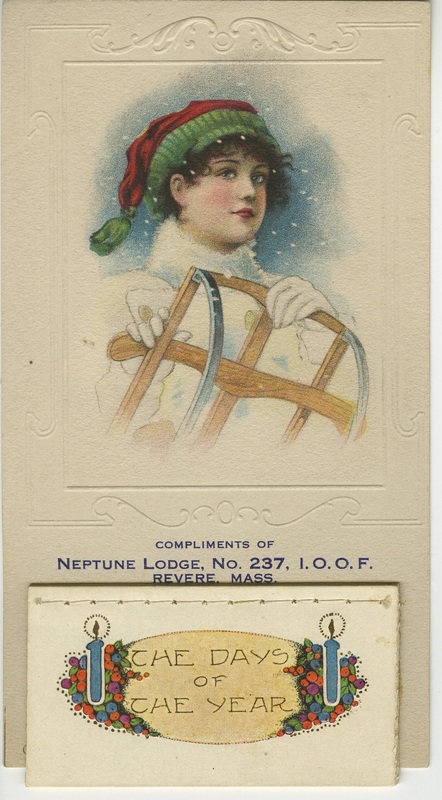 It’s a 19th century Puck image. I like the sentiment in the sampler. 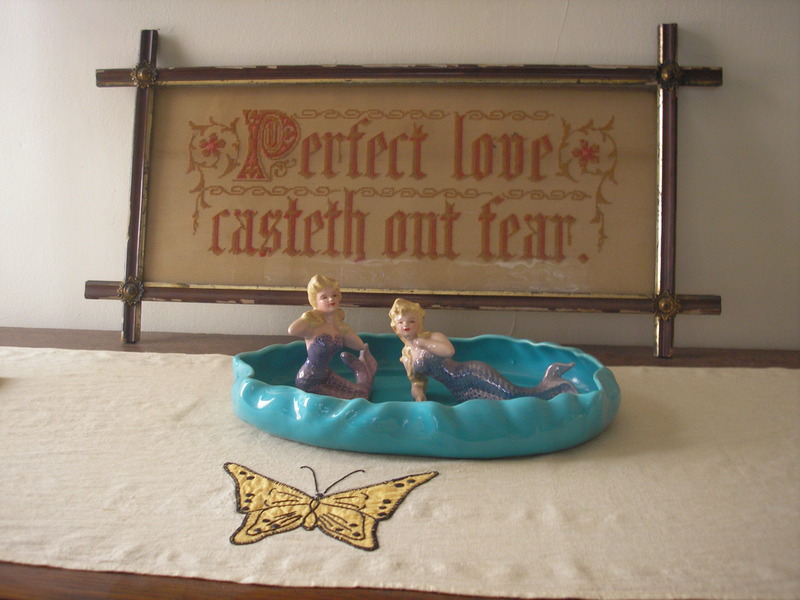 The two mermaids might be too girlie for a middle aged bachelor’s apartment or maybe just right. His name is Algernon and he died from old age. I bought the crown for him. He didn’t bring it with him. This is looking in the other direction away from the fireplace. On and in the desk are these three items which I am immensely fond of. He’s a French president from the last quarter of the nineteenth century. 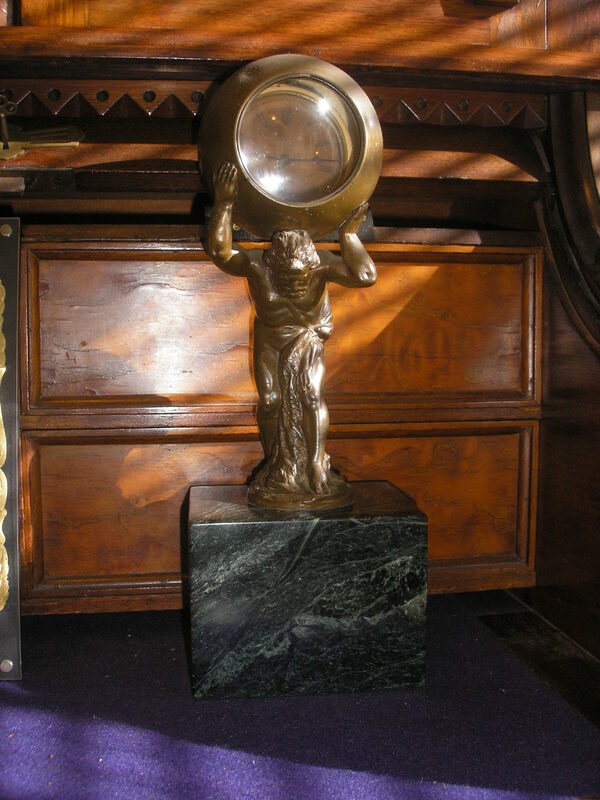 It’s Atlas holding a clock. 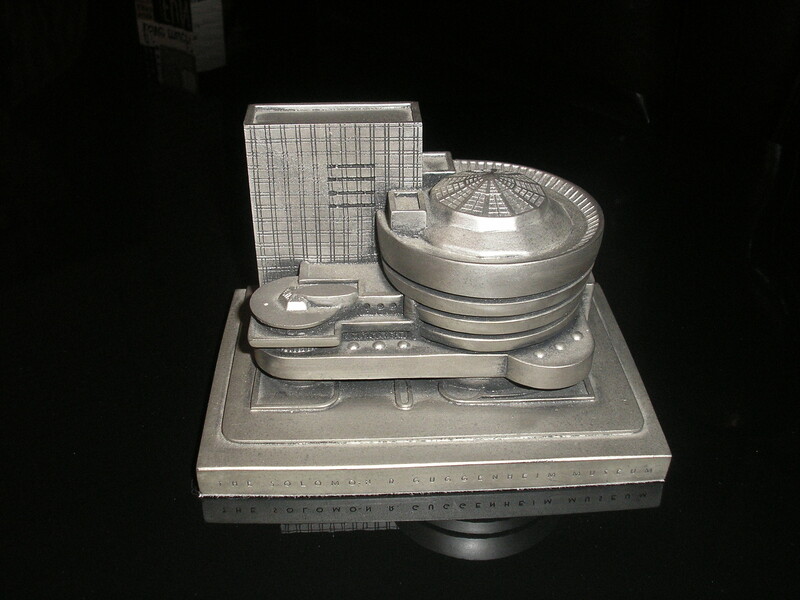 I wish they sold reductions of the Atlas at Rockefeller Center. I guess this would be an affirmation. On the wall opposite the front door is this bookcase. The statue’s a scout. 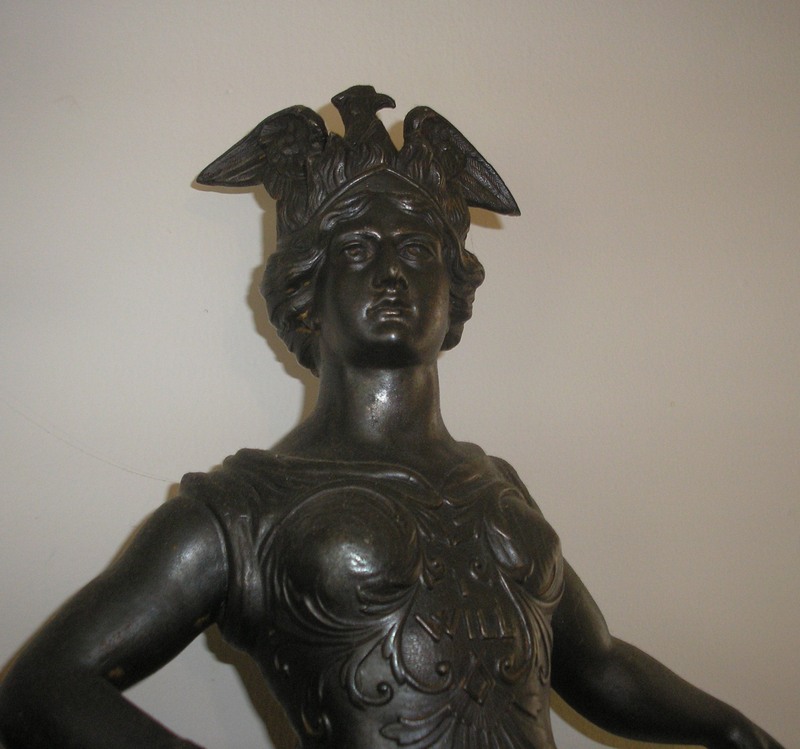 I saw this same statue in the 1950 Edmond O’Brien movie: D.O.A. It’s in Mr. Halliday’s office. 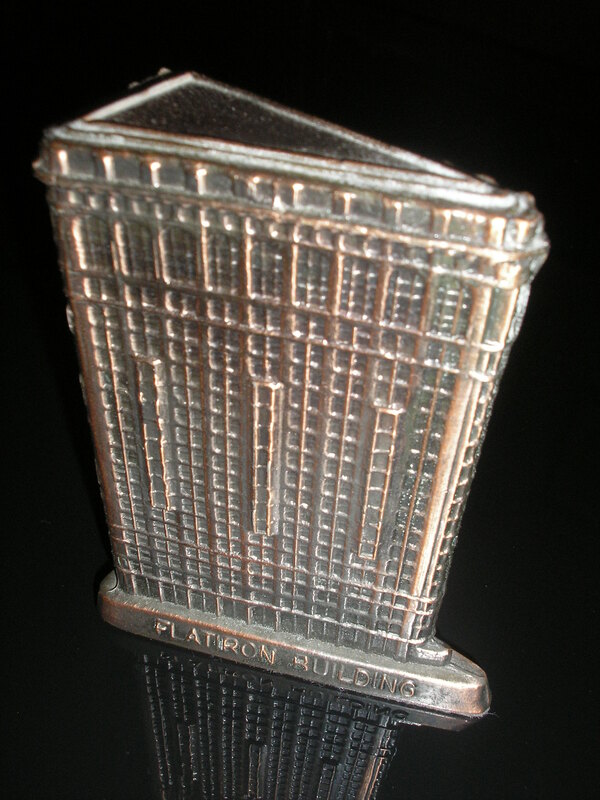 (Halliday works for the Philips Import Export Company which is located in the Bradbury Building in downtown Los Angeles.) 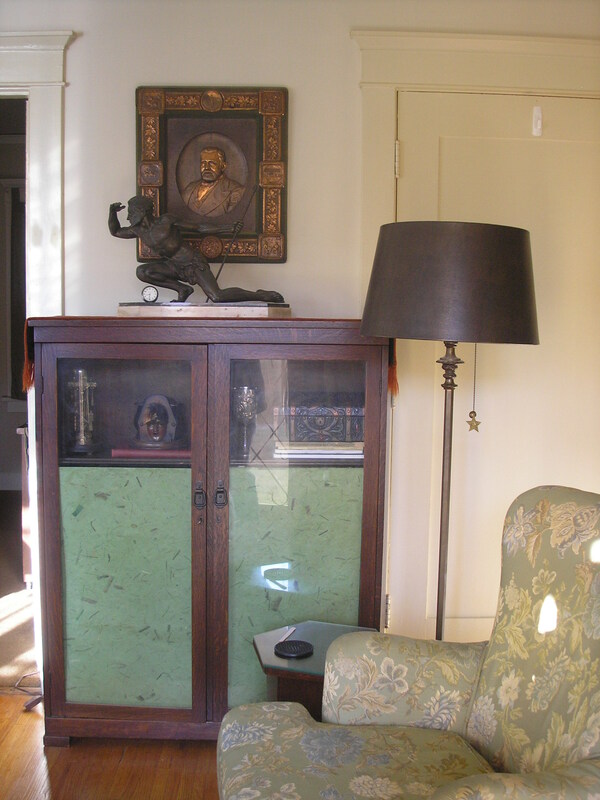 The item behind him is a copper relief image of President U.S. Grant with the high-points of his life at each corner and in-between the corners too. 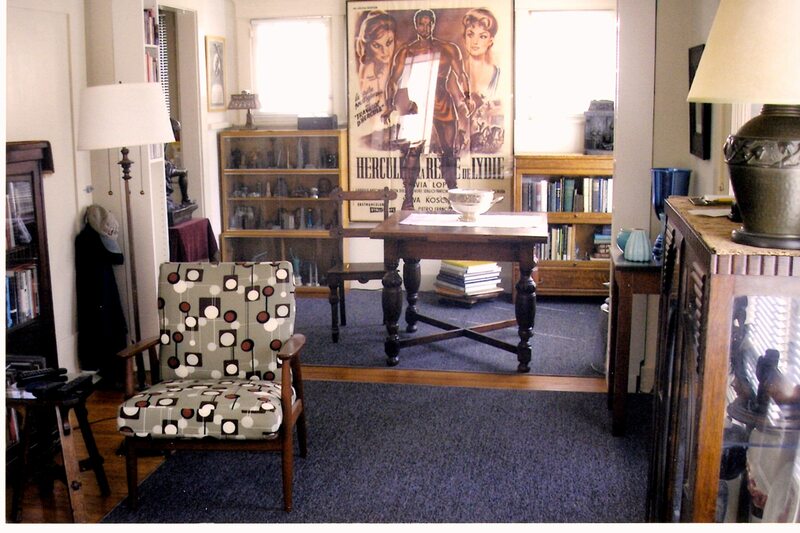 This is on the way to the kitchen and behind that green paisley chair. 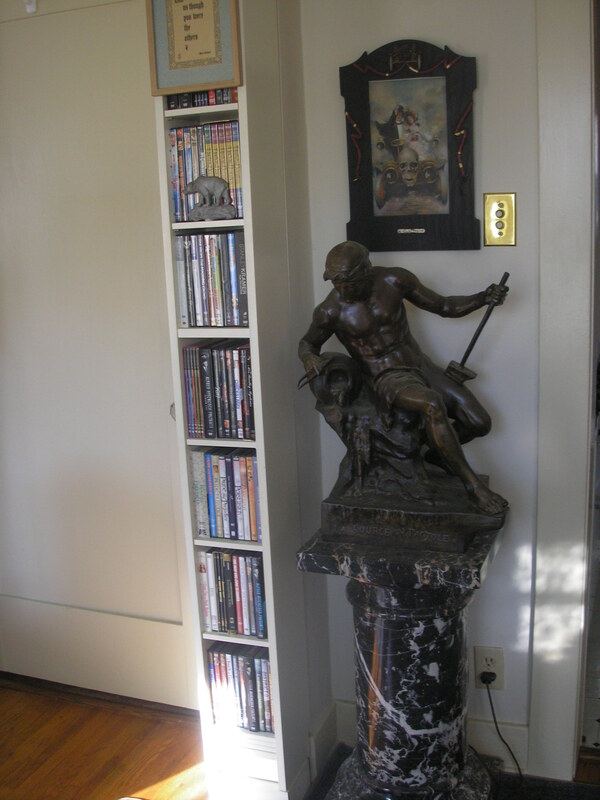 The statue is titled La Source du Pactole and is inscribed and dedicated on the side facing the IKEA DVD holder. The title of the print above him is Killing Pace. The man is holding up a glass of champagne. They’re drinking and driving. It is copyrighted 1903. It was missing some of the ribbon when I bought it so I’m attempting to fix it. Above is the inscription on La Source du Pactole. 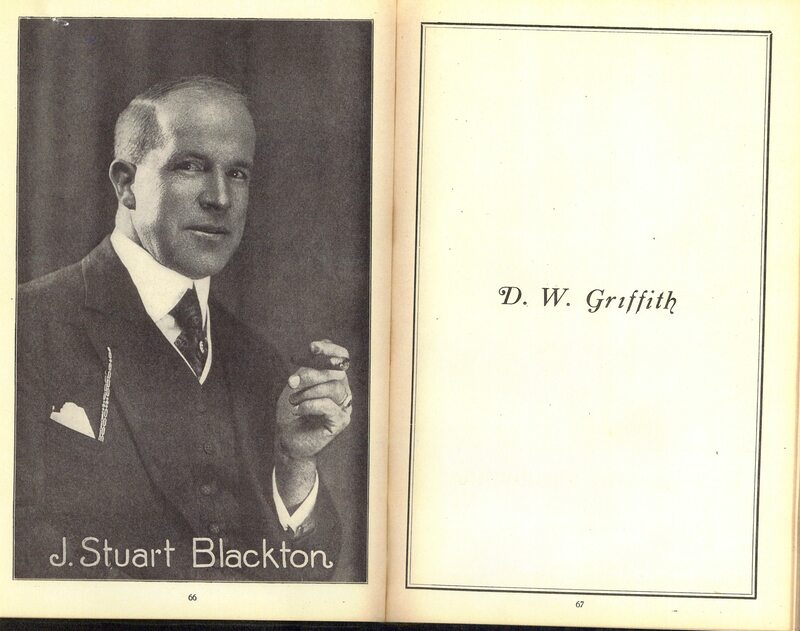 J. Stuart Blackton was one of the founders of Vitagraph. He’s pretty much forgotten in film history but he is mentioned extensively in a 1952 book called Two Reels and a Crank which was written by one of his partners at Vitagraph, Albert E. Smith. 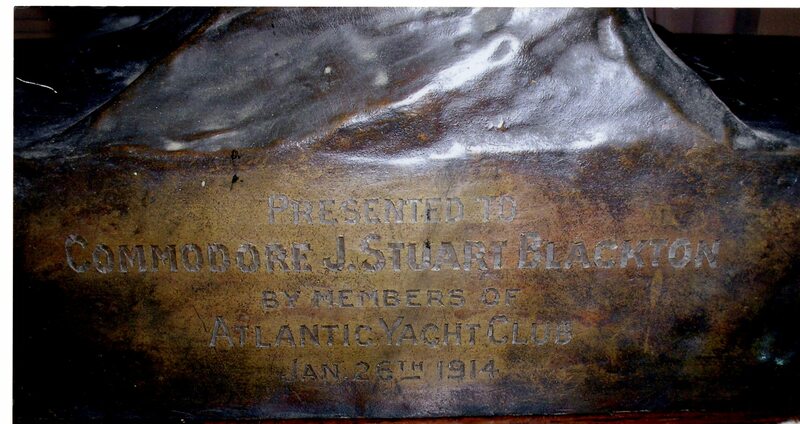 J. Stuart Blackton was hit by a car and died while crossing a Los Angeles street in the mid 1940s. 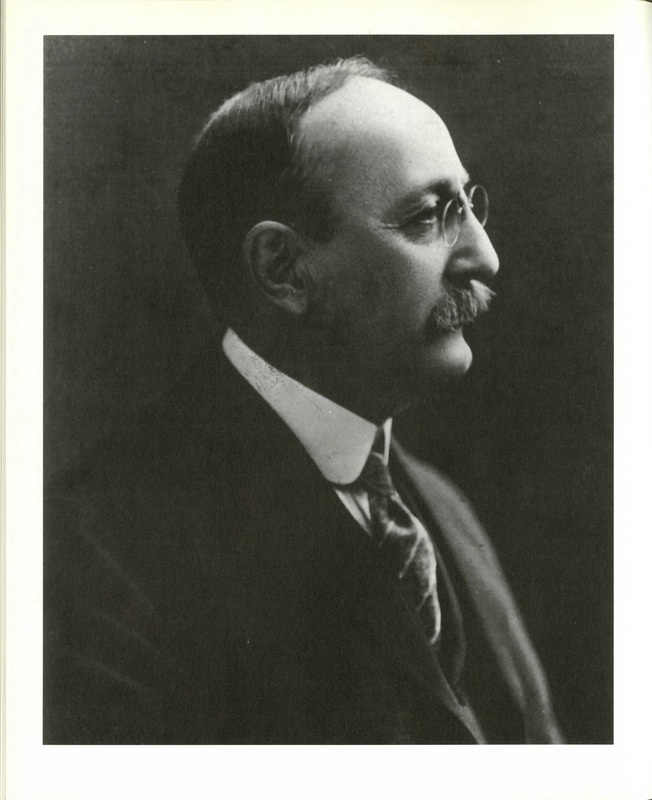 Here is a picture of him from the Motion Picture Studio Directory and Trade Annual from 1921. 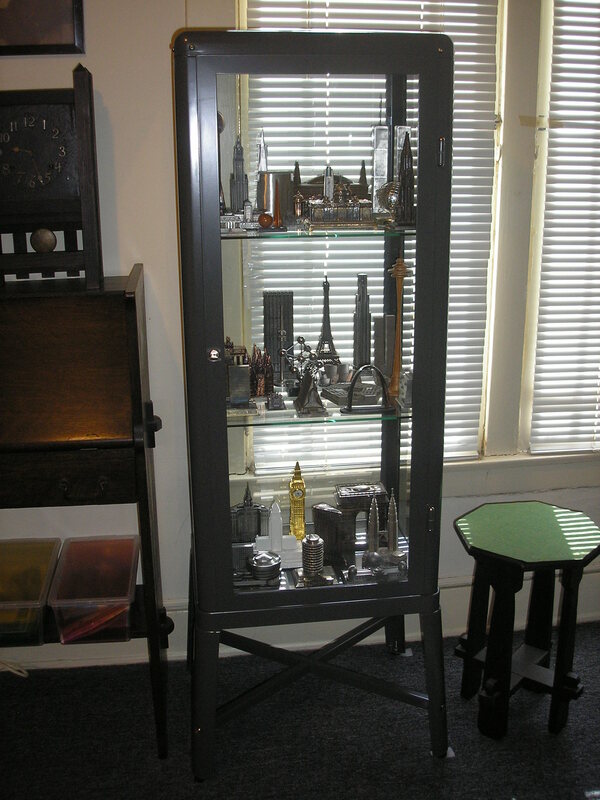 In an effort to get more organized I bought this display case from IKEA. I had a poster of Uncle Sam in this space but moved him to the closet. 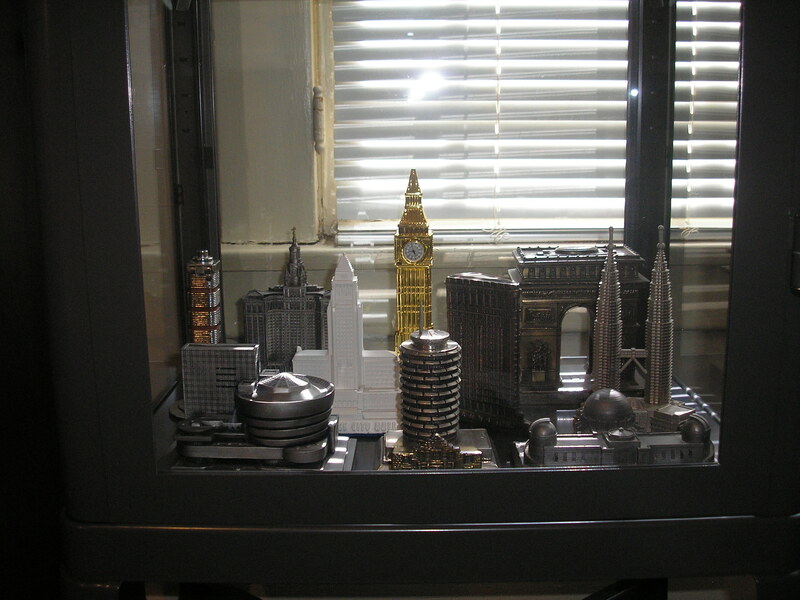 I’m using the display case to house my souvenir buildings. I’m very happy with it. This is the top shelf. This is the middle shelf. This is the bottom shelf. 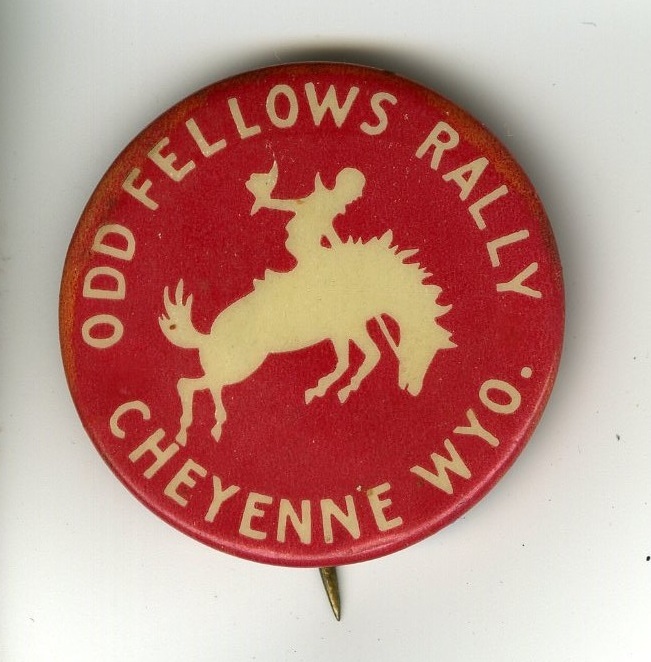 Odd Fellows items that I have picked up along the way. 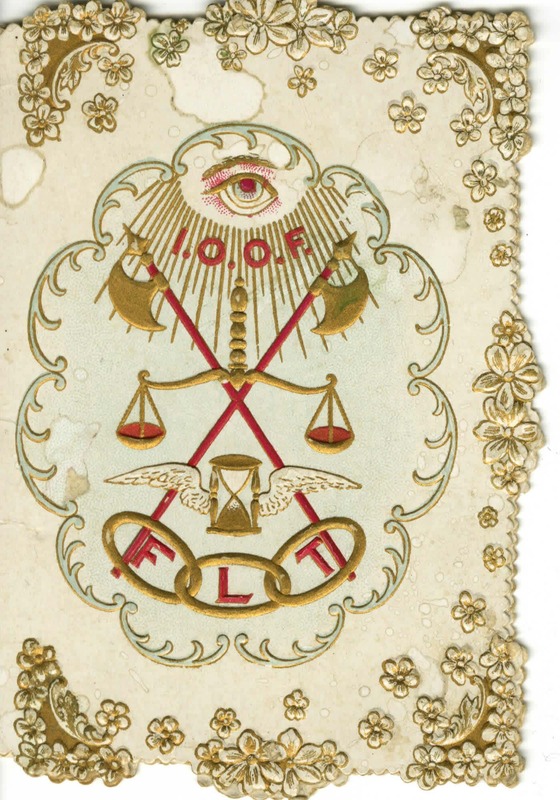 Some interesting Odd Fellows items I’ve collected. 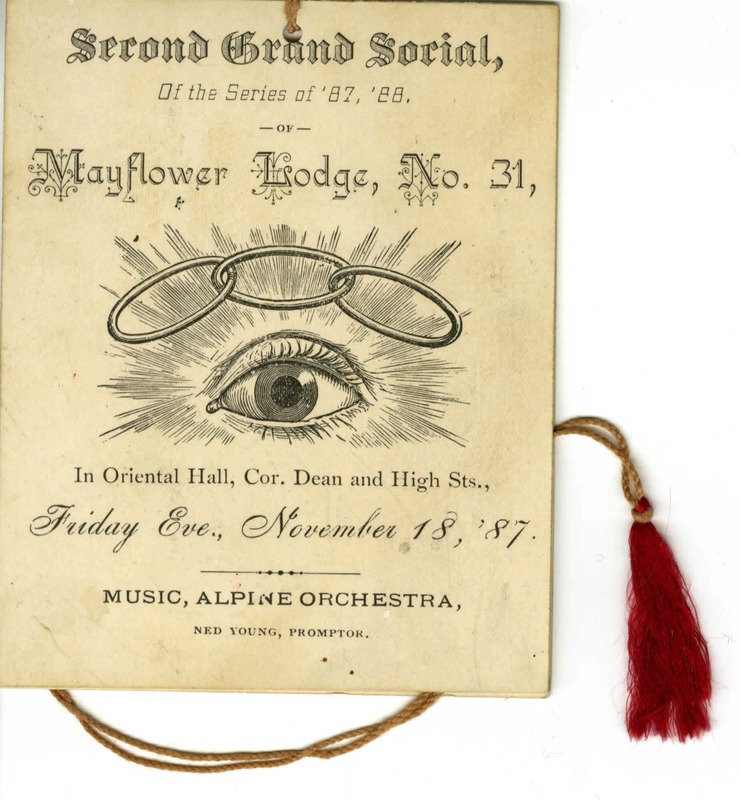 It’s a dance card from the Mayflower Lodge (no. 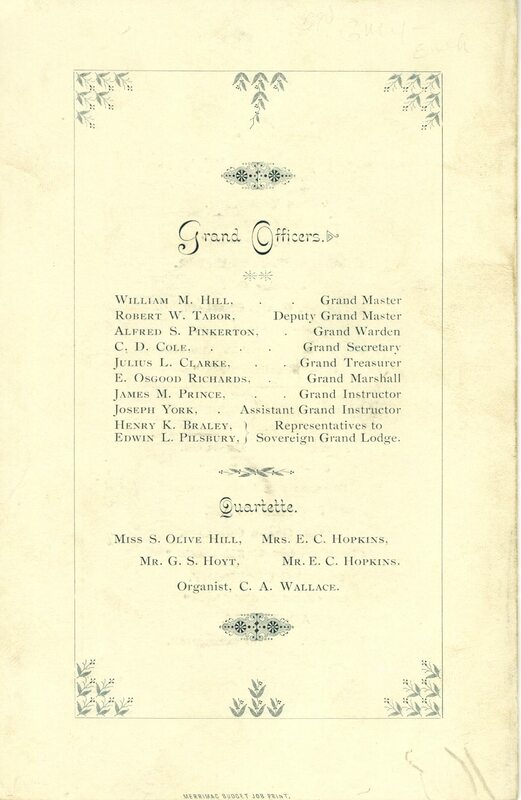 31) Grand Social in 1887. I would have enjoyed this social event. It was held on a Friday. It was a week before Thanksgiving, which means everyone would have been in the holiday spirit, and it was held at the Oriental Hall which sounds very exotic and luxurious. 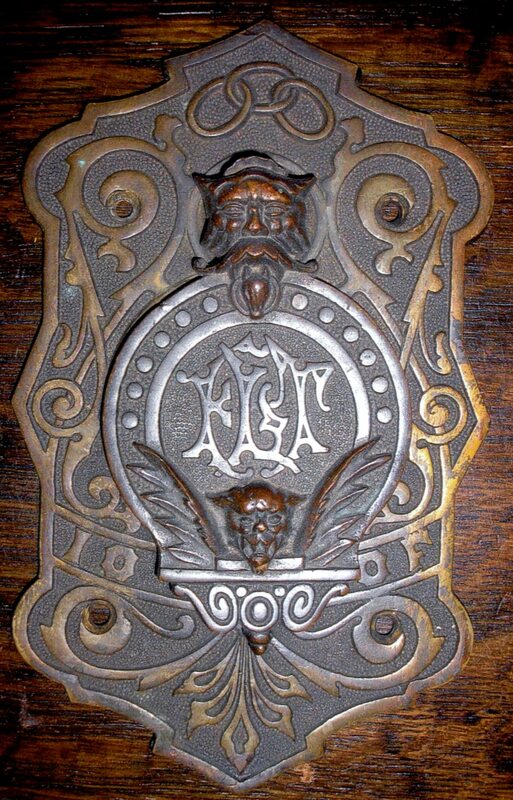 This appears to be a calling card but there is no name on the front. There could have been a name on the back but it was pasted into a scrapbook and then removed so if there was a name — it’s not there now. I bought this button off Ebay. 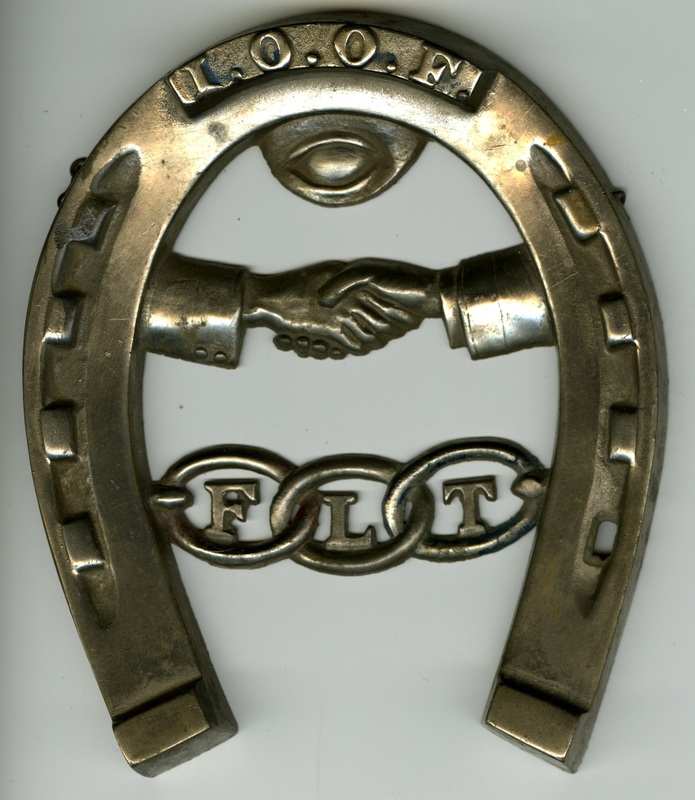 What inspired me to buy it was the shaking hands, the Welcome, the use of “Auld Acquaintance” and the fact that the lodge is identified. 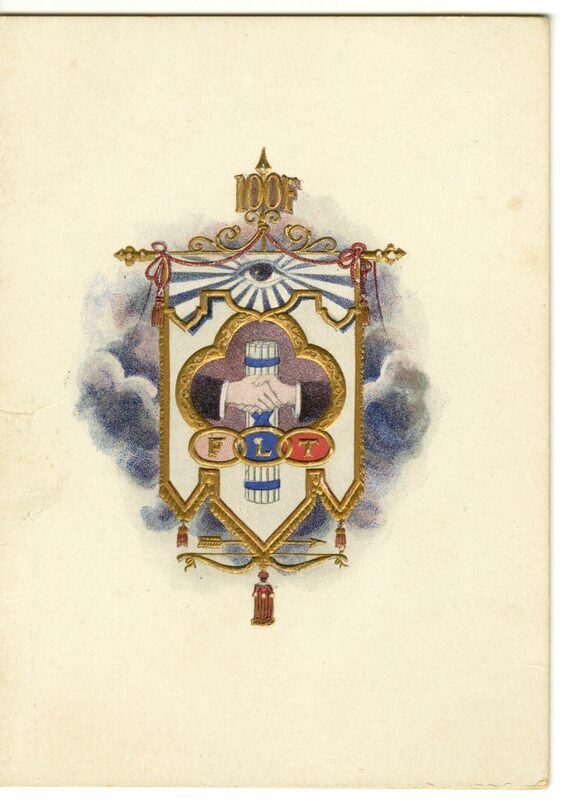 I received this slide with some other Odd Fellows slides. 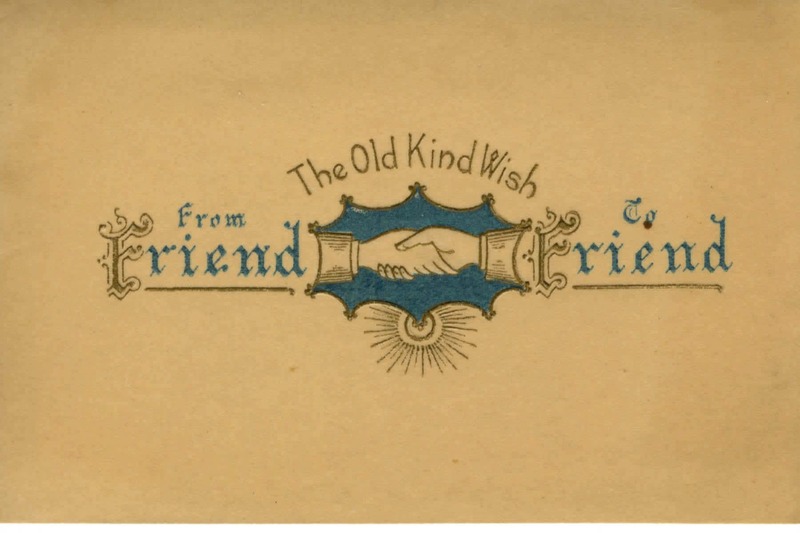 I like it because it’s a 19th century way of proclaiming someone’s your BFF. This is a one sided card with a clean back. The image is wonderful but I don’t know what it is. 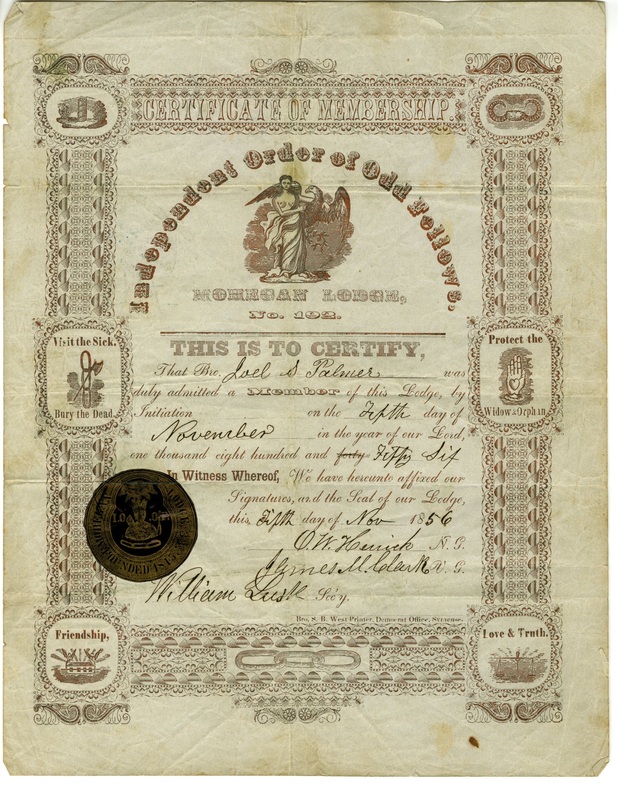 Maybe, it’s just a piece of ephemera? I bought it because I really like the cowboy silhouette. Here’s a photo I bought. 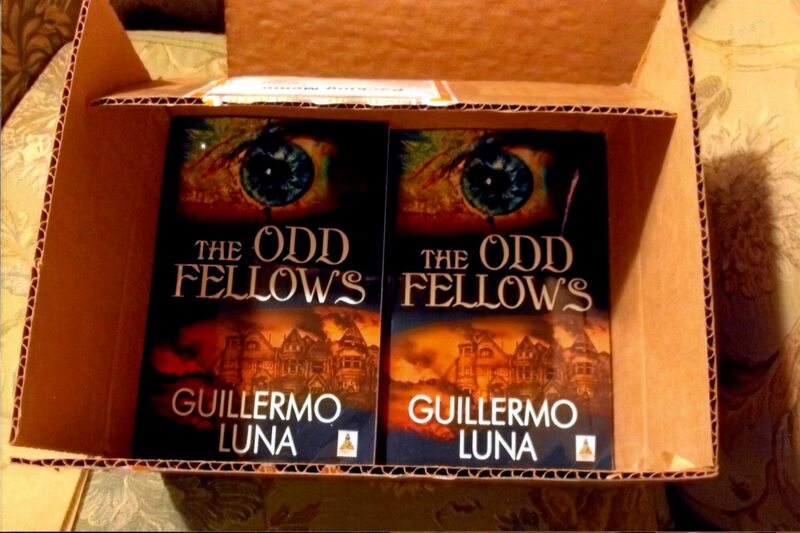 If you click on the image (twice) and look at the books on the desk you can see that one of the books is titled, Odd Fellowship. 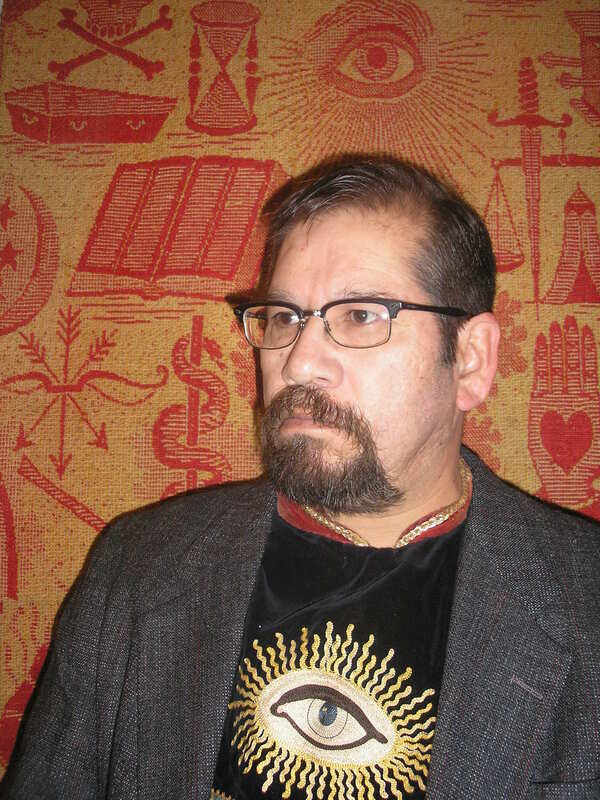 Great fake background too. 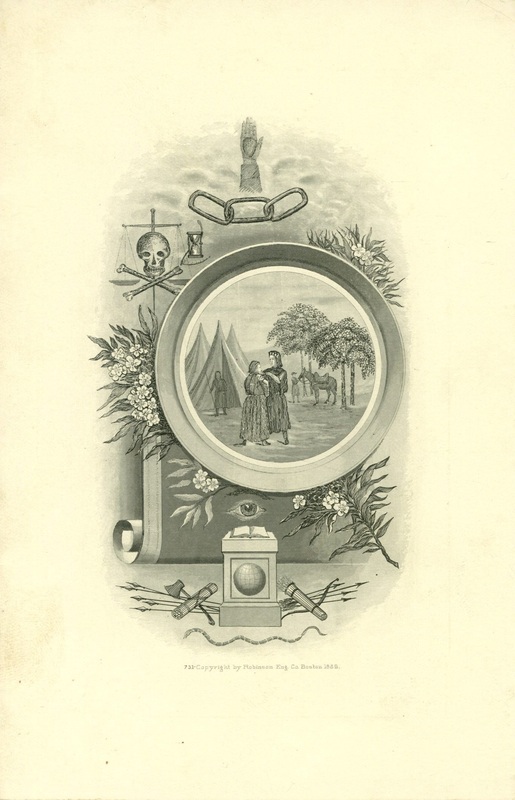 I found this encampment ribbon online. 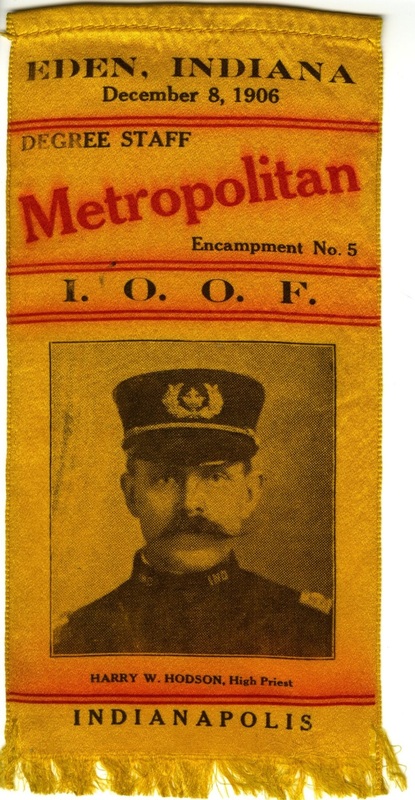 I’m still not sure what an encampment is but the man’s image is very turn of the last century and it’s on a silk-like ribbon. I bought this online. That winged hourglass always gets me. 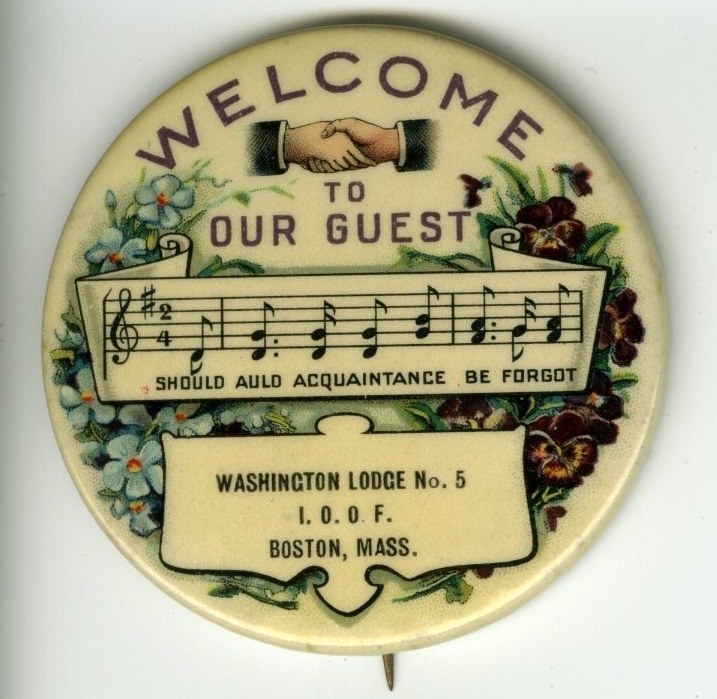 It’s a program for the 25th anniversary of the founding of FRIENDSHIP LODGE (no. 69) in Springvale, Maine. 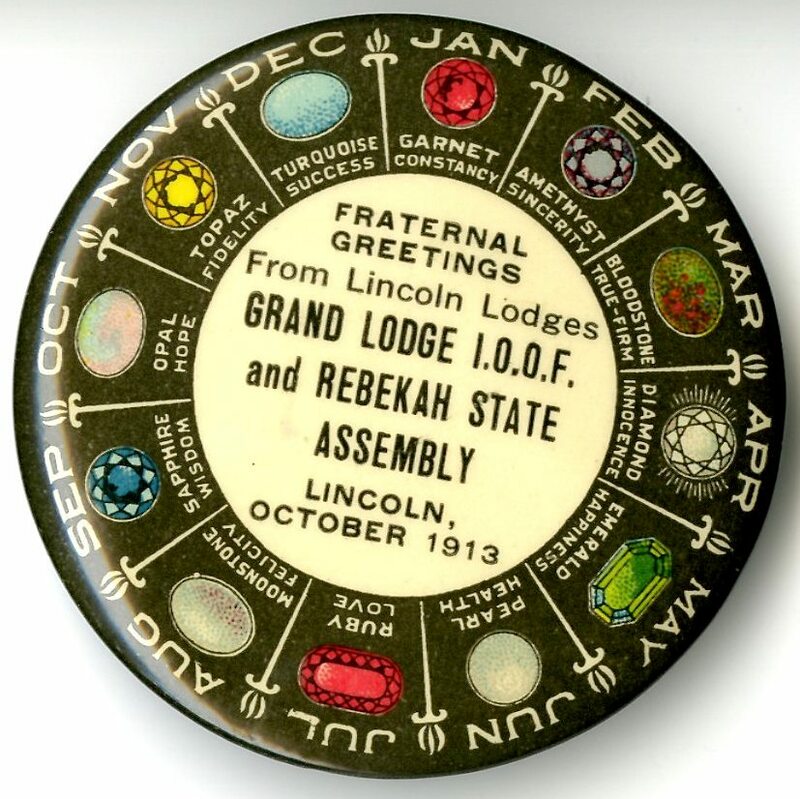 The event took place on Friday, March 12, 1897. I took this picture at work. 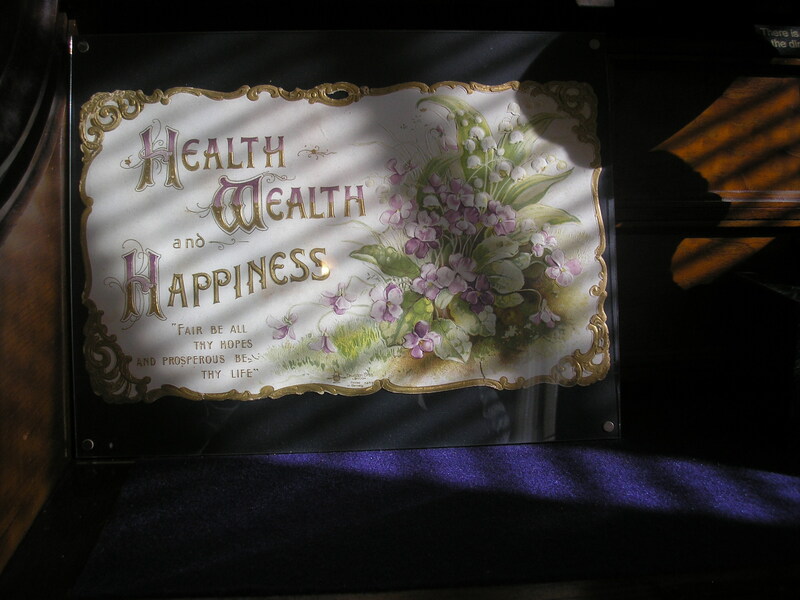 I put the pennant on a bookcart and then rolled the bookcart under a skylight. 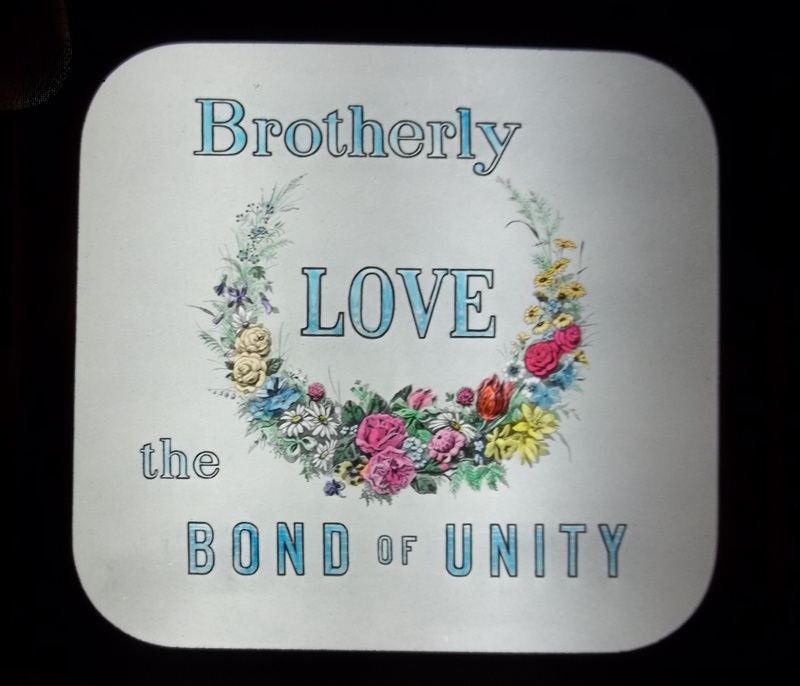 (The pennant wouldn’t fit on my scanner.) 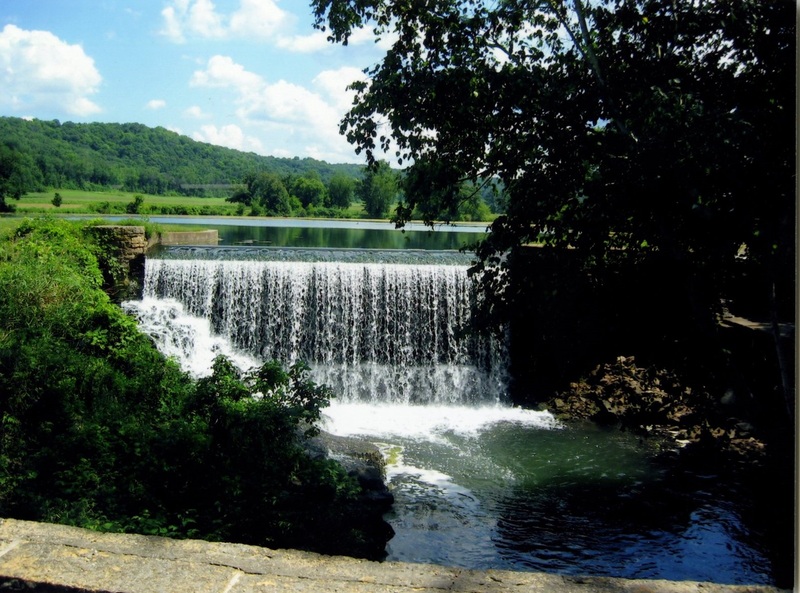 There is a Phoenixville, Pennsylvania — which is located 28 miles northwest of Philadelphia. 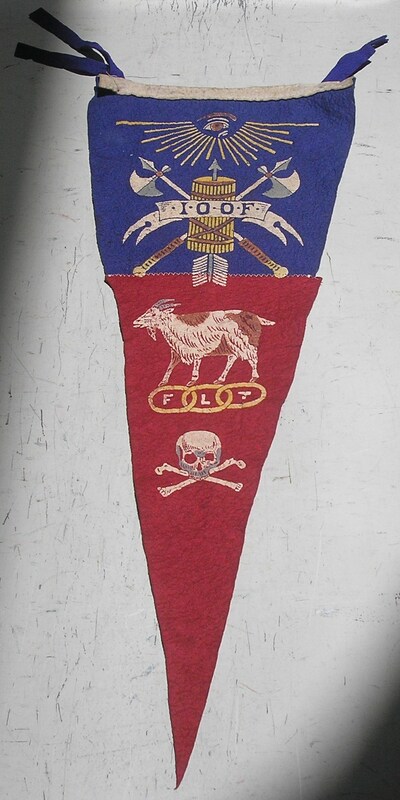 I suspect that’s where this pennant comes from. uh, I agree with the sentiments. I have questions about this photograph. 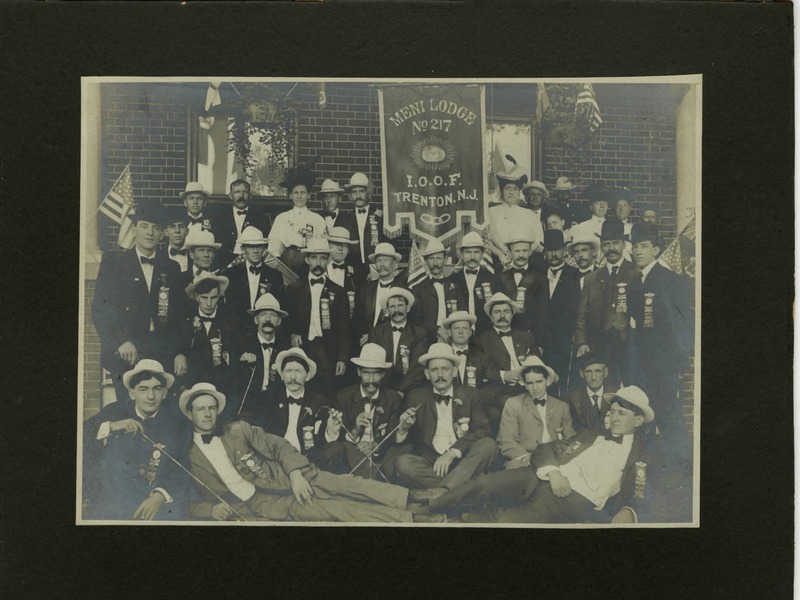 It was sold as an Odd Fellows photograph and that hat does look like one of the hats in my lodge. I’m not 100% sure but I’m 99% sure this guy is an Odd Fellow. The photograph is from Manchester, New Hampshire. Oh, and that is one very cool goatee. I wish I looked like him but a younger version of him. It’s a calendar from 1923. All the months are there. It was never used. 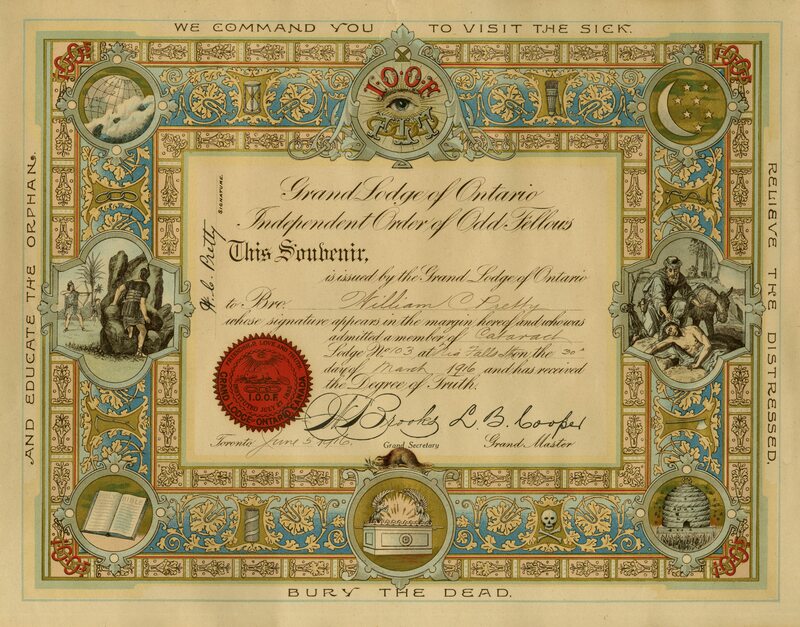 A certificate of membership from 1856. 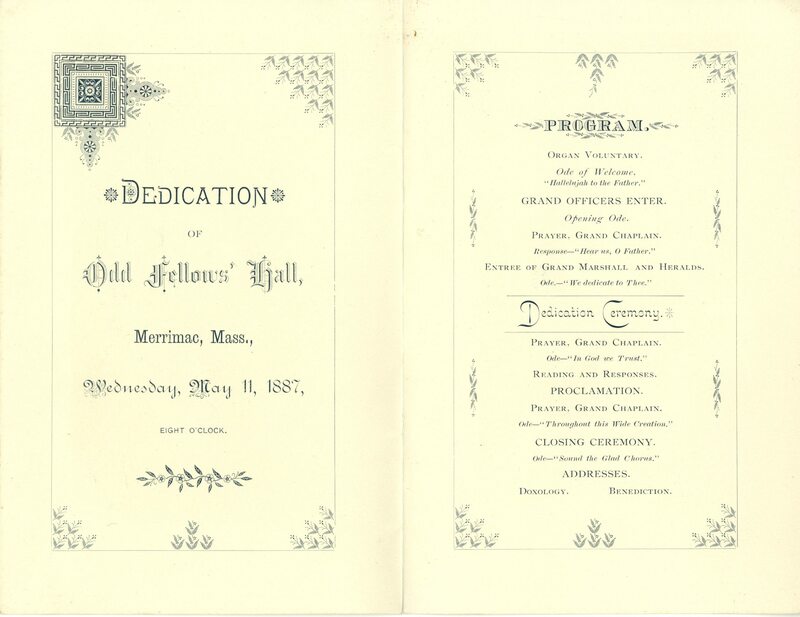 This complimentary banquet was held in Horticultural Hall in 1888. Inside it says they dined on Oysters: Raw on the Half Shell OR Escalloped AND there was a selection of cold meats including Ham, Roast Sirloin Beef and Tongue. 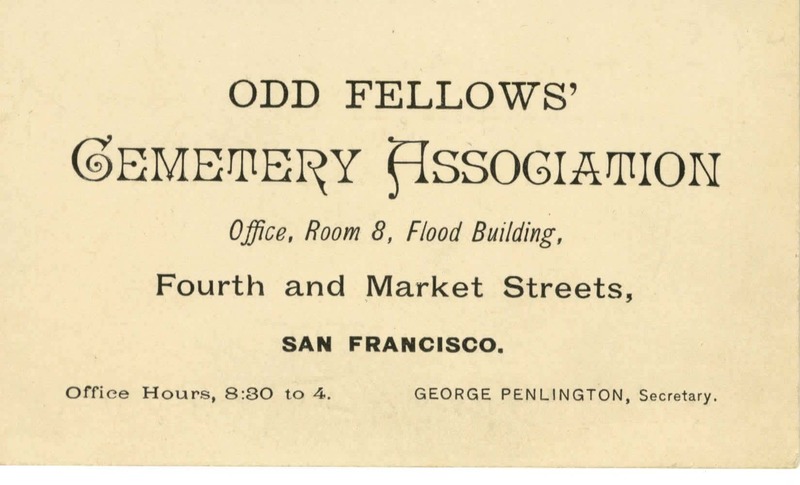 The Odd Fellows had cemeteries around the world. I know they still exist in New Orleans, Los Angeles and San Francisco. They look like a father and his sons to me. 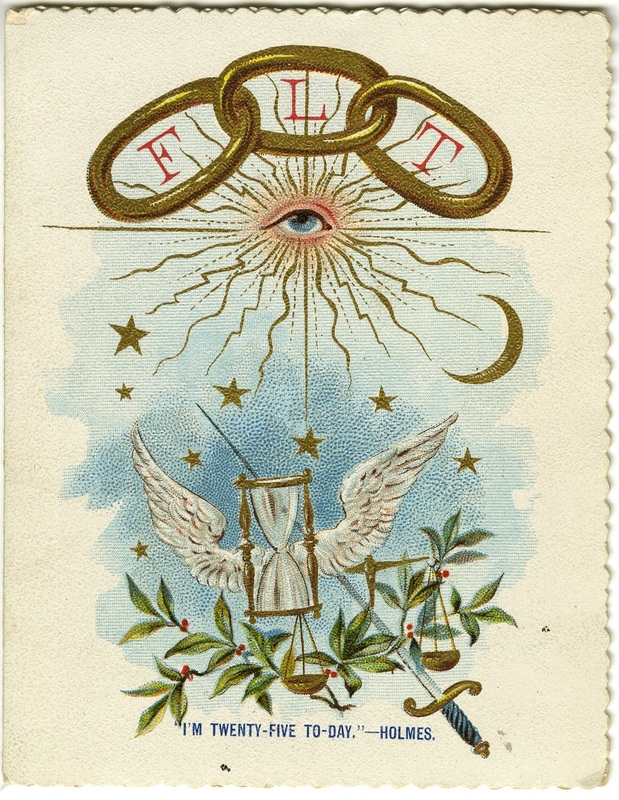 I was drawn to this program’s image of an hourglass with wings which must symbolize “time flies.” This is a program for the public installation of officers at the North Star Lodge (no. 144) in Townsend, Mass. on January 3, 1900. 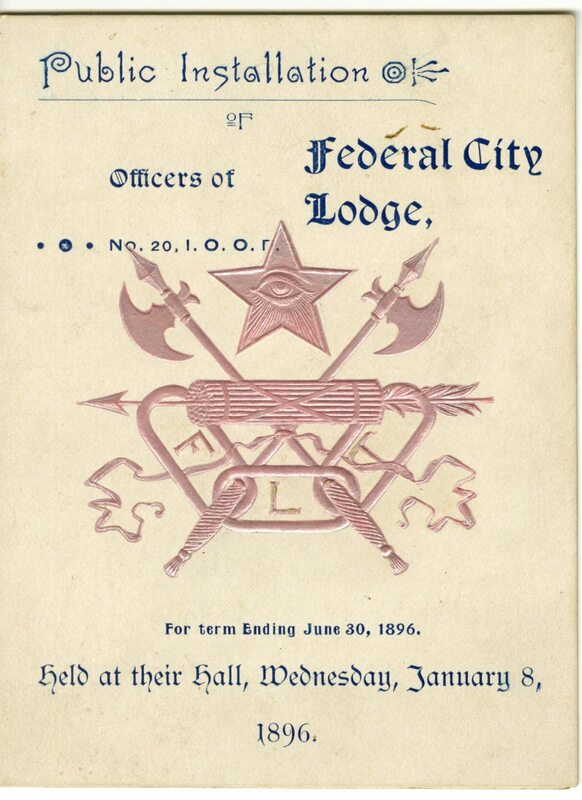 A handout marking the 5oth anniversary of the Odd Fellows in 1869. Meni Lodge (no. 217). 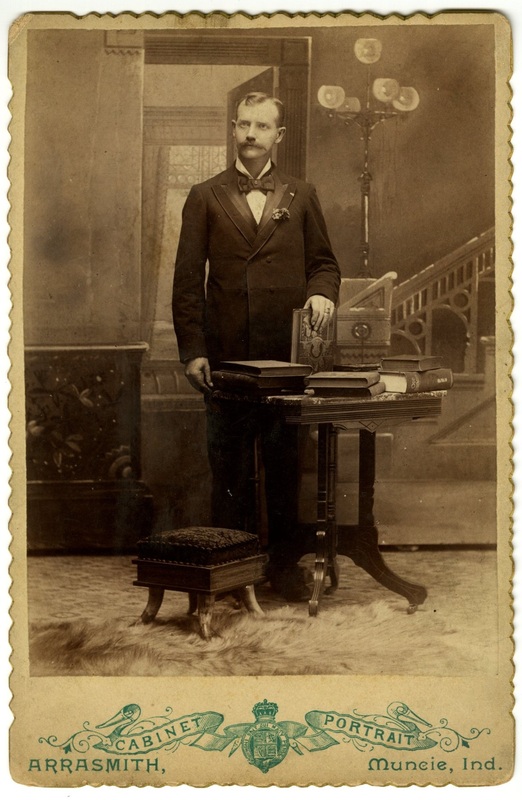 This photo has a turn of the century air. 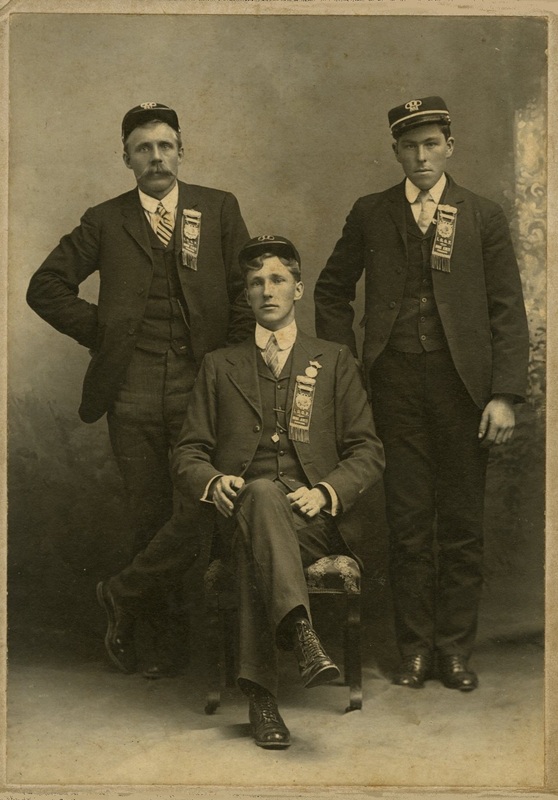 The man in the front row, second from the left, has a Great Gatsby demeanor about him. On the back he is identified as Nathaniel Bound. I think it’s a calling card. This guy was really creative. I’m trying to think of a way to re-interpret it for myself. The way he spelled Los Angeles just adds to its charm. It hangs in my living room. 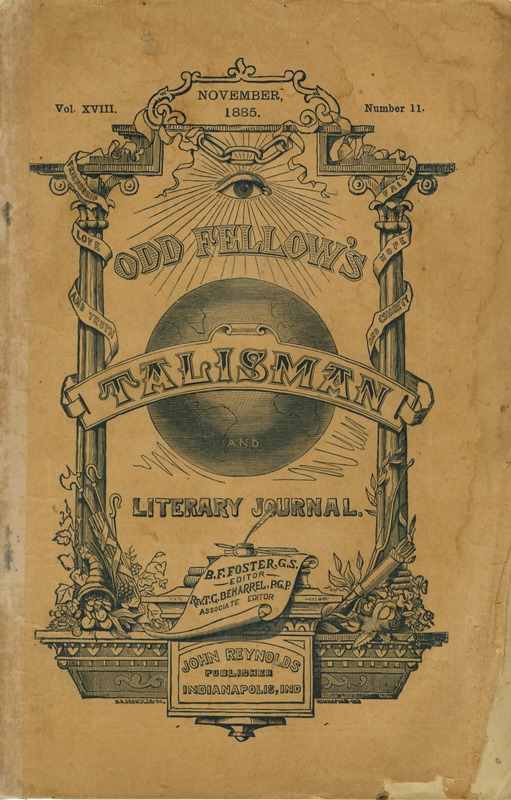 Odd Fellow’s Talisman and Literary Journal. November 1885. This publication seems so old but for reference, Washington Square, by author Henry James, was published in 1880 and Dracula was published in 1897. 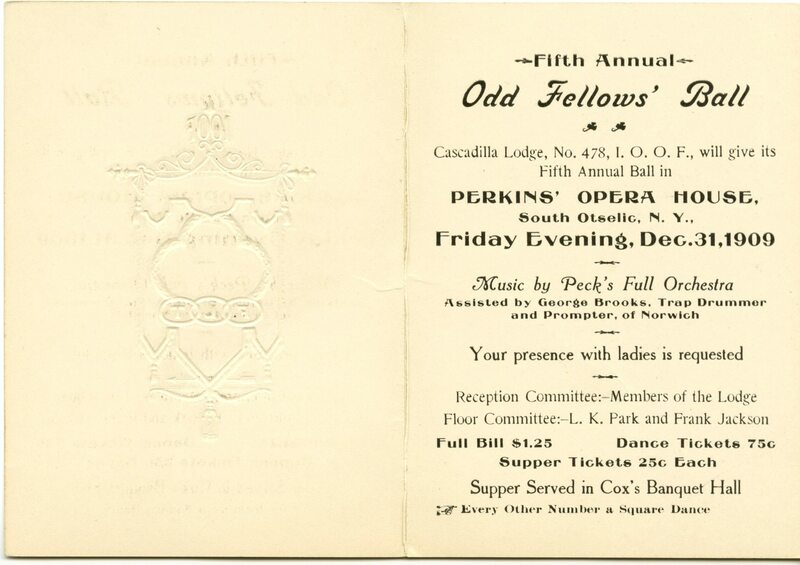 In 1885, the Odd Fellows had been established, in America, for over 65 years. 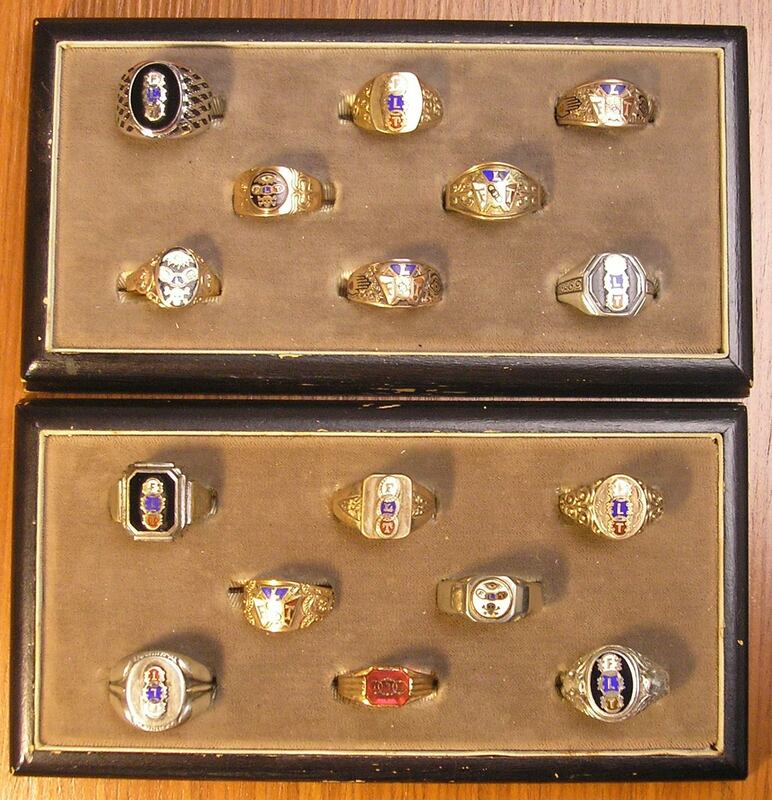 I’m always buying Odd Fellows rings. 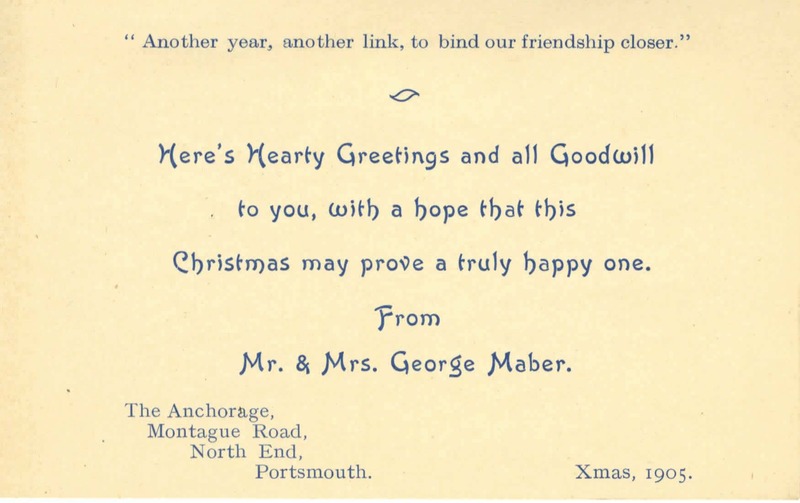 It’s a Christmas card from 1905. I think it was hand made. The inside certainly seems very specific. 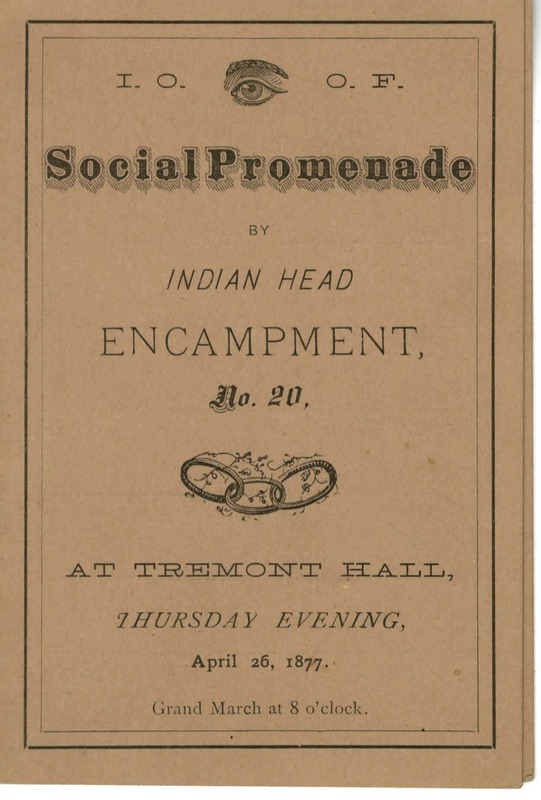 A Social Promenade. This is something I would have liked to go to mainly because I don’t know what it is. 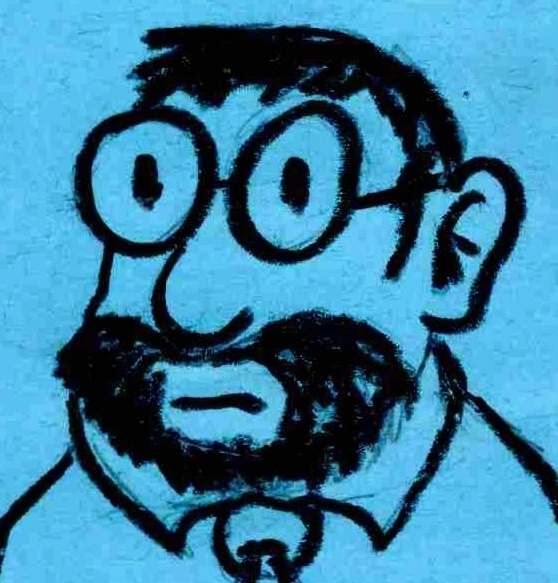 At most social functions I’m usually standing off by myself — trying to decide if I should stay or just go home. 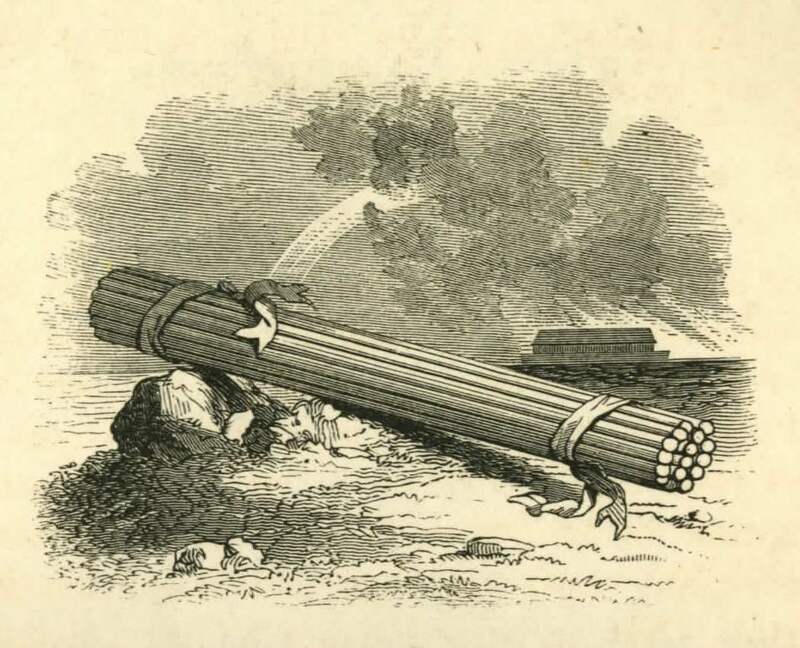 In Latin it says” VIA UNITA FORTIOR” which translates as “United strength is stronger.” That refers to the bundle of rods the man has in his hands. One rod alone can be broken but many rods bound together are more difficult to break. A modern day translation would be: there’s strength in numbers. This is a San Francisco dandy. 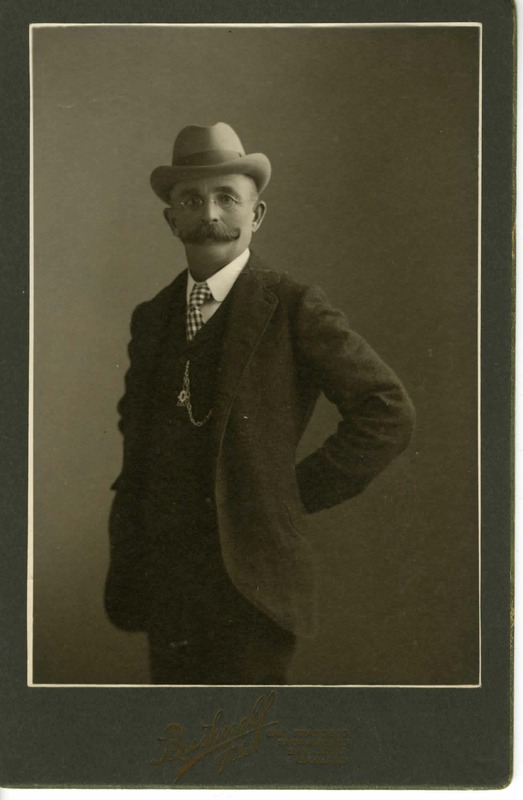 Unfortunately, there is no identification of who he was on the back of this card.He looks great (I especially like the tie, glasses, mustache and hat). If you look at his watch fob, below the white diamond, you can see “the three links.” He’s such a fancy pants. I wish I looked like him. Unfortunately, I usually have a sweaty, unkempt look. 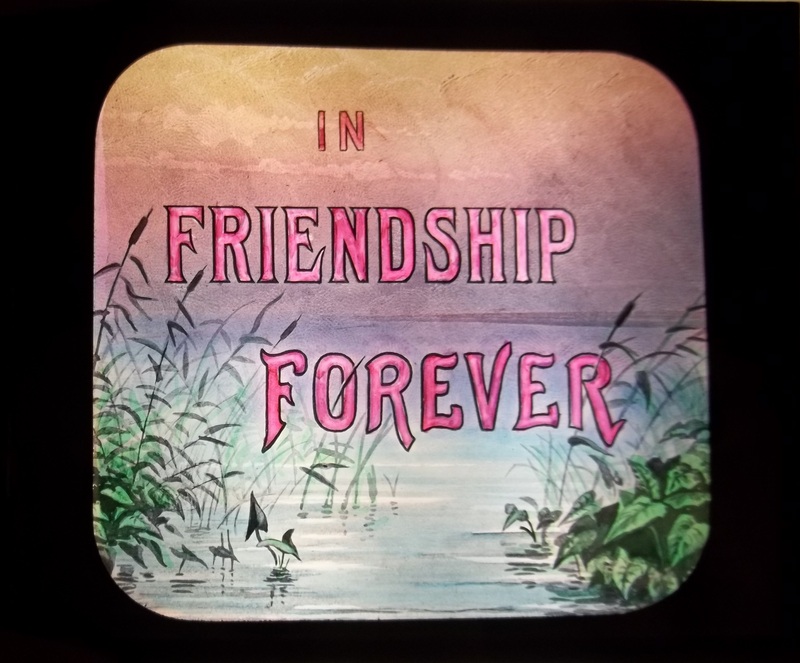 This is a magic lantern slide. 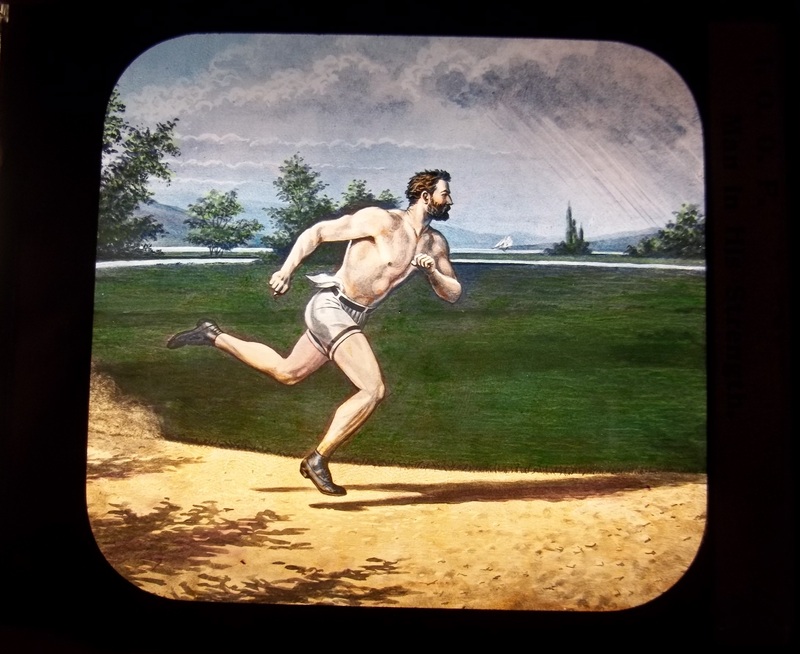 I don’t really know what it’s purpose was but it does say on the slide: IOOF Man in his Strength. I just think it is SO cool. I held this up to the overhead light at work and then took a digital picture of it. It came out good. 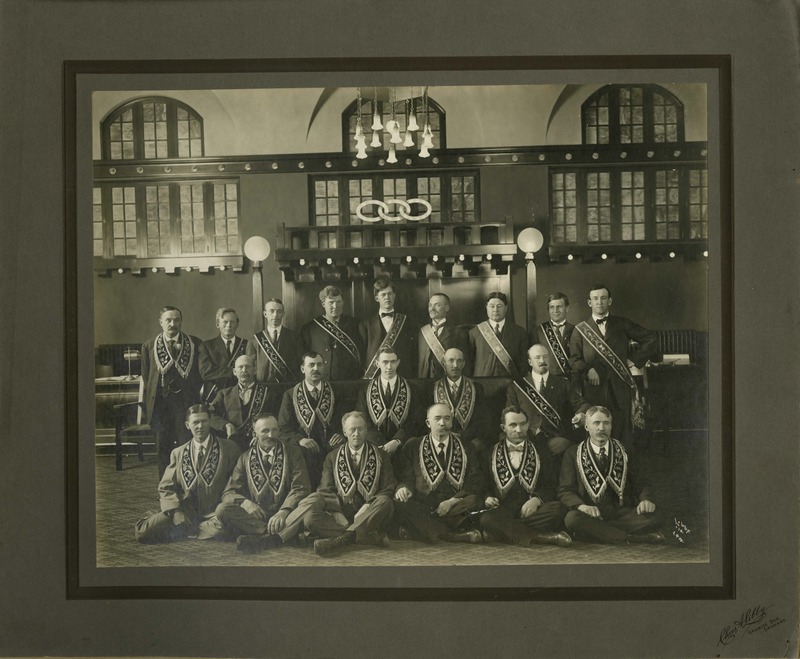 This lodge is not identified on the photograph BUT the photographer is Charles A. Libby, Granite Block, Spokane so this group must have been a lodge in Spokane or the surrounding area. I find the dynamics of this photo interesting. 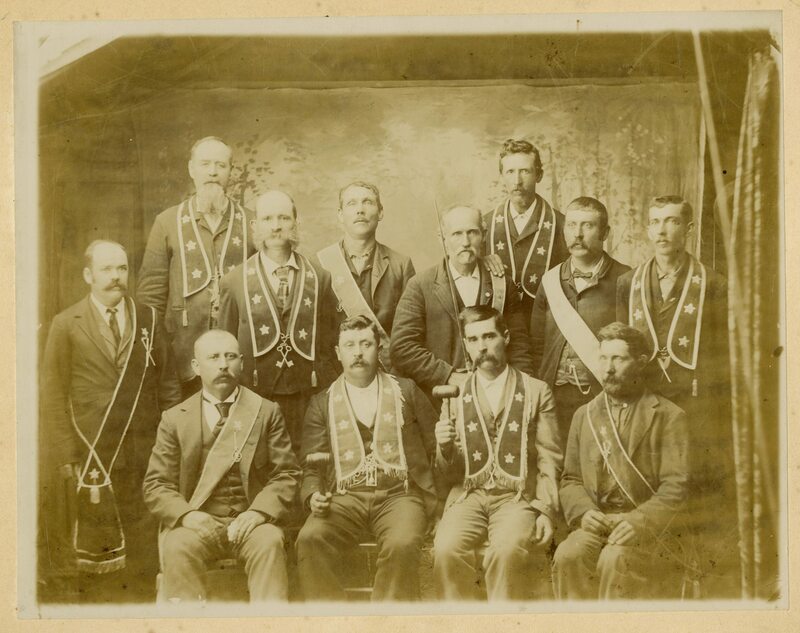 With the exception of three individuals all the members look very “country-fied.” The three that don’t look that way are on the far right side of the photograph. The two standing up in the back row and the man sitting directly in front of them. He’s got a great face and he looks like Vladamir Lenin but his body language says he’s not quite as tight with the other members of the lodge as he should be. It could be just my impression. 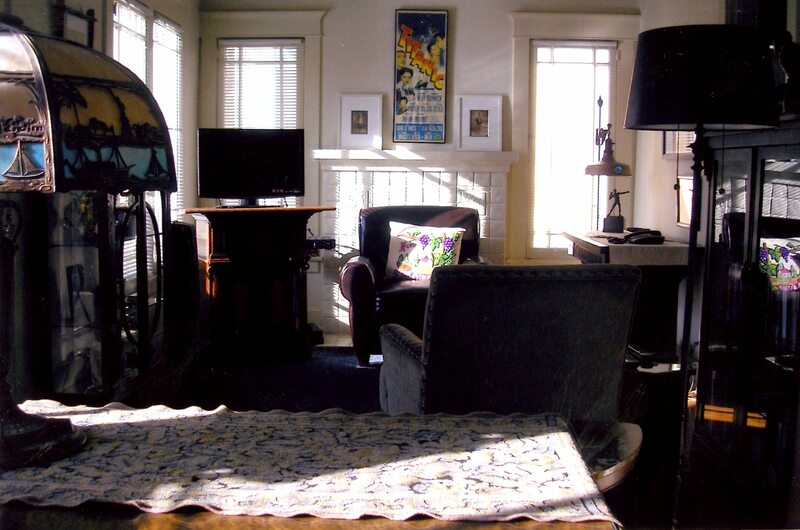 I love the room itself with the woodwork, the light fixtures and especially the three links. I wonder if they changed secret passwords on a regular basis? 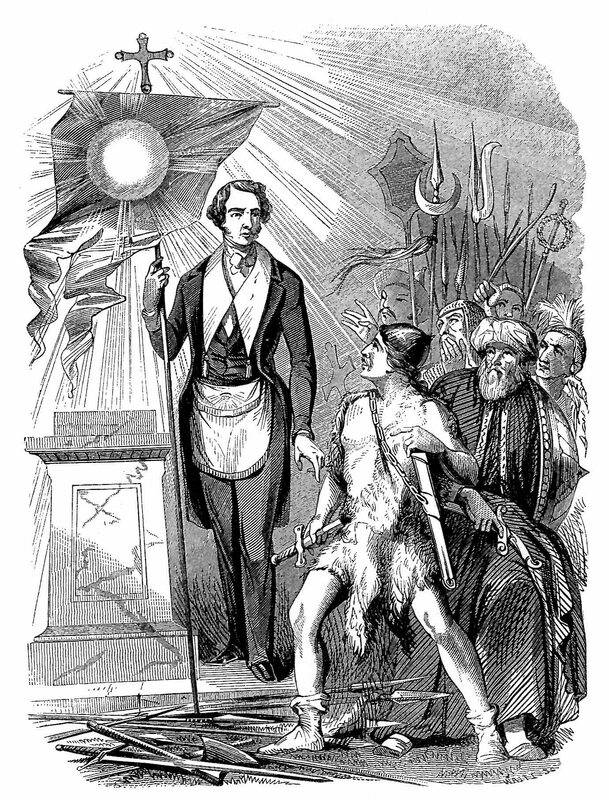 United States Lodge Ball. I bought this last year and it’s hung in my office at work. 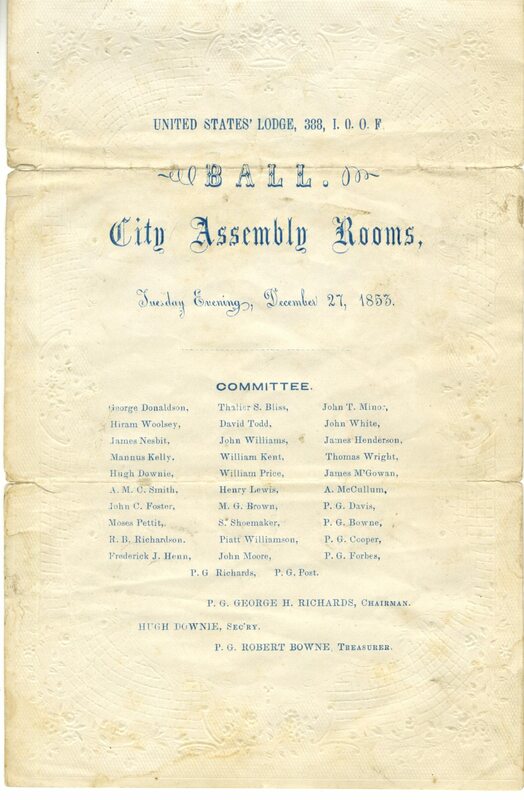 This ball took place December 27, 1853! 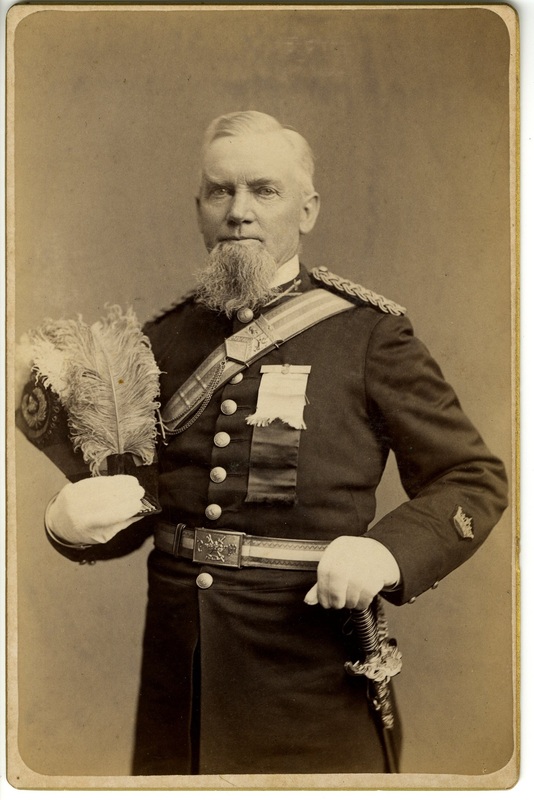 That was before the outbreak of the civil war. 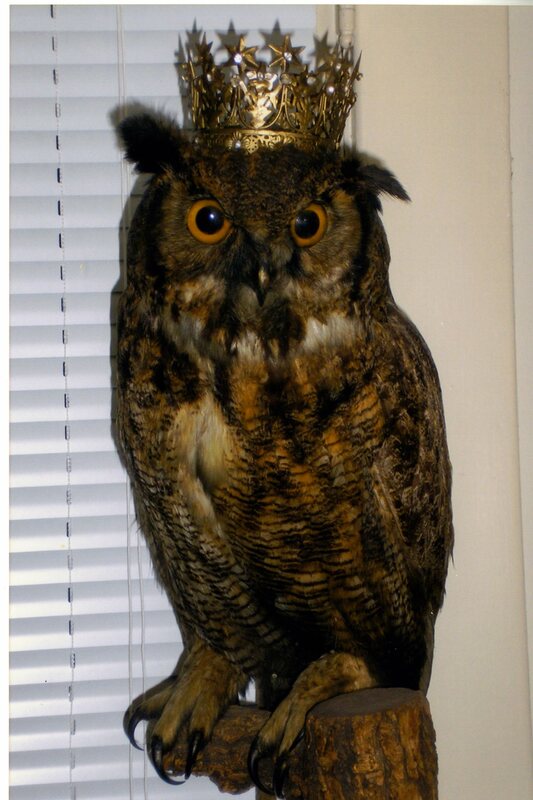 Okay, this is a photo I bought off Esty. 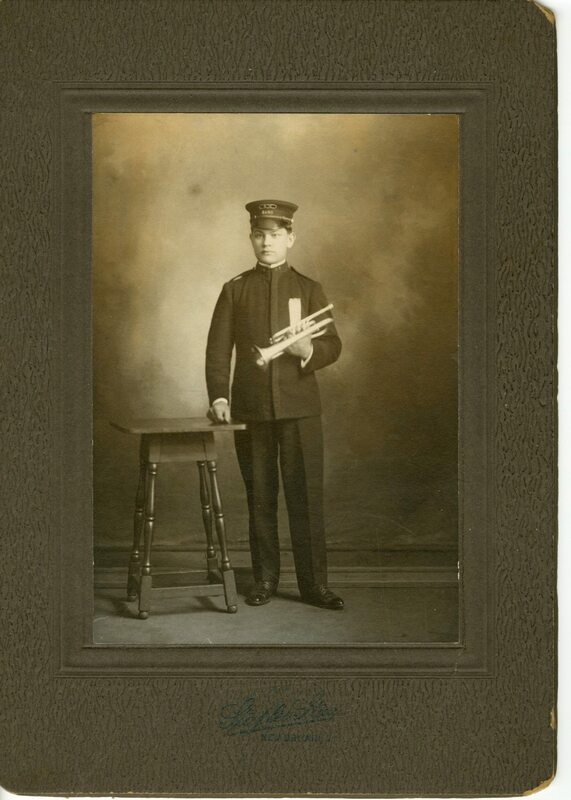 I purchased it because the photo’s in great shape and the location of the photograph is identified. In this case it’s Carbon Hills, Ohio. All the guys look super fantastic with their instruments and that major(ette) guy is very dramatic looking. I have no idea where these guys are from. Some of them look sophisticated civilized and others look like they came out of log cabins in the mountains. I bought it because of the contrast between the men. That guy sitting down on the right — he looks like a mountain man. What did these men talk about? The photographer’s location appears to be New Britain, CT. The 3 links and the word BAND on his hat sold me on this. This is not the cheeriest slide but visually it’s nicely composed. It’s a bumper sticker. It hangs on the wall behind my computer at work. It reminds me to be courteous. Another pennant I photographed at work under a skylight. Notice the goat. 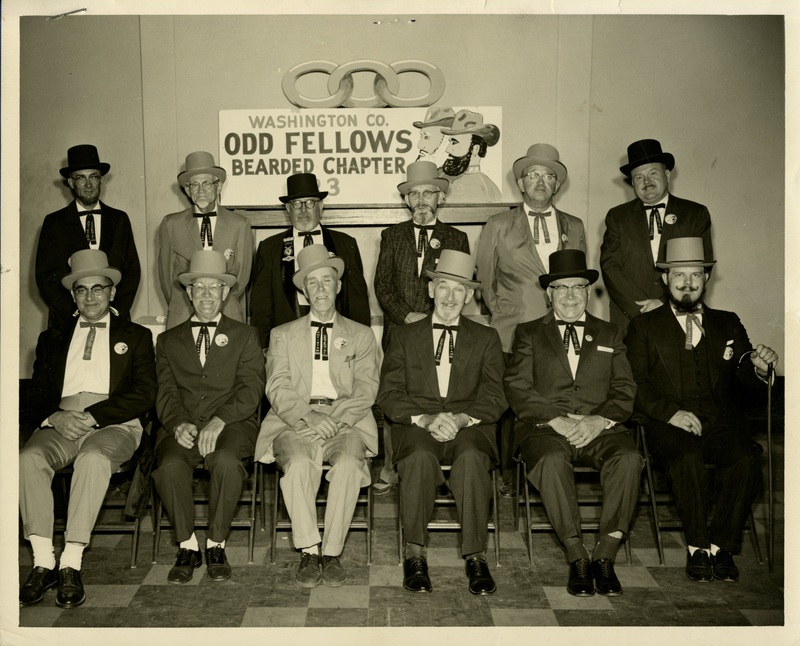 I have seen goats associated with the Odd Fellows on numerous occasions. 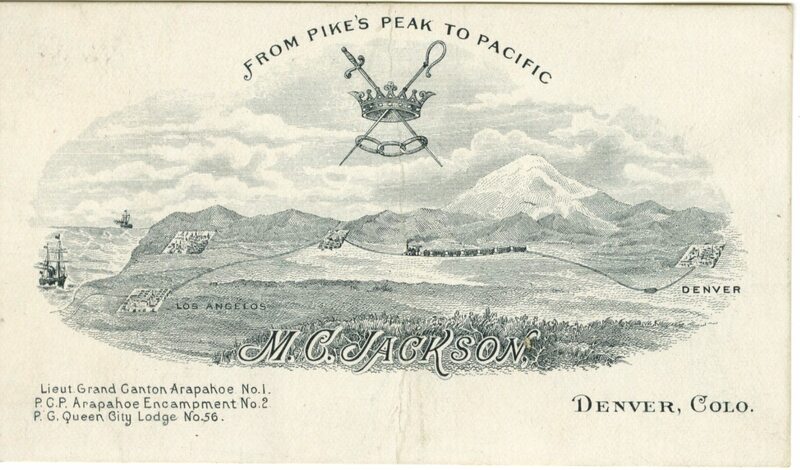 Often on postcards. What’s up with the goat? I still haven’t figured out the significance. This hangs on the wall in my office at work. The colors are rich and bright. It’s from 1916. It’s a glass slide for a slide projector. I put a piece of white paper behind it so it would scan better. I’m so glad I bought this. 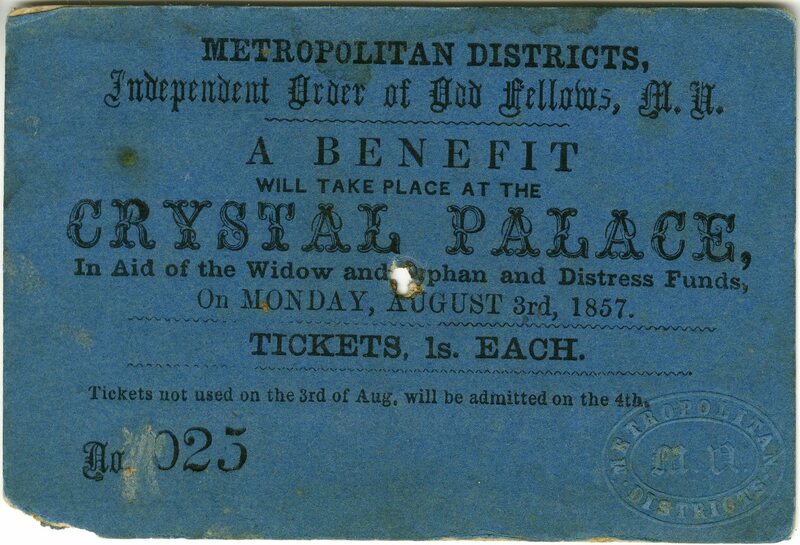 It combines two of my interests: The Odd Fellows and World’s Exhibitions. I like the typeface on this program. Especially, the words “Public Installation” and that weird symbol beside it. The inside is mundane. It lists the officers on one side and the entertainment on the other but whoever designed the cover knew something about design. 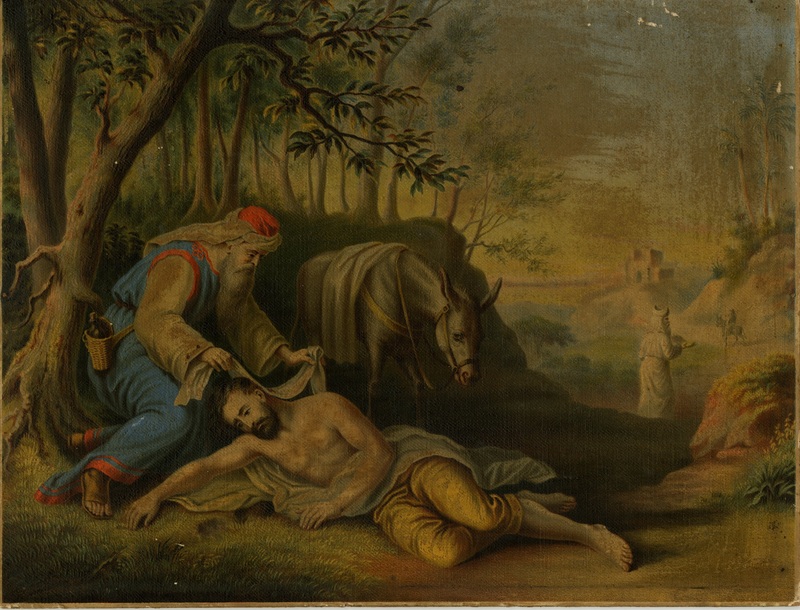 I never understood how The Good Samaritan fit into the Odd Fellows but as of Wednesday, August 6, 2014, now I do. 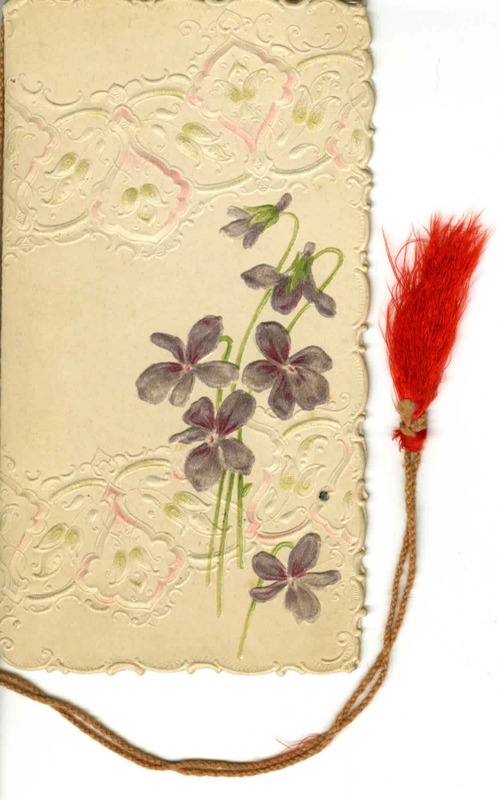 Written in pencil on the back of this item is: “From H.E. Stevens TO Oakfield I.O.O.F. No. 603, Aug 10th/37. 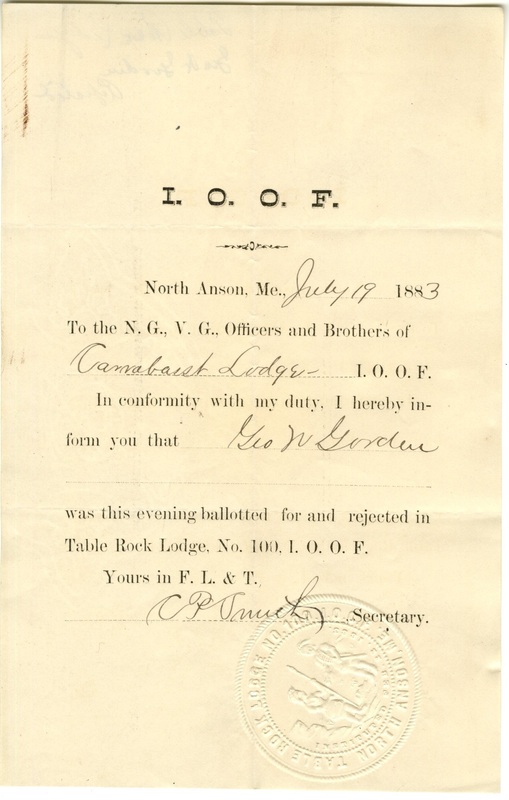 It’s a banquet program for a lodge in Camden, Arkansas in 1891. 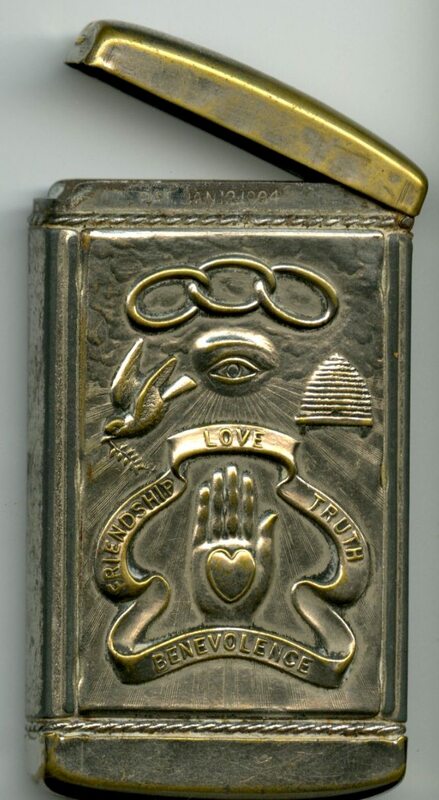 I’ve never seen “peace, harmony and prosperity” together on an Odd Fellows item. I also like how there appears to be movement in the banner. 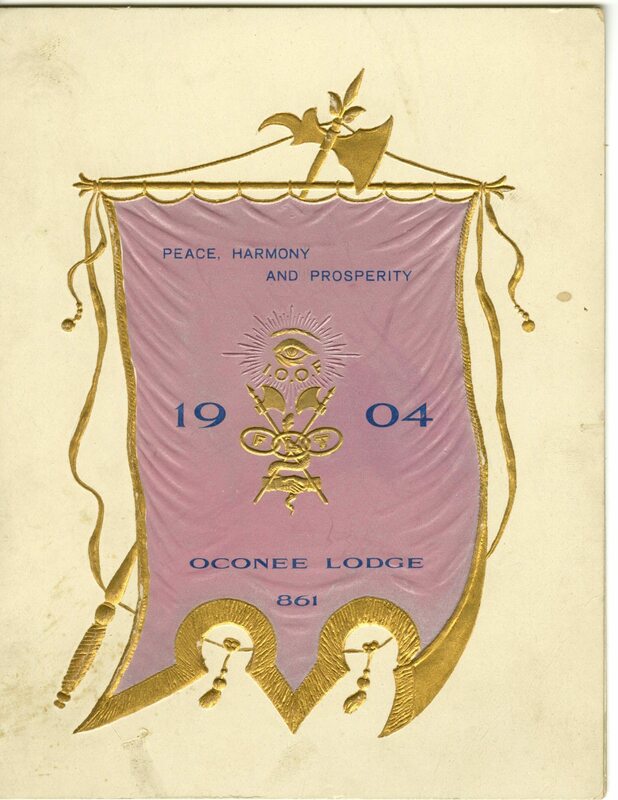 The brochure is for the First Annual Reception and Ball of the Oconee Lodge (held at the Masonic Temple) in Ontario, NY on Thursday evening, March 4, 1904. How could they have these balls on a Thursday night? Didn’t people have to work in the morning? 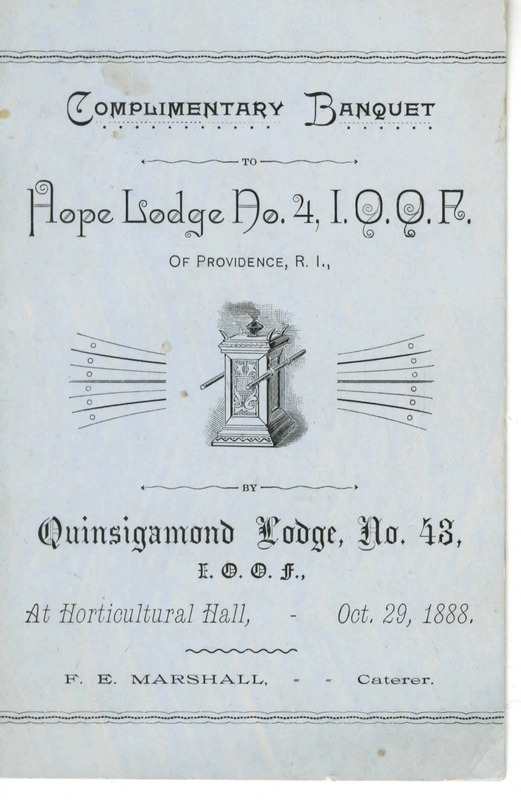 This is a wonderful cover for an Odd Fellows building dedication in Merrimac, MA. In 1887! This is the inside of the program. I like the program’s Eastlake style. The event also took place on a Wednesday night. Hmmm. Once again, that seems odd to me. 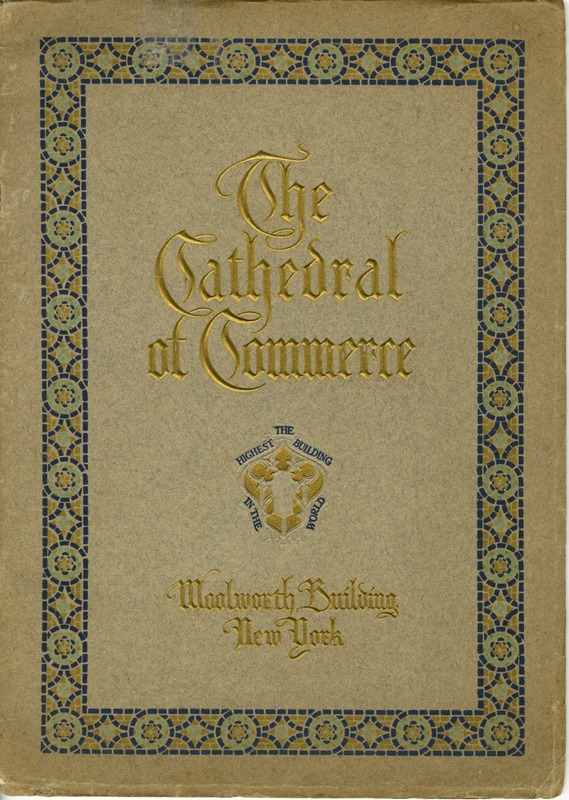 The back cover of the program. On the side of this slide it says: “I.O.O.F. SUBORDINATE DEGREE Meeting of David and Jonathan.” I had to do some research on Jonathan and David after buying this slide. 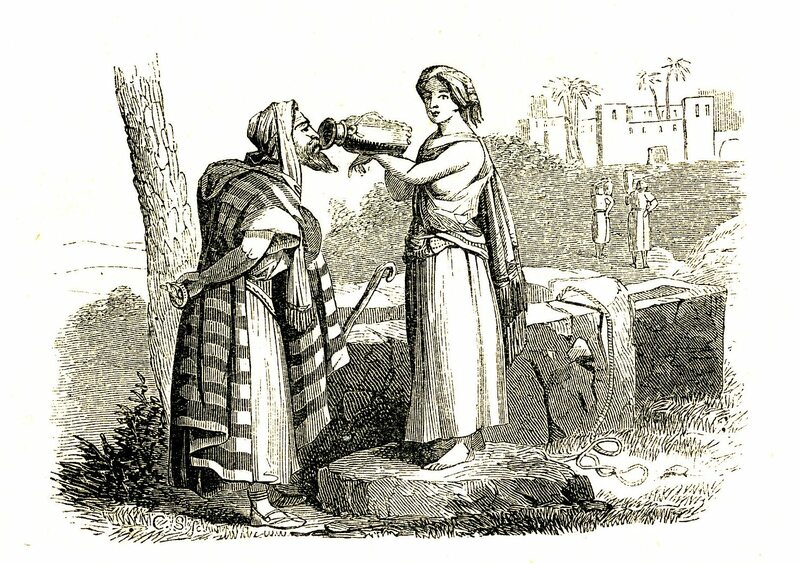 I found out that David is the David from David and Goliath. I found this IOOF rejection online and bought it. I wonder why the poor guy was rejected. 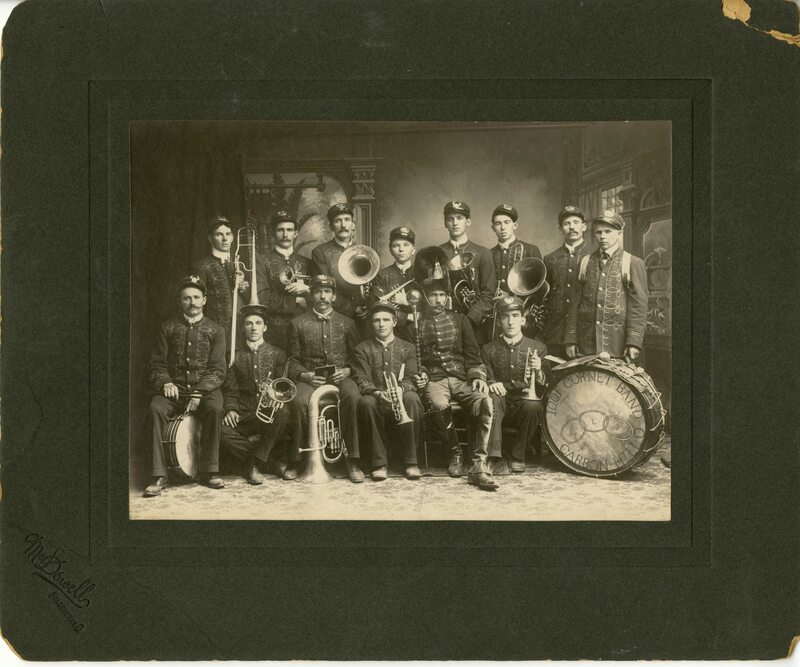 I bought this photo because of the young guy in the front row on the right. This picture is from 1962 and while that guy may be an Odd Fellow I also think he’s a beatnik. I like him. He’s great. I can see him sitting in a coffee shop, back in 1962, reading poetry and smoking a cigarette. 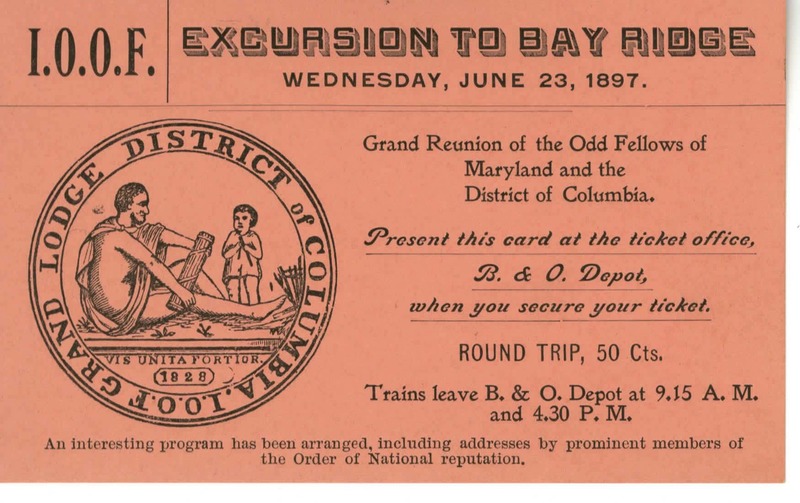 On the back it says the photographer was Raup and Raup was based in Hagerstown, Maryland. This is for a Ball. The cover is very tasteful. 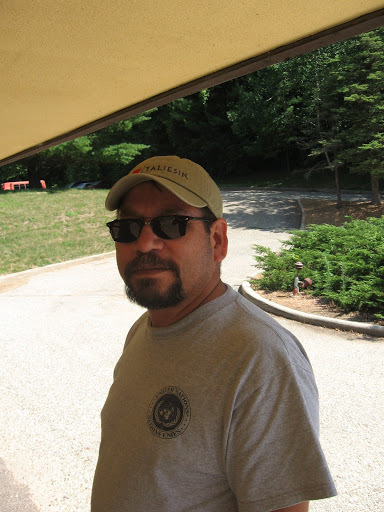 Photos of me, Guillermo Luna. 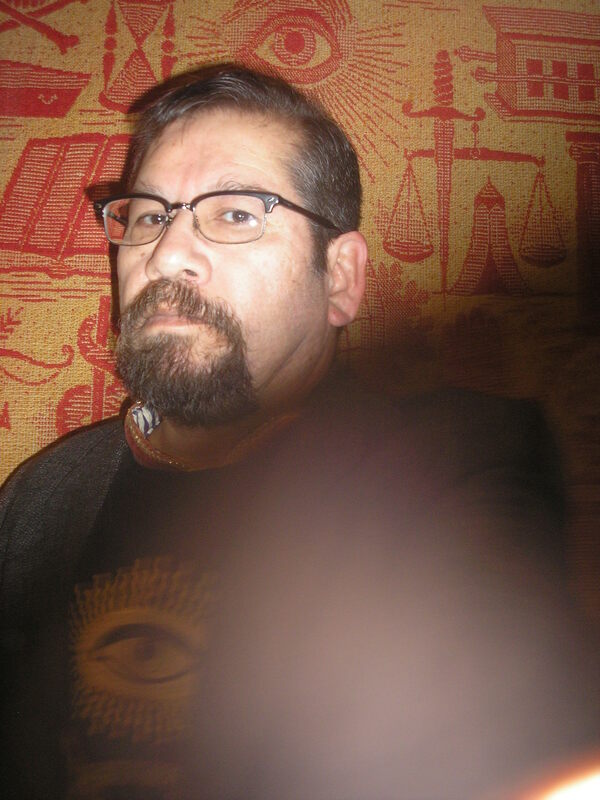 I enjoyed taking these photos though there must be something wrong with the camera because I look old. 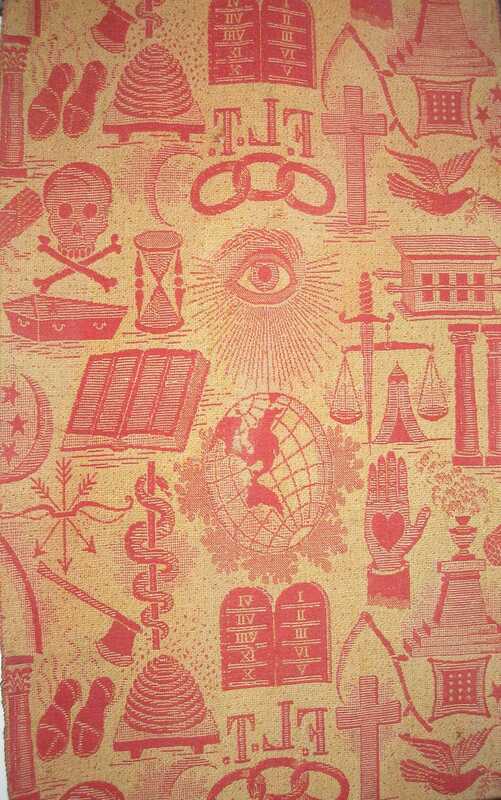 Above me is the all seeing eye, the hourglass, and the skull and crossbones. These photos were taken with a timer so obviously there were some mistakes. 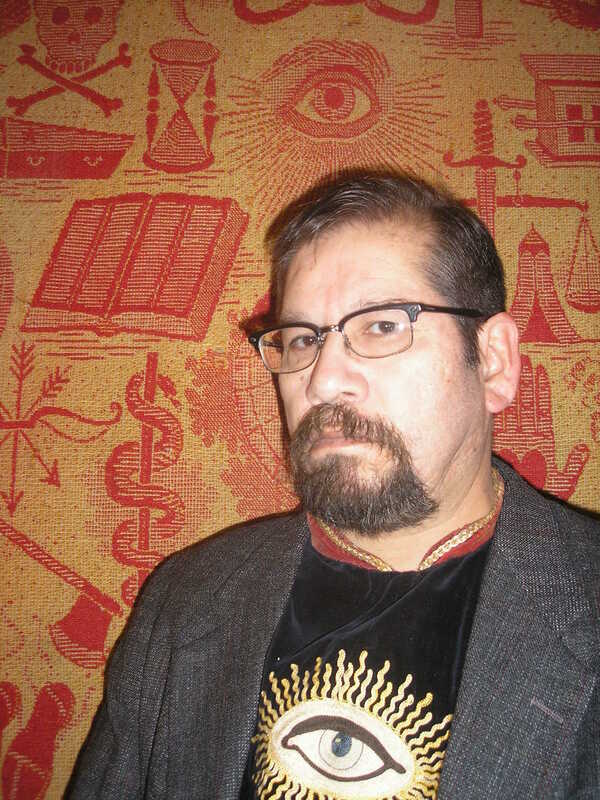 I like this one but I need to trim my van dyke. 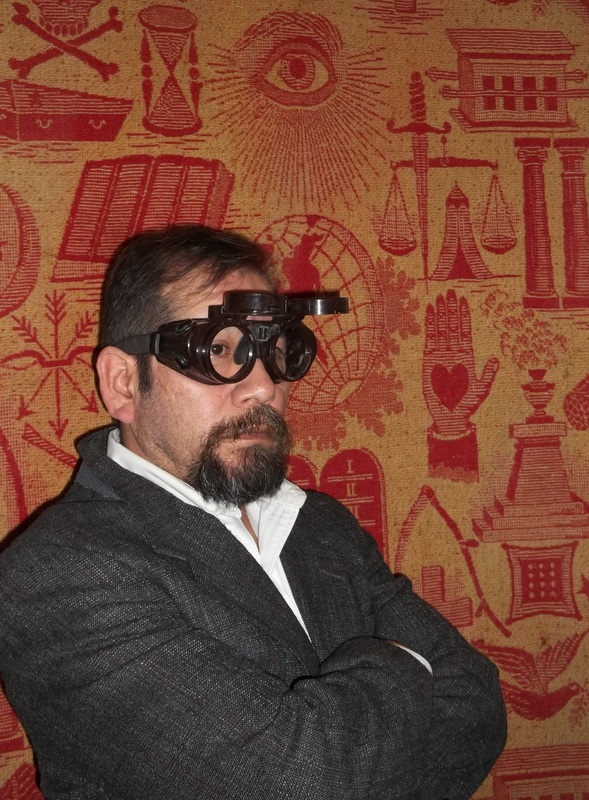 Me and God’s eye are both looking at you. This is the garment I’m wearing under my jacket. It’s a little soiled and stained but I haven’t tried to clean it. 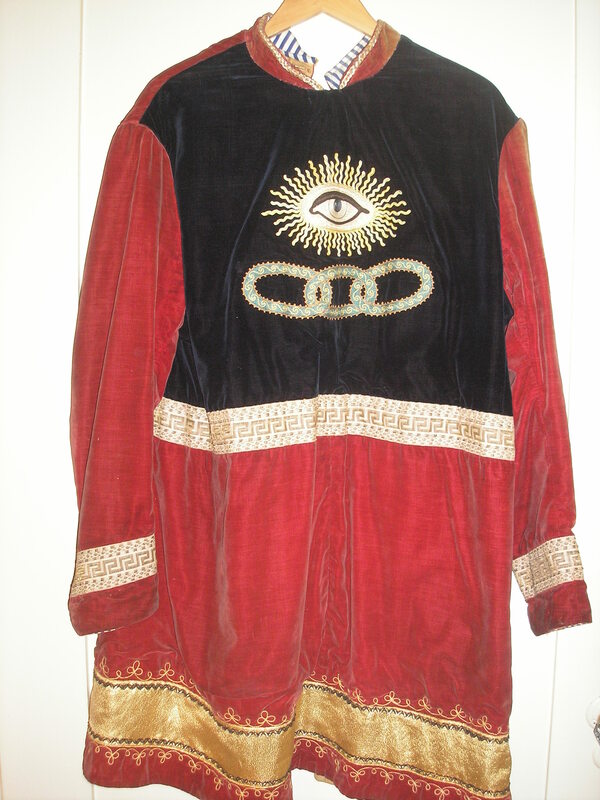 It would have been worn in an Odd Fellows’ ceremony. I’m assuming they would have worn trousers or tights too. What kind of shoe goes with this? It would be a perilous choice. My suggestions would be either a leather gladiator boot/sandal or blue velvet loafers. 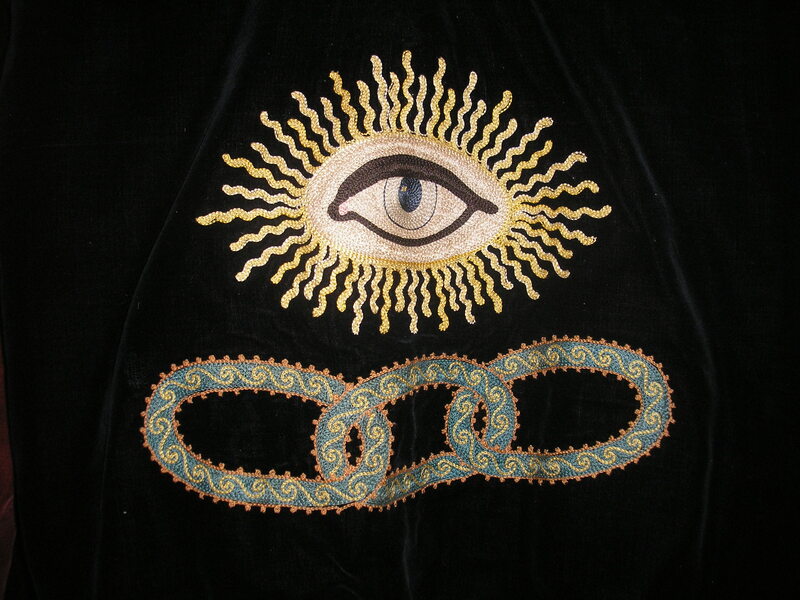 That’s the eye of God and three links. I know this is machine made but it’s pretty wonderful work. 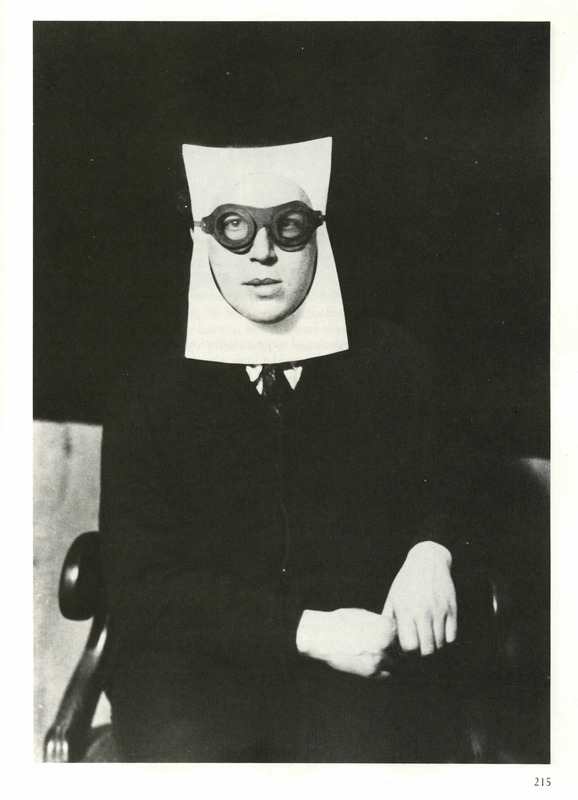 This is the surrealists Andre Breton. The photo is from a great book called Self Portrait Man Ray. It’s by Man Ray and it’s filled with wonderful and bizarre images. You should check it out. If your local library doesn’t have it ask them to inter-library loan it OR buy it. 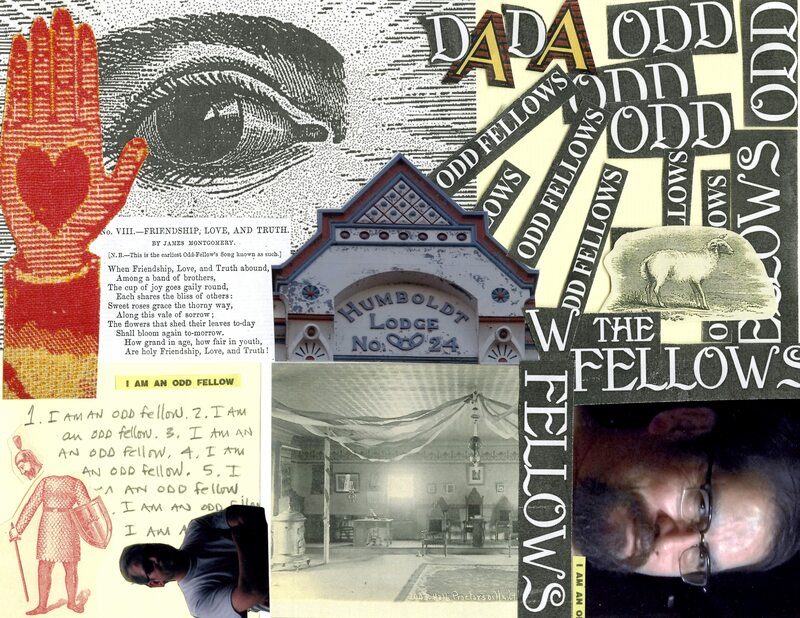 odd fellows DADA. I think I have too many visuals and I need more handwritten text. It’s an attempt. I found some “hoodwinks” on ebay. That’s supposedly what they’re called. 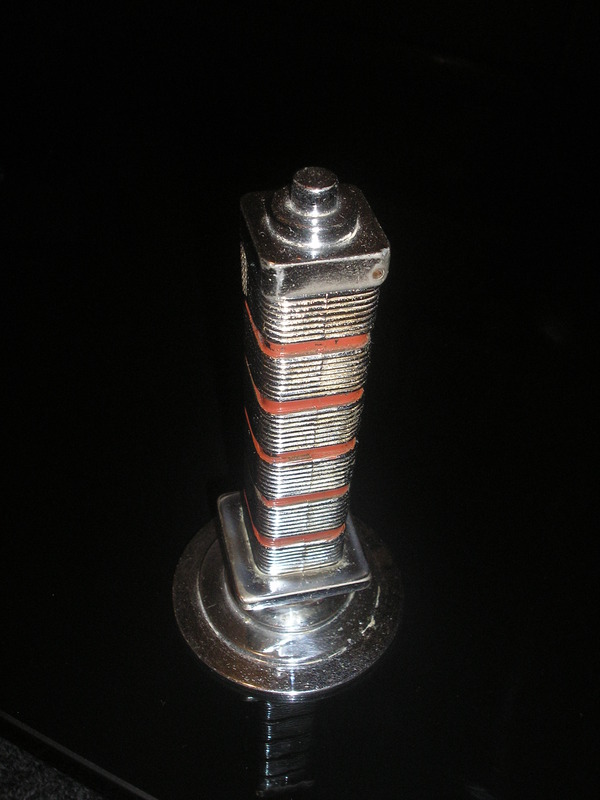 They’re made out of bakelite and probably from the 1940s. I had to take pictures of myself in them no matter how goofy I look. The top part, sticking out, comes down and renders the wearer totally sightless. 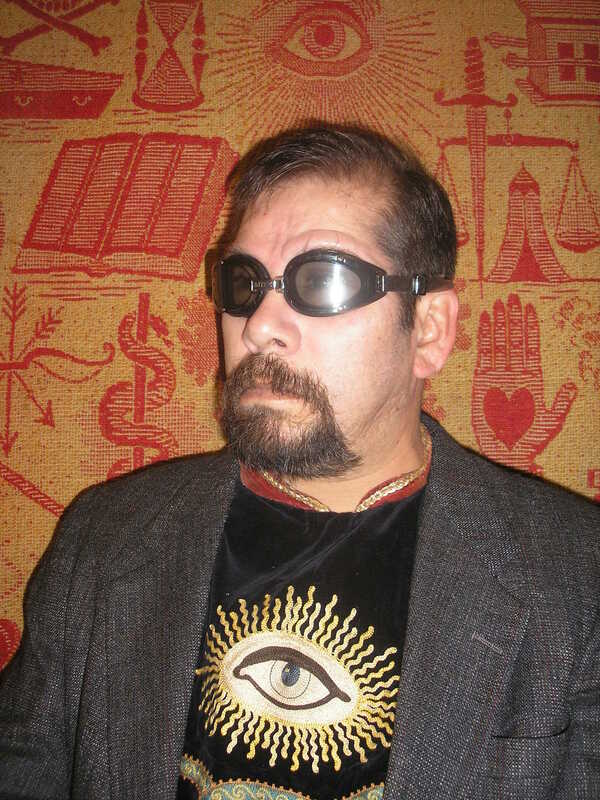 It’s my understanding they were used in secret ceremonies. 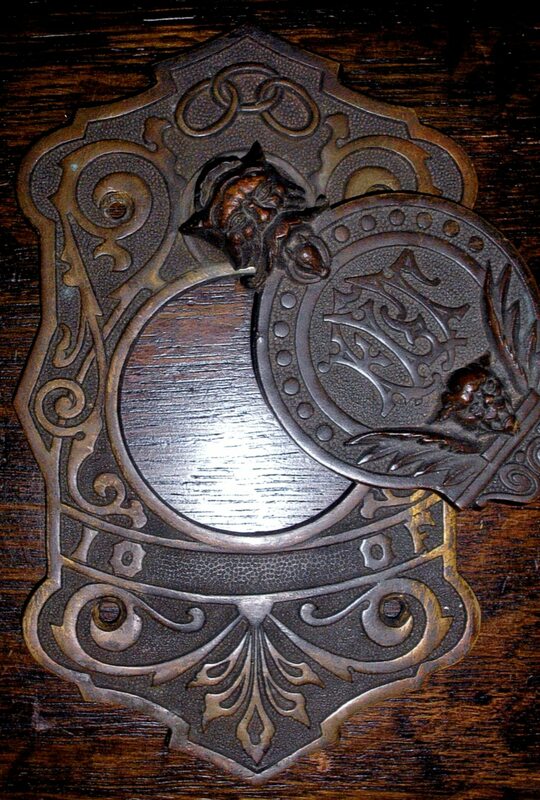 They appear very steampunk and yet they were manufactured before there was such a thing as steampunk. 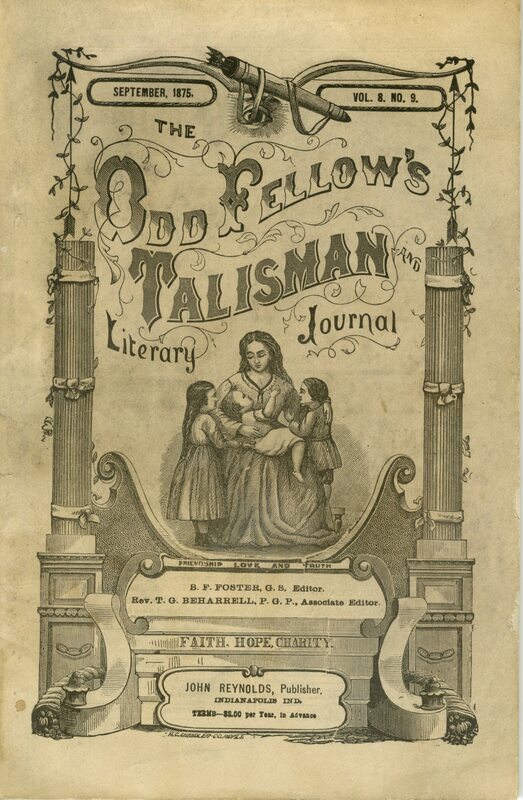 The Odd Fellows is a secret society formed in 1819 in the United States. My book was released on December 16, 2013. 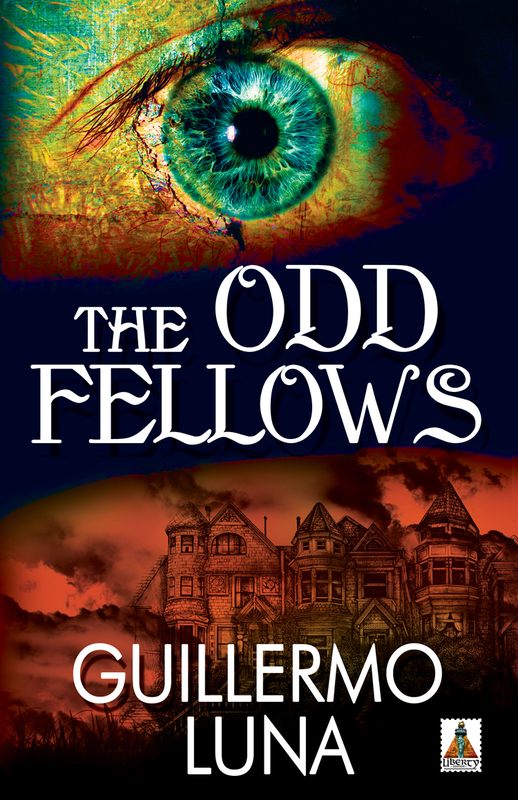 It’s called The Odd Fellows. This is the cover of my book. My books showed up. This photo was taken moments after I opened the box. I’m very happy. 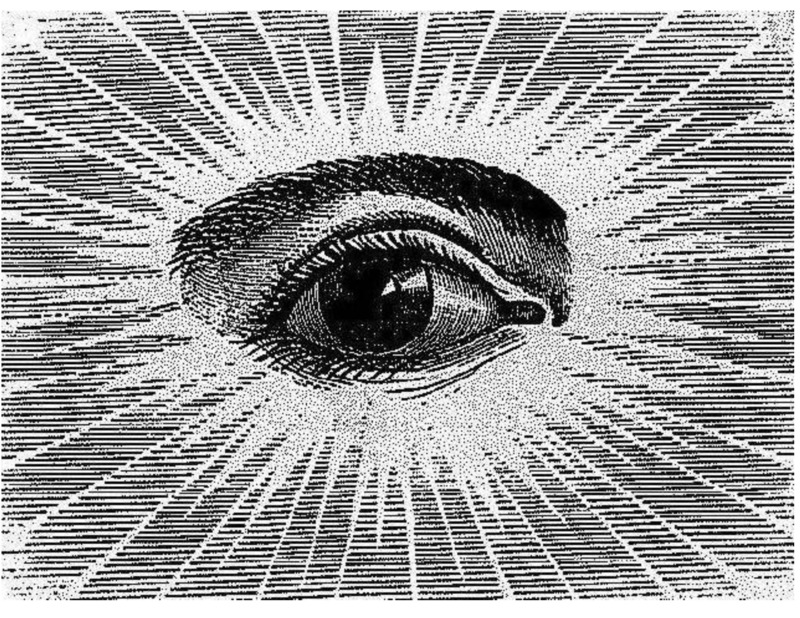 This is the All Seeing Eye. It’s God’s Eye. 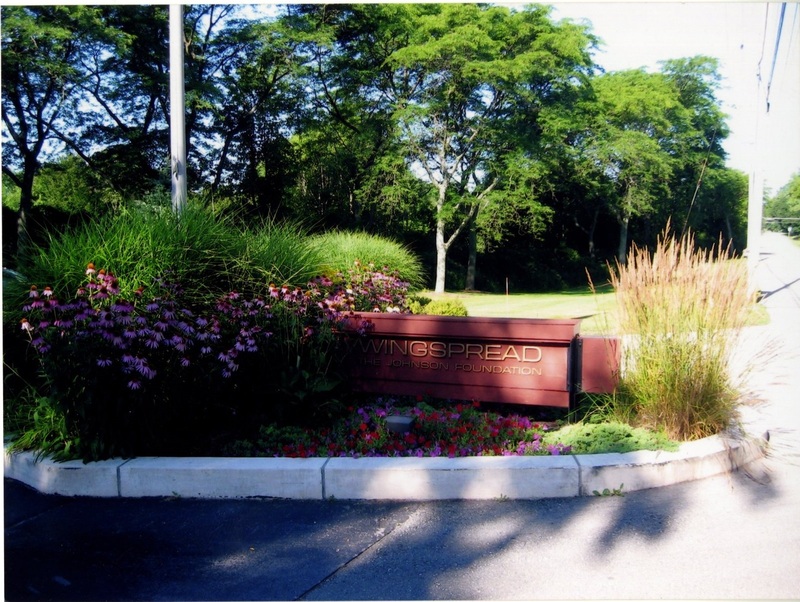 When I submitted my book to my publisher I used this image with chapter 1: The Dead Body. 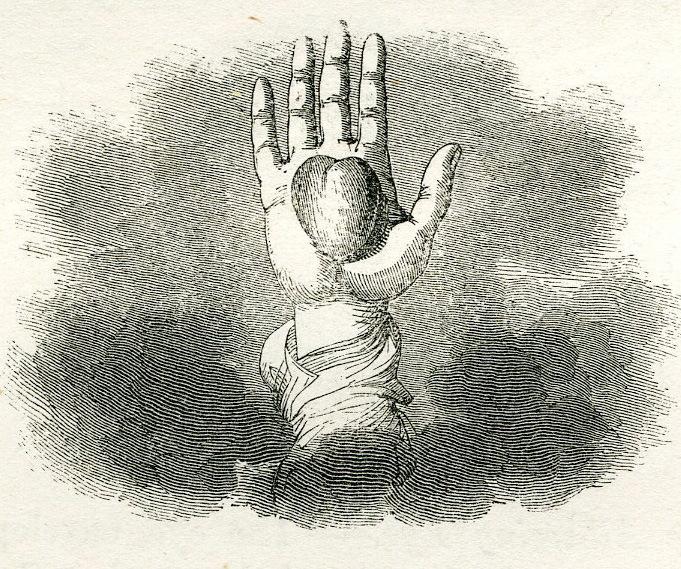 This is the hand with heart. 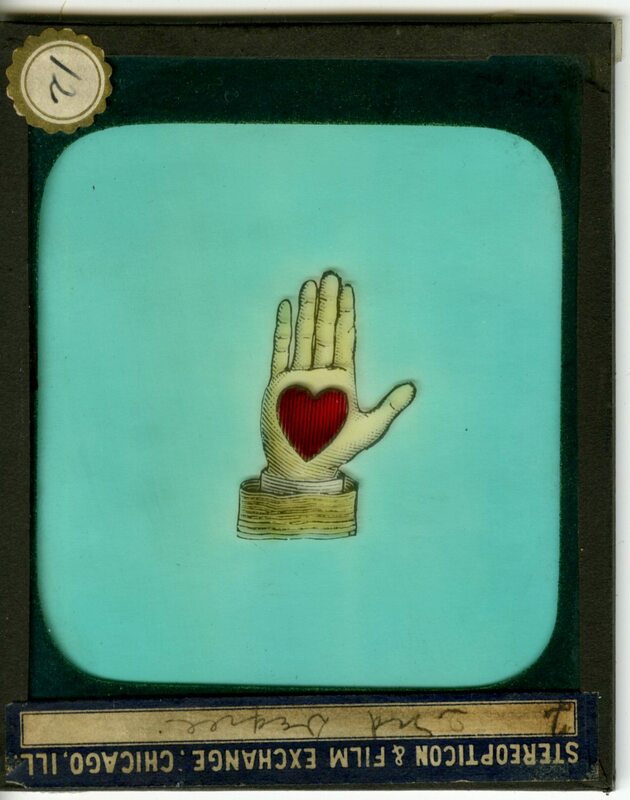 The basic idea behind the hand with heart is that whenever an Odd Fellow extends his hand — the greeting comes from his heart; an Odd Fellow doesn’t shake your hand while thinking about how he’ll stab you in the back. I used this image with chapter 2: Mexico. This symbol is the Bundle of Rods. It symbolizes that a group bound together is stronger than one rod alone. 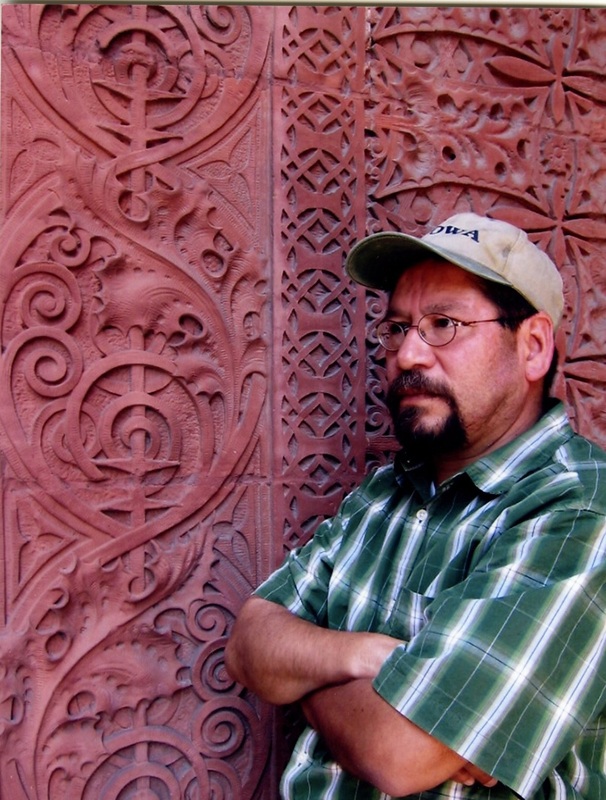 I used this image for Chapter 3: The Road to San Felipe. These are the three links. 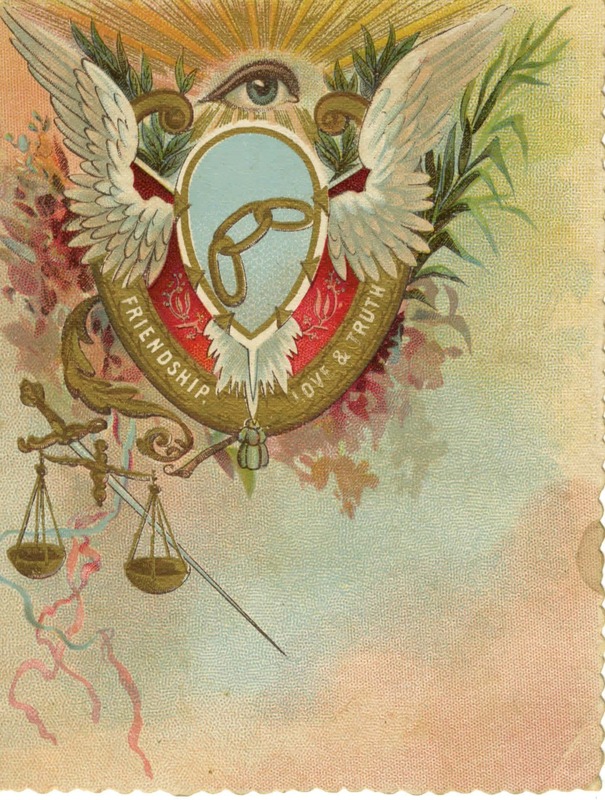 The three links symbolize Friendship, Love and Truth. I used this image with Chapter 4: The Three Links. 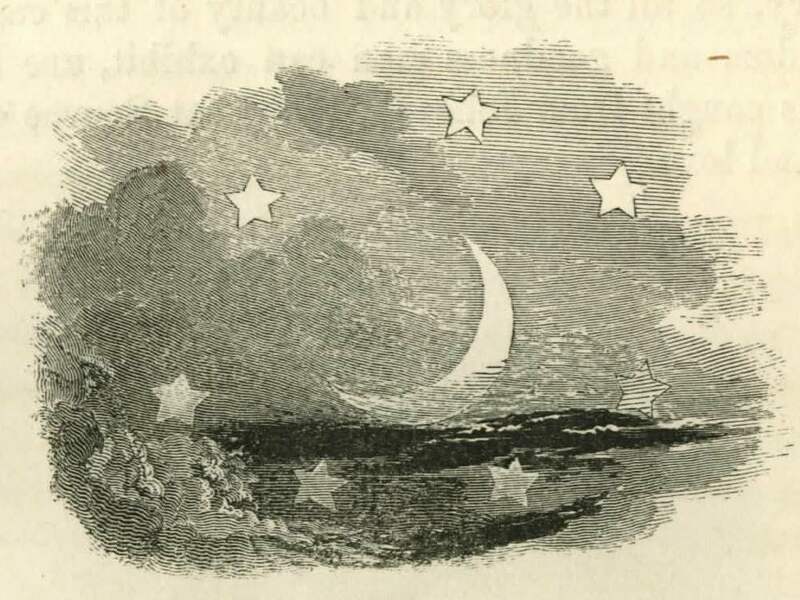 The Moon and the Seven Stars. The seven stars remind us of the seven pillars in the house of wisdom and warn us not to wander starless in the night of destitution. 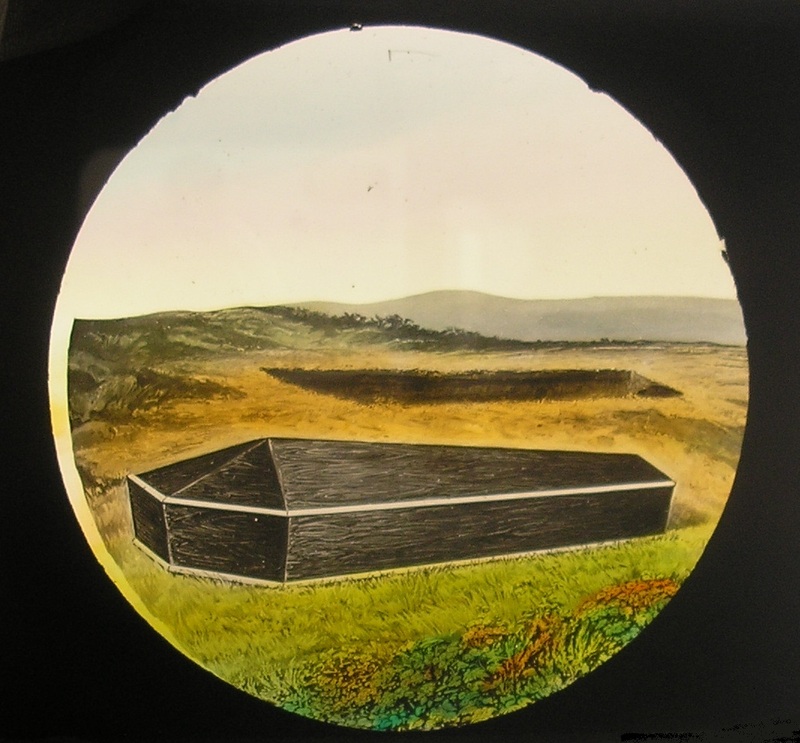 I used this image for Chapter 6: The Disappearance. 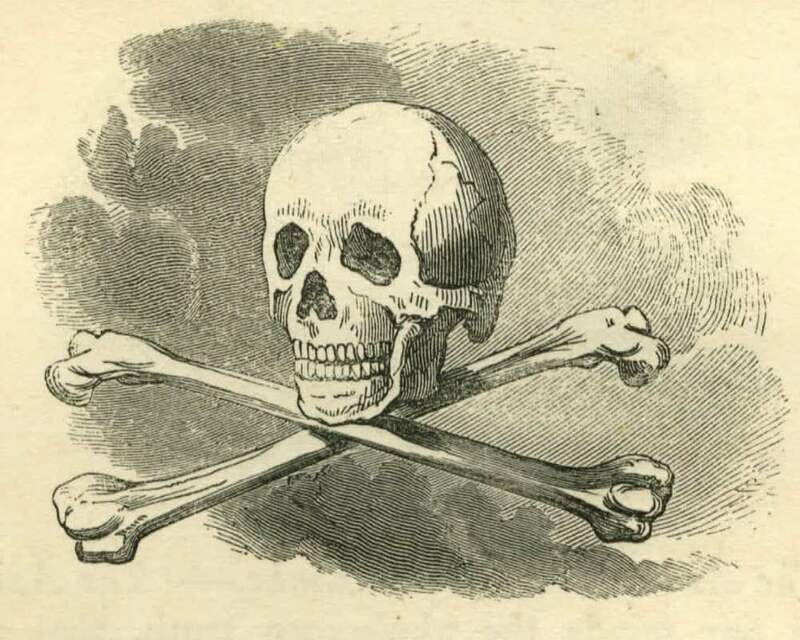 This is the Skull and Crossed Bones. We are all part of the earthly world and must bury the remains of our brothers. I used this image for Chapter 7: The Crucifixion. 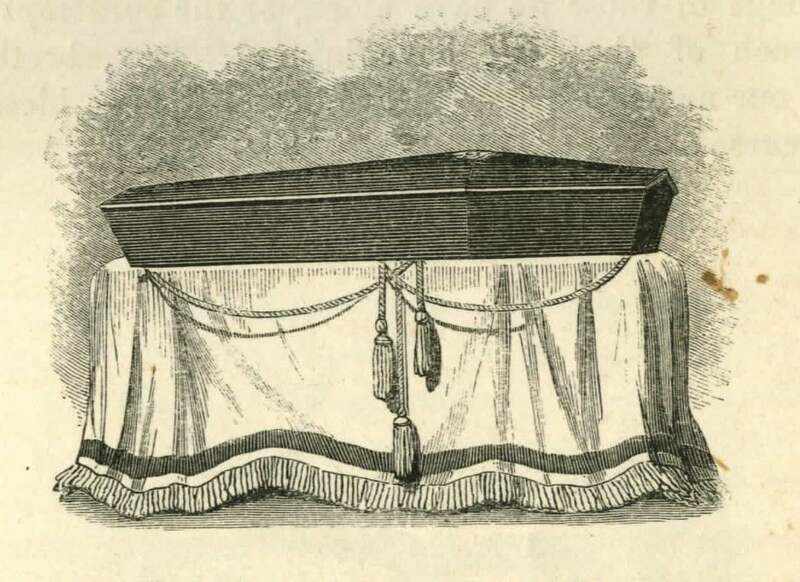 It’s the coffin. 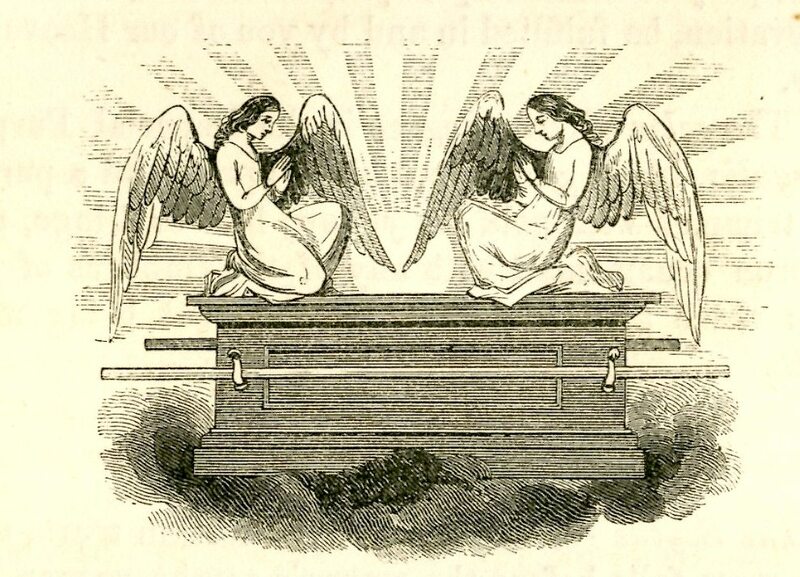 It symbolizes that we all have a date with death — we just don’t know when. I used this symbol for Chapter 8: Bury the Dead. 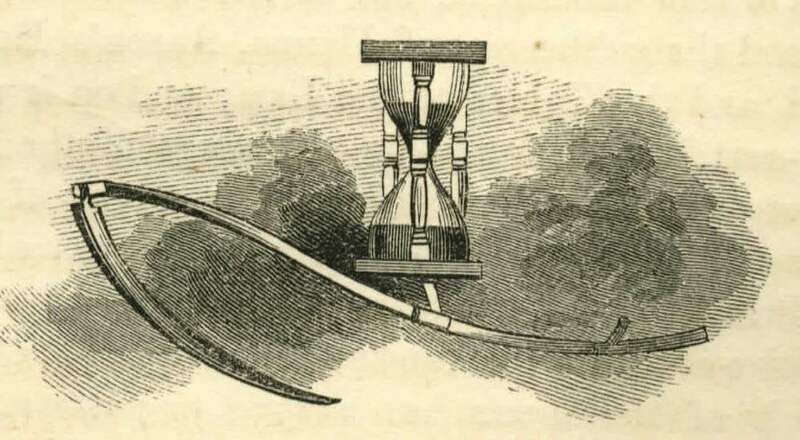 This is the hourglass and scythe. 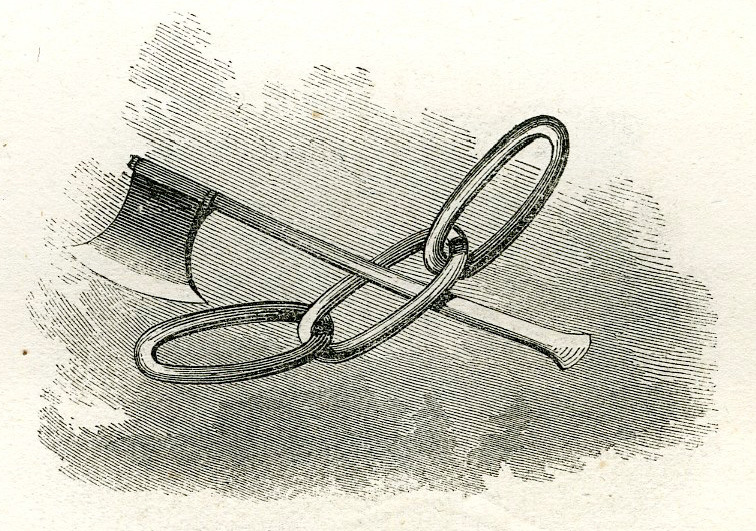 The scythe reminds us that just as hay is cut down by the scythe — likewise man is cut down by time. The hourglass reminds us that time moves quickly. I used this symbol for Chapter 9: Man’s Best Friend. 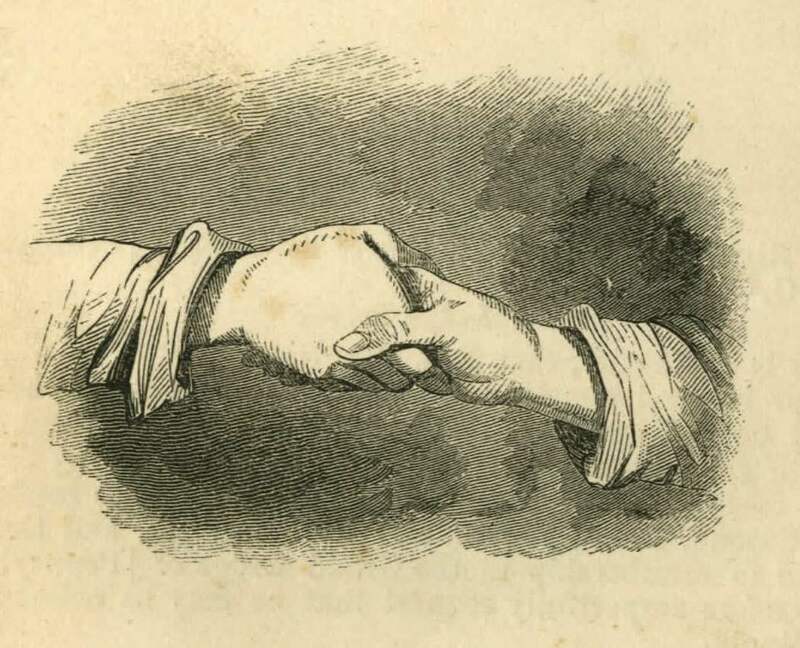 The Shaking Hands of Friendship. I used this symbol for Chapter 11: Three Days Later.